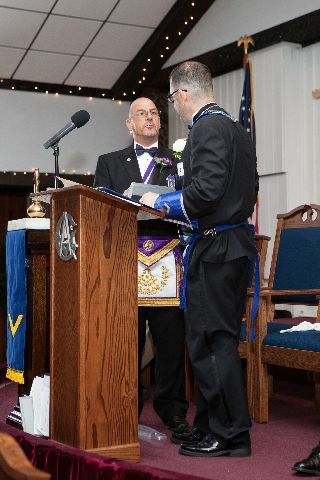 It was a historic day. 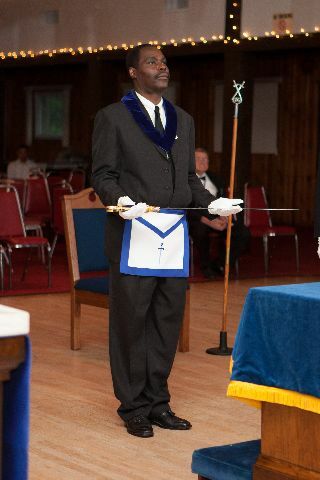 On June 12th, our own Bro. 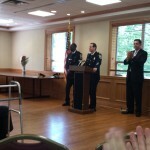 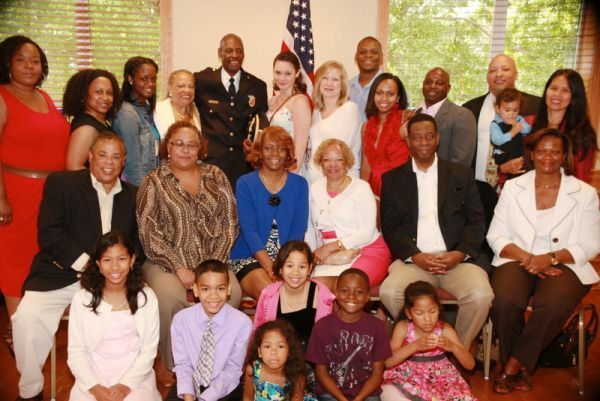 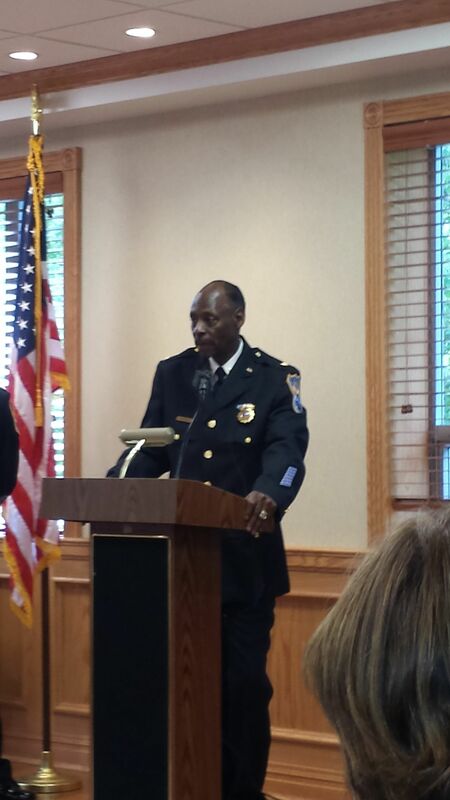 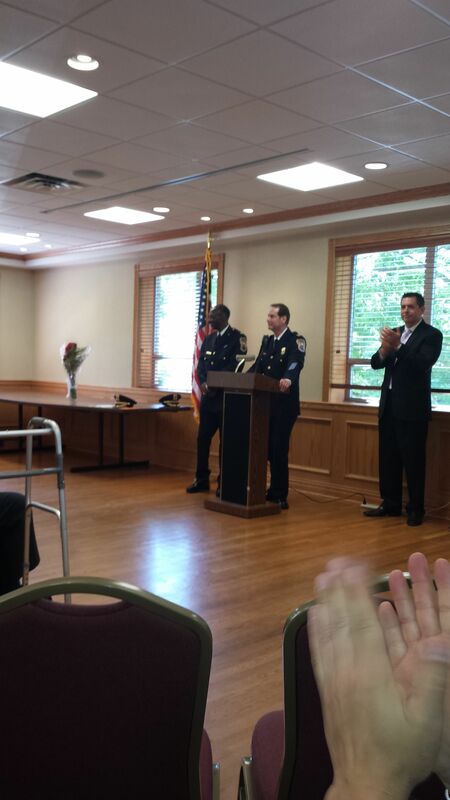 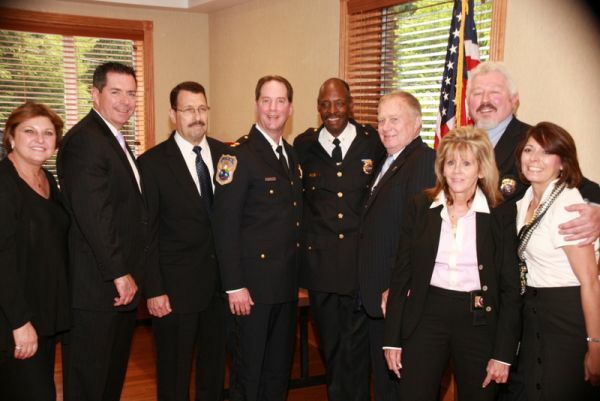 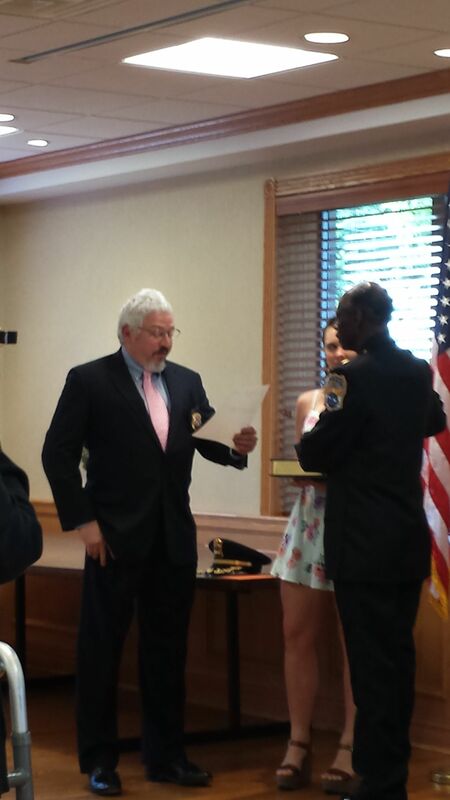 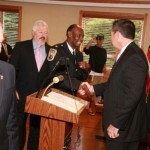 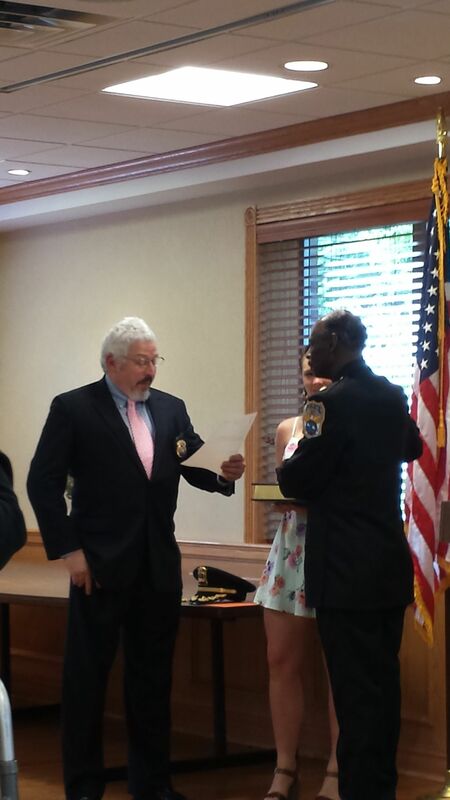 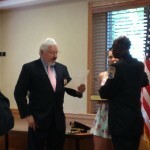 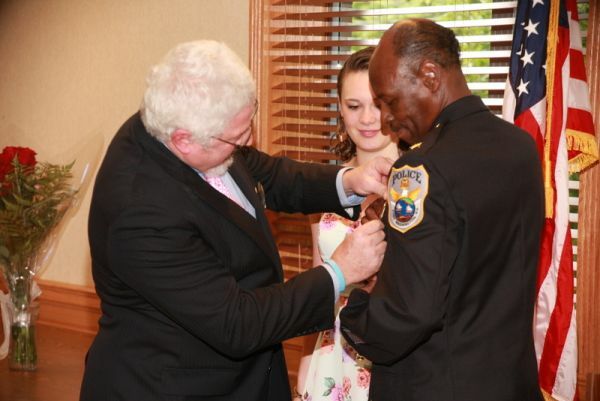 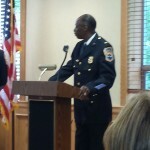 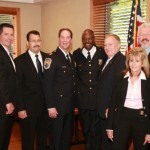 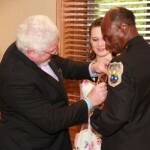 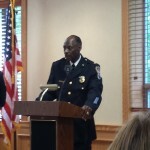 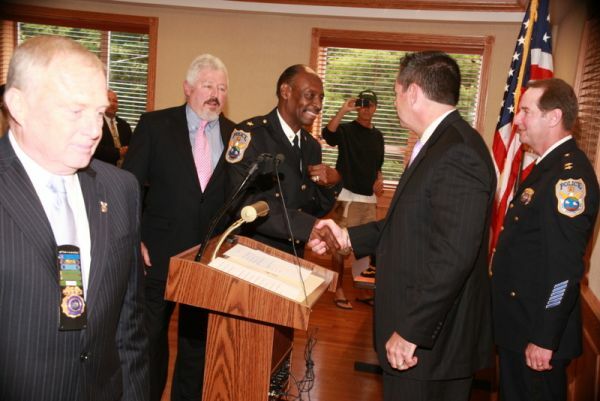 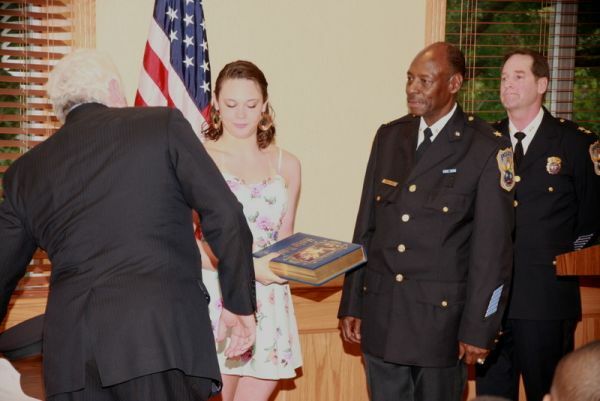 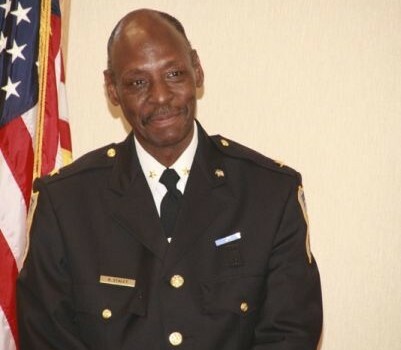 Brian Staley was sworn in as Deputy Chief of Police for the Port Washington Police Department. 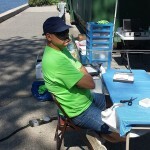 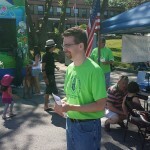 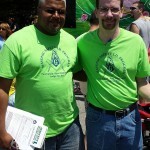 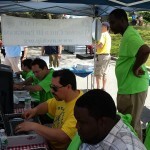 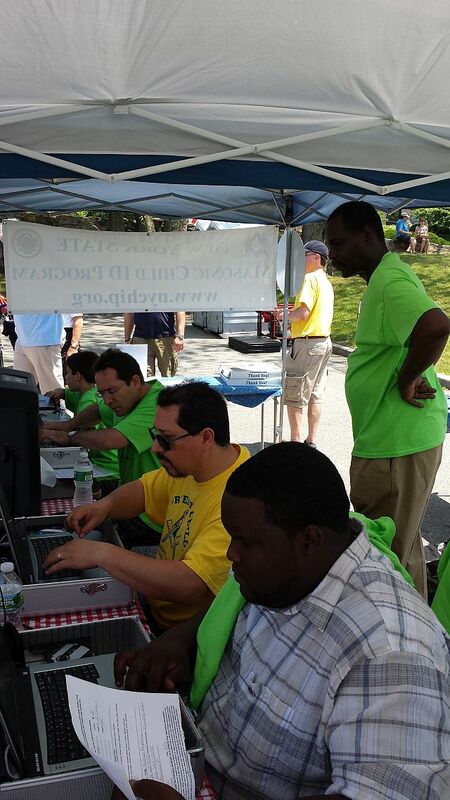 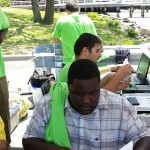 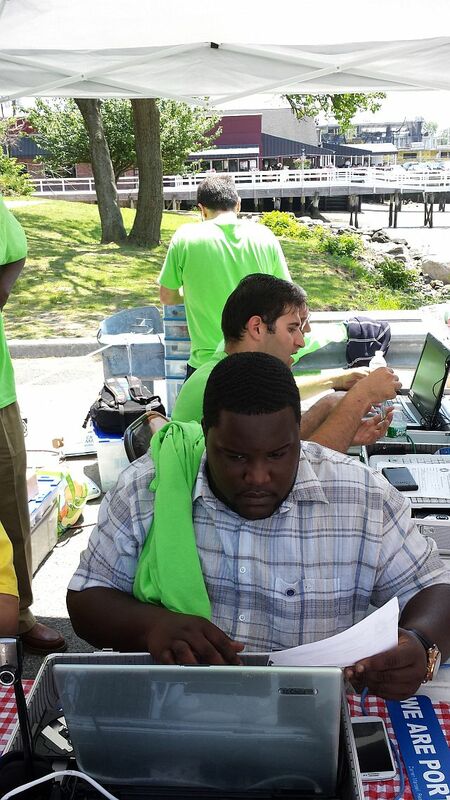 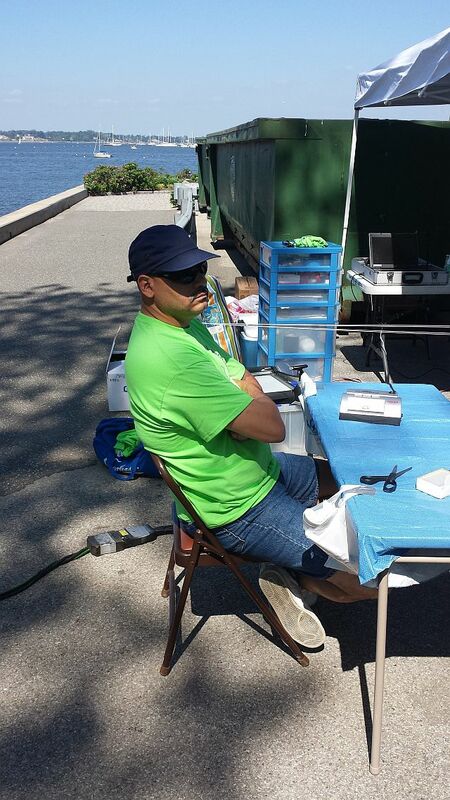 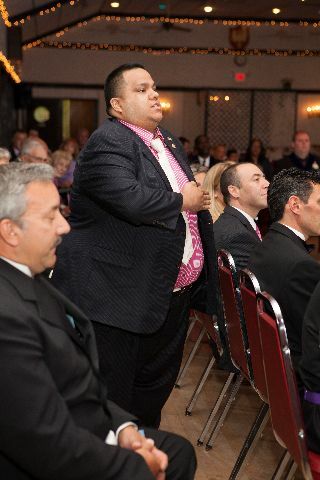 Brian is the first African-American to hold this position in the precinct. 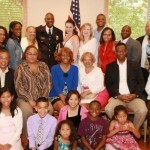 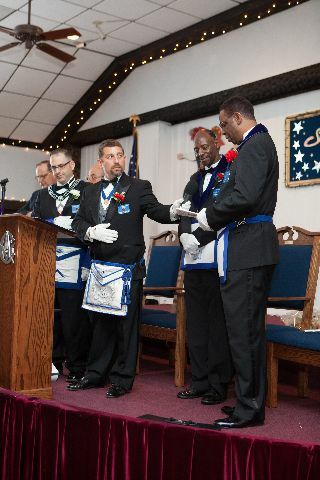 There was a good showing of brothers at his swearing in. 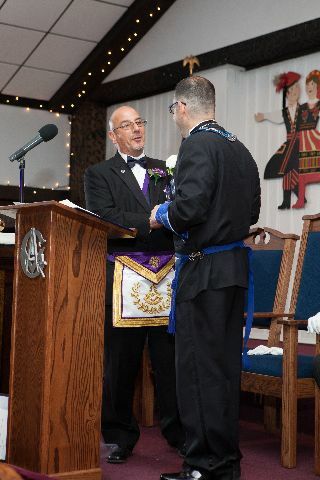 Congratulations Bro. 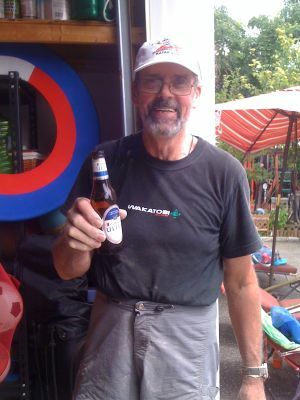 Brian. 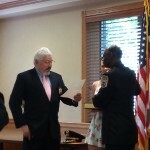 It is a well deserved promotion. 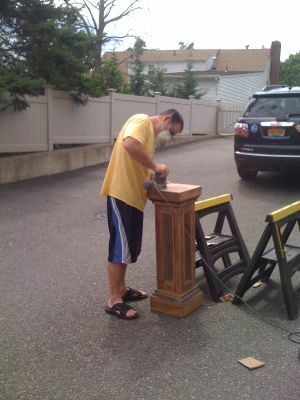 Sometimes charity begins at home. 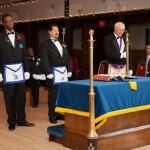 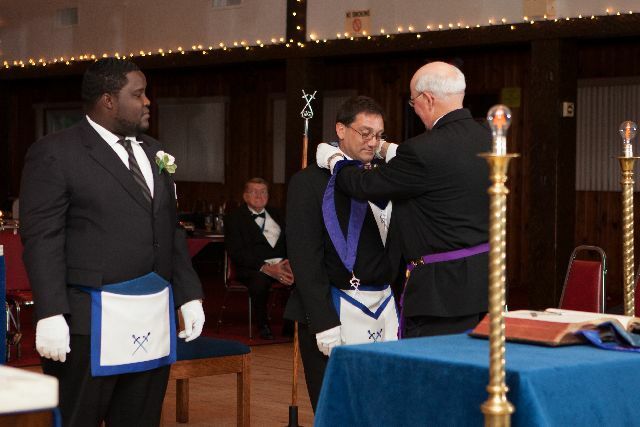 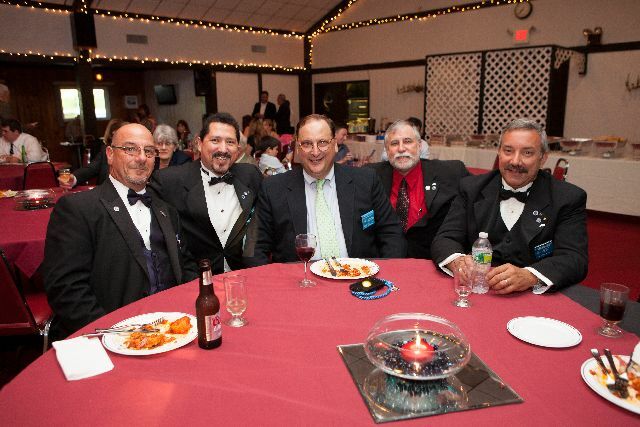 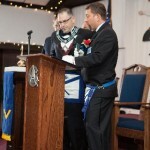 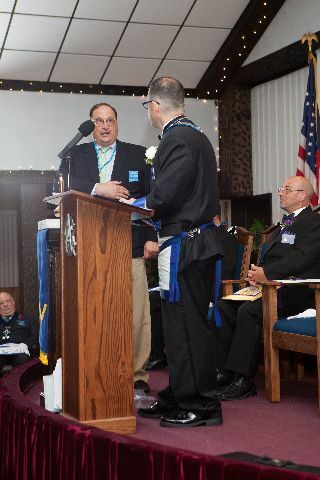 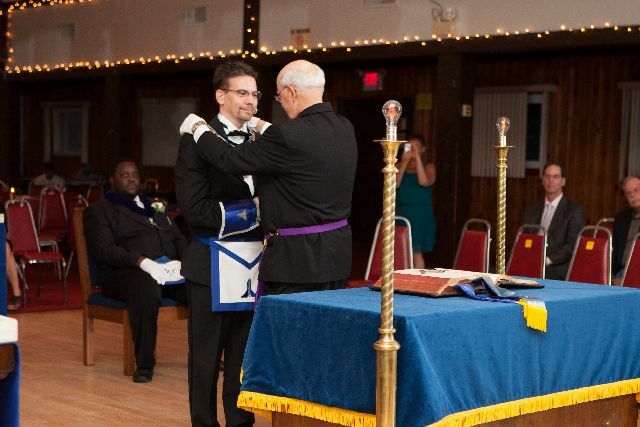 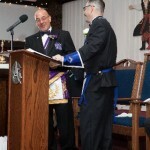 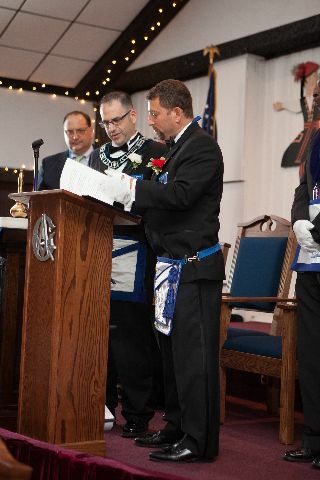 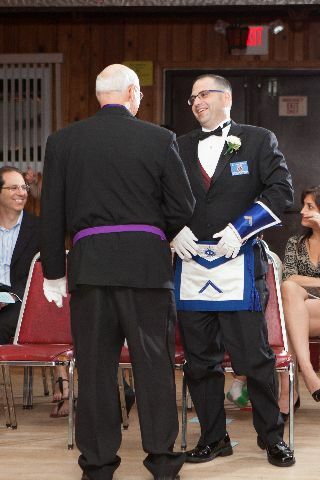 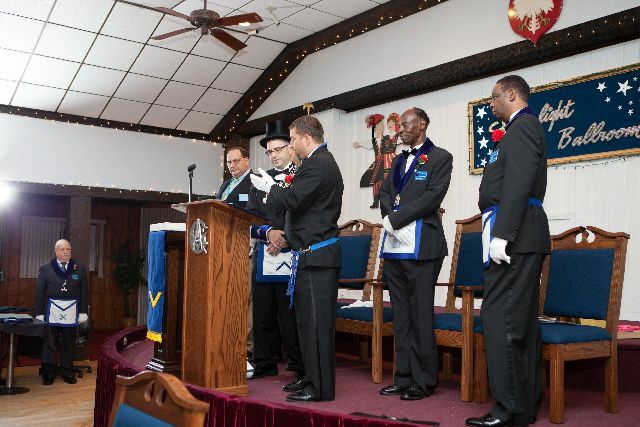 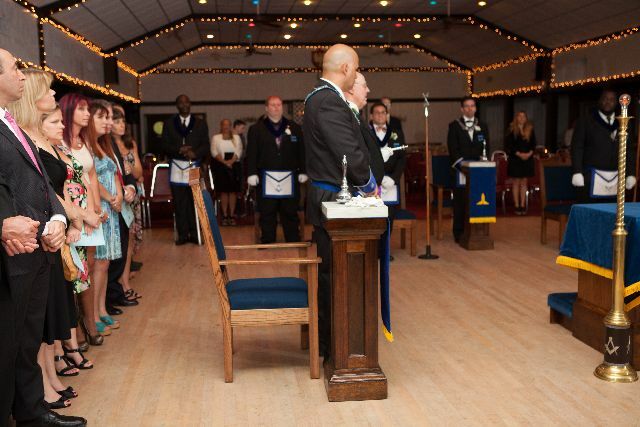 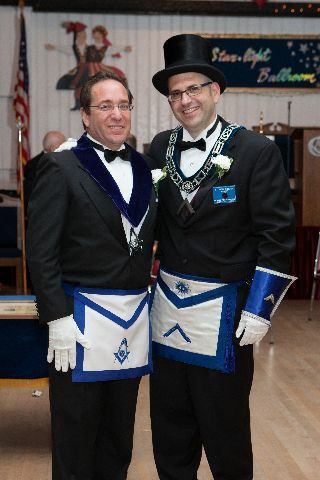 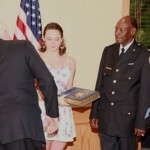 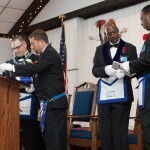 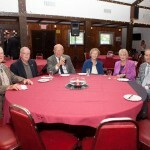 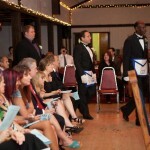 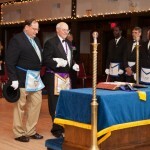 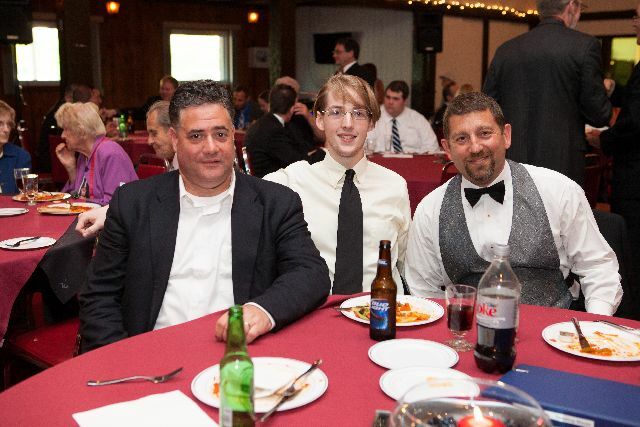 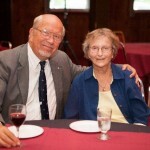 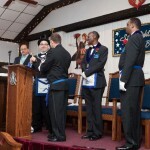 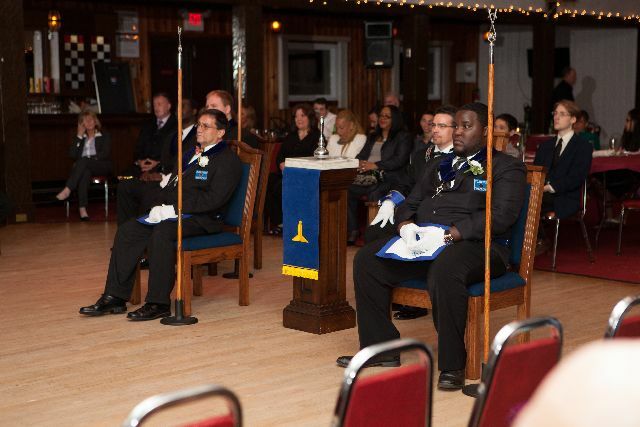 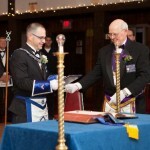 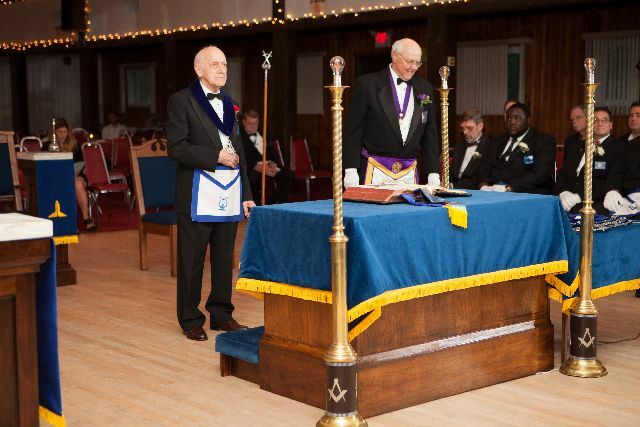 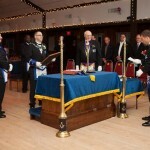 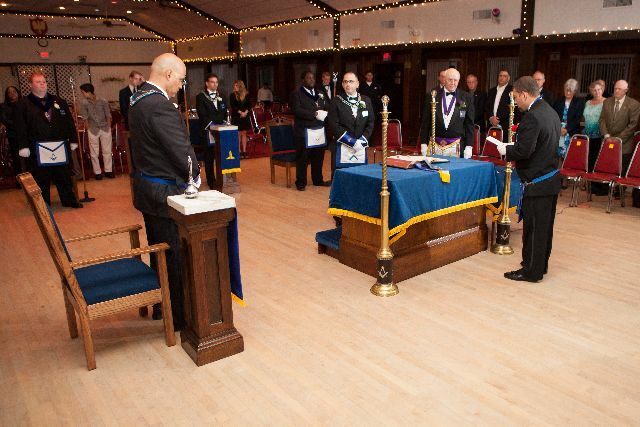 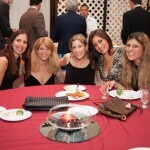 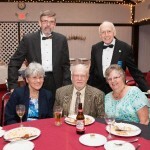 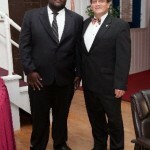 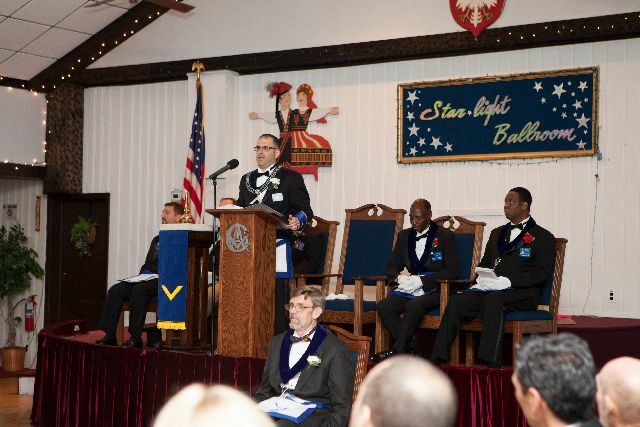 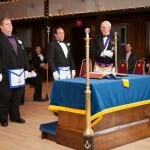 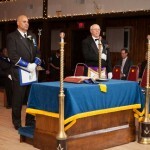 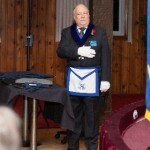 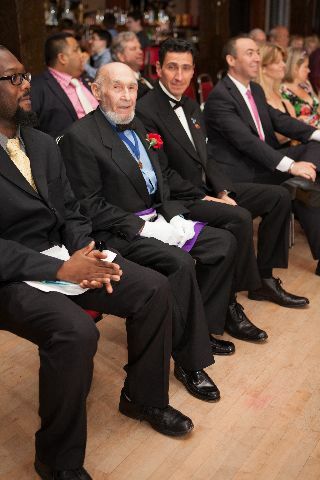 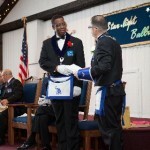 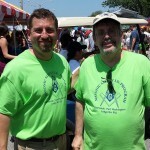 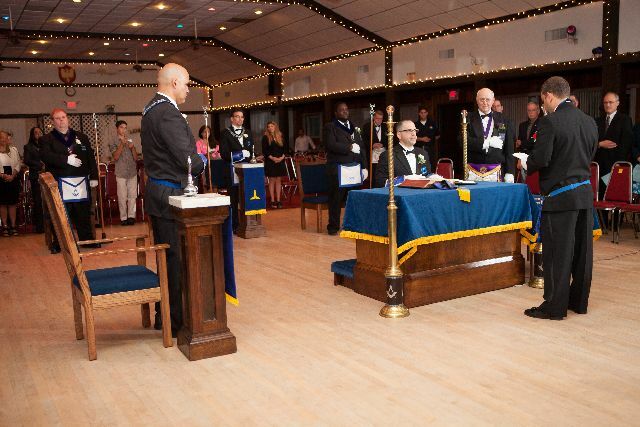 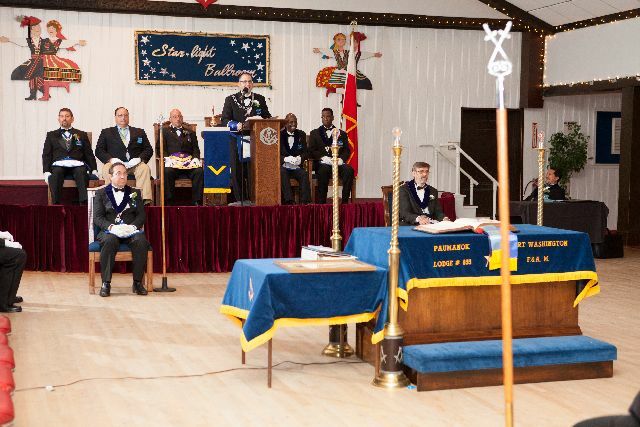 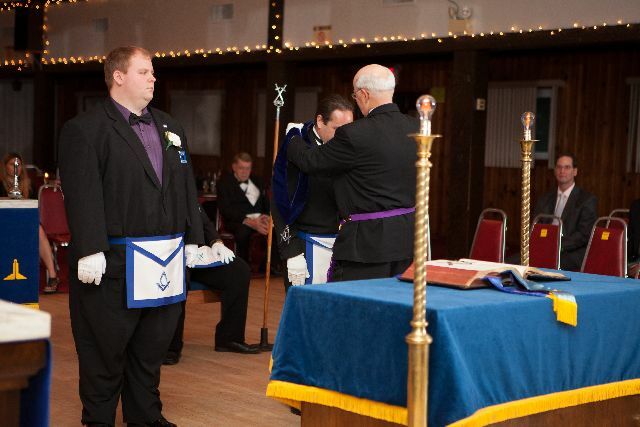 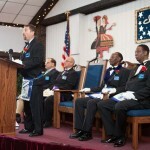 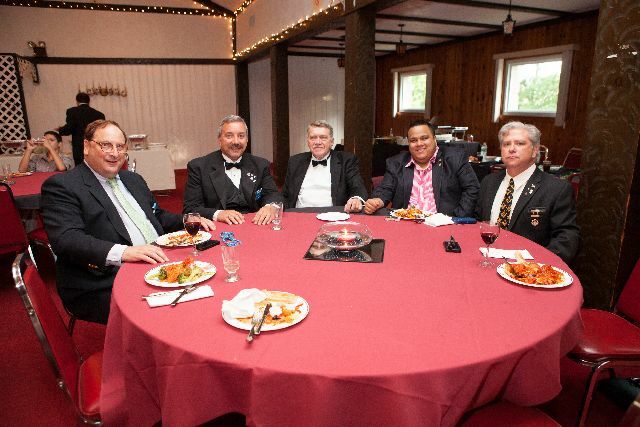 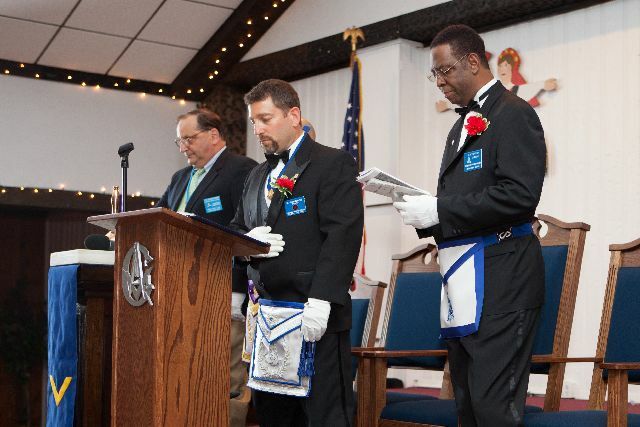 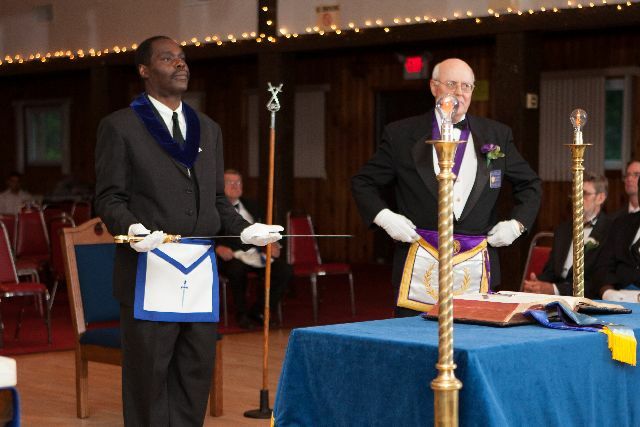 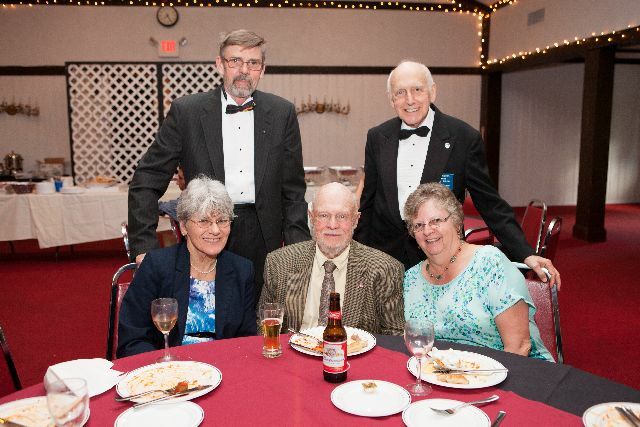 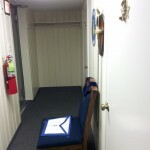 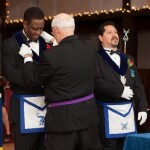 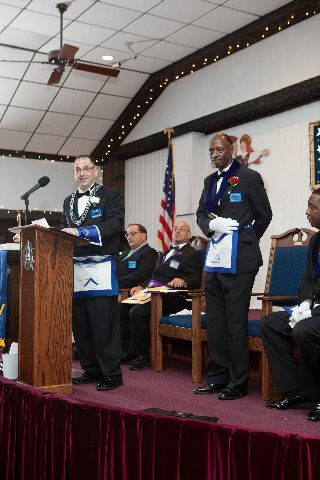 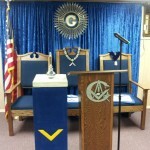 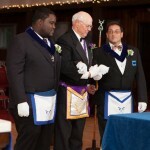 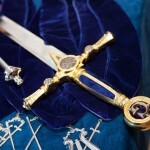 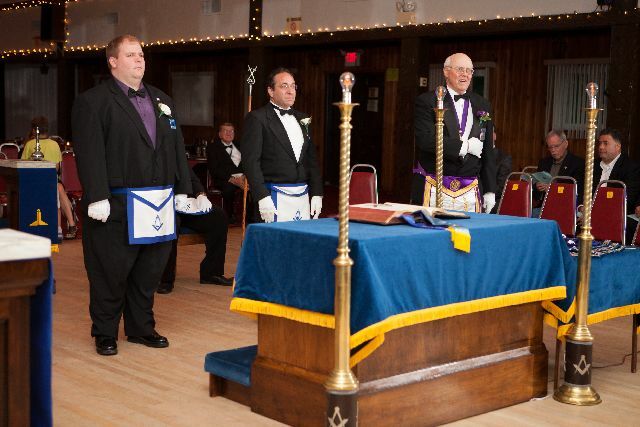 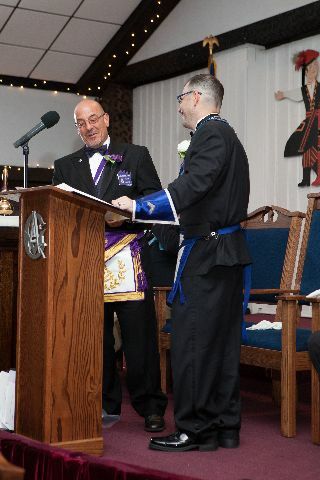 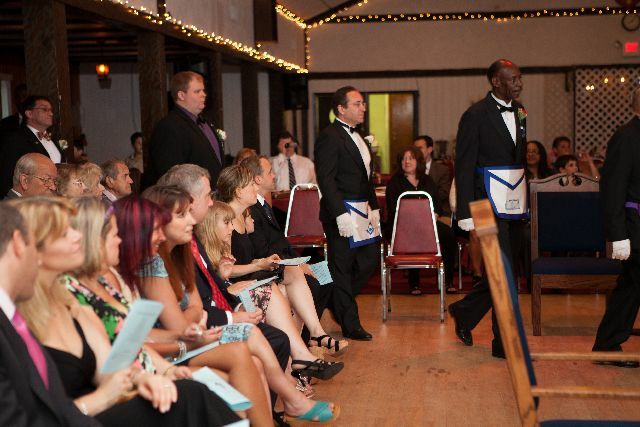 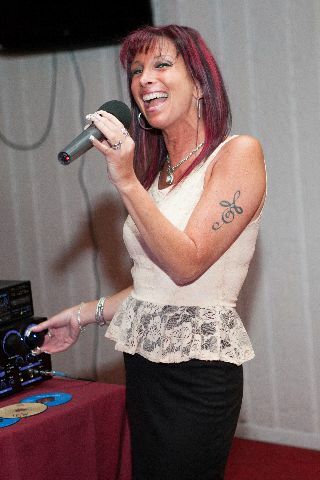 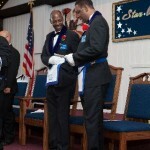 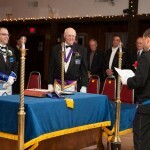 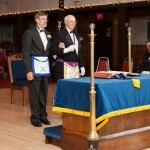 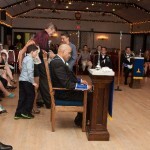 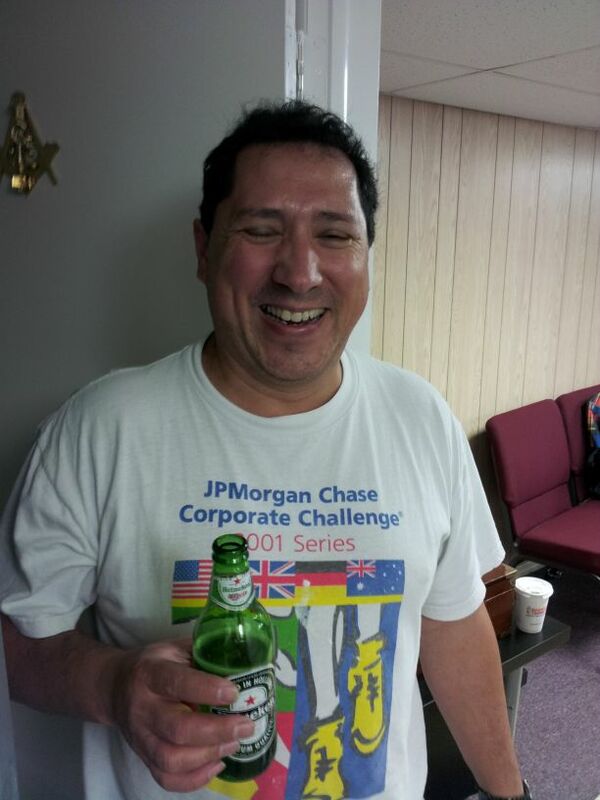 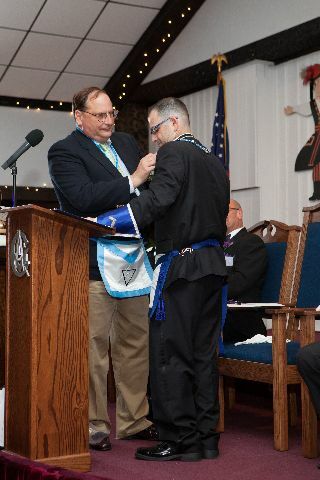 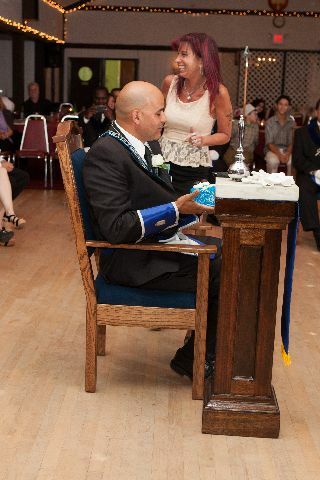 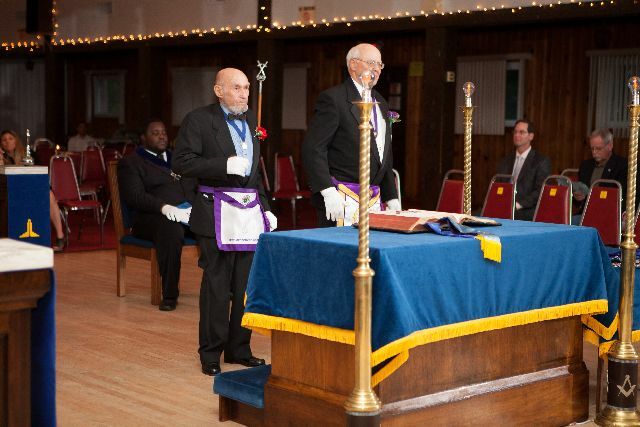 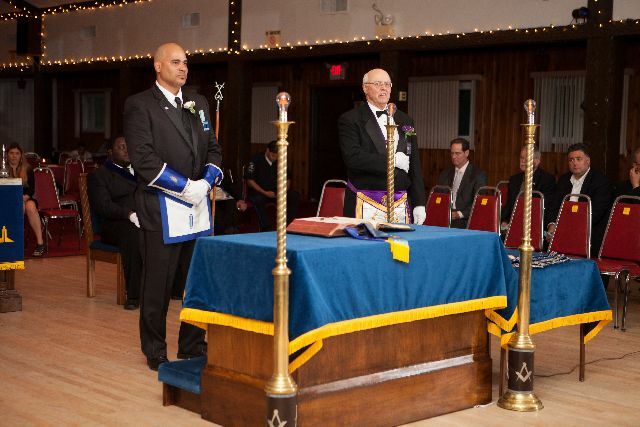 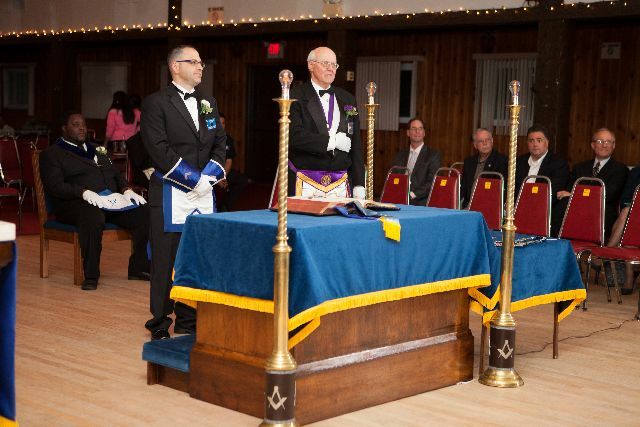 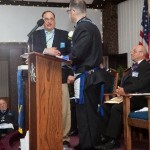 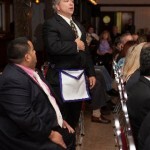 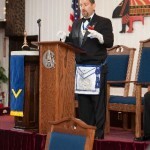 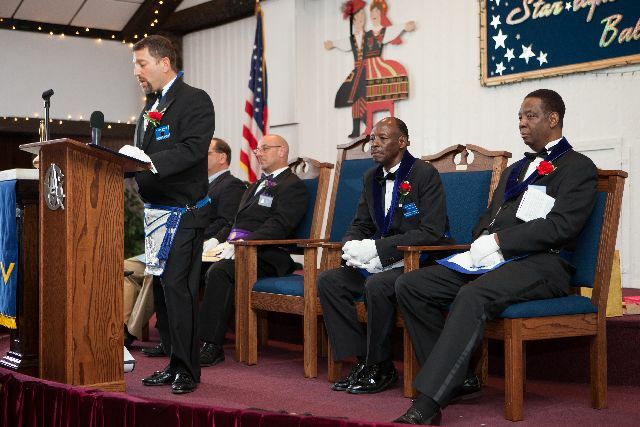 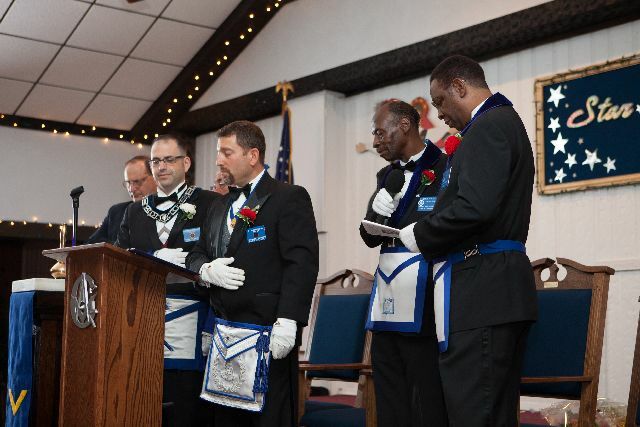 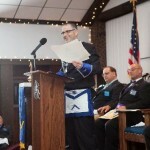 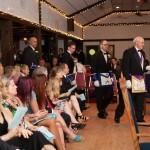 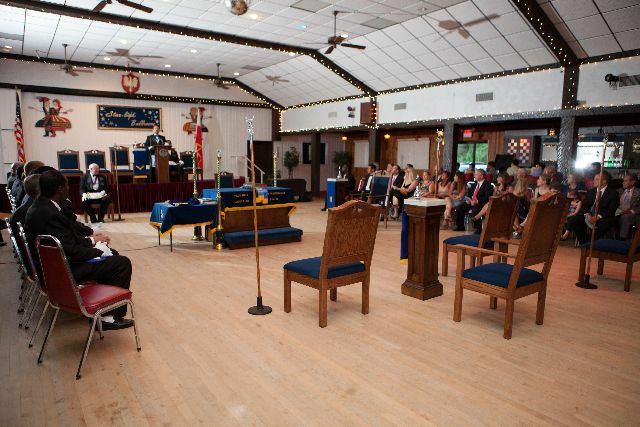 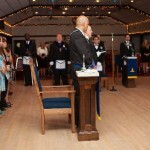 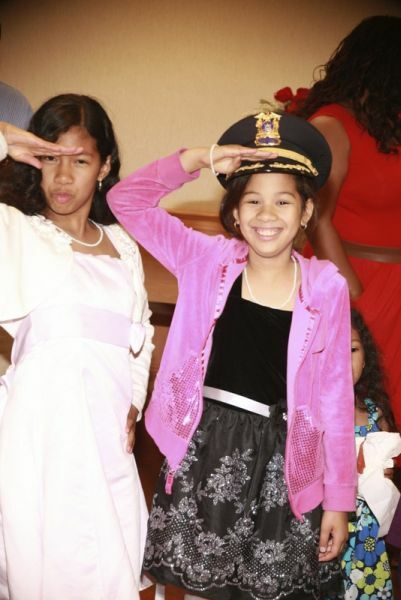 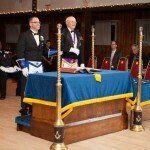 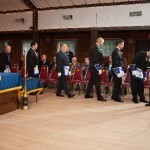 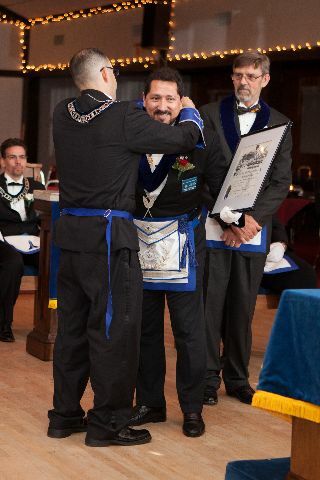 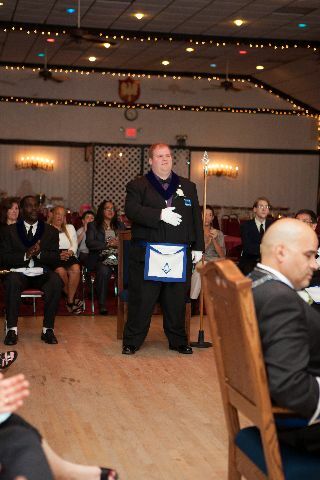 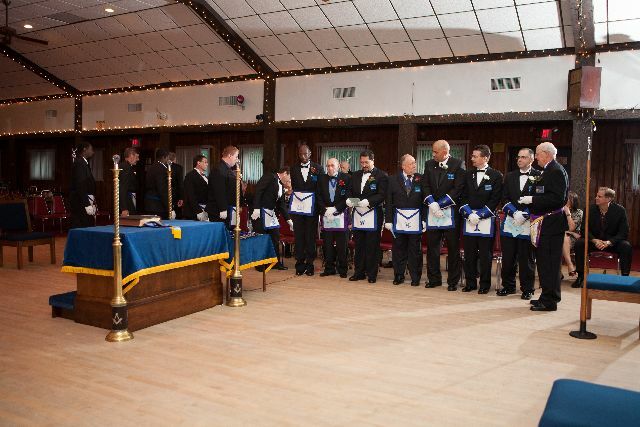 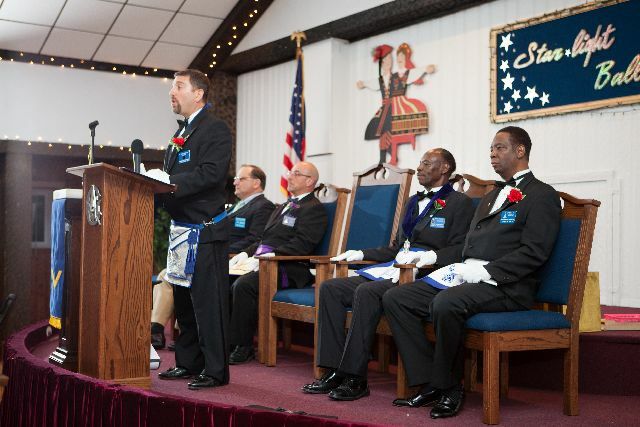 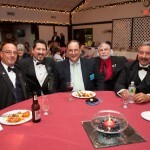 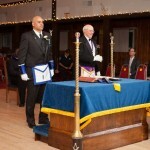 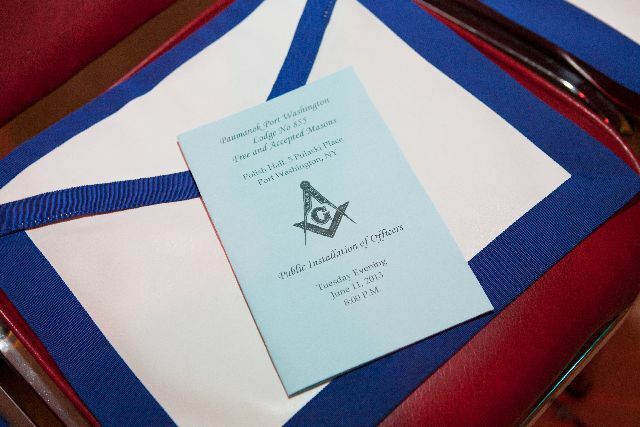 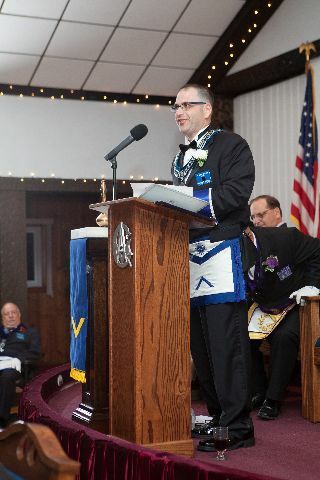 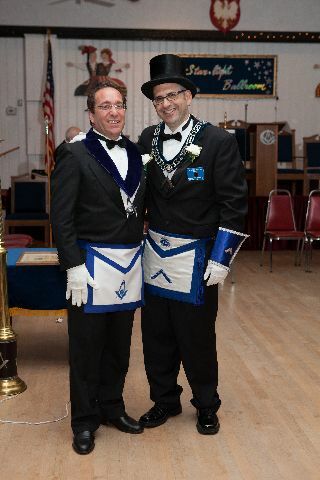 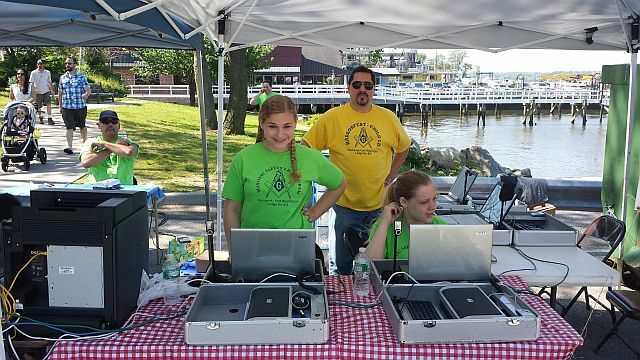 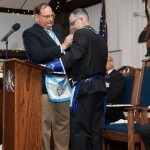 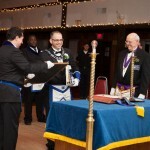 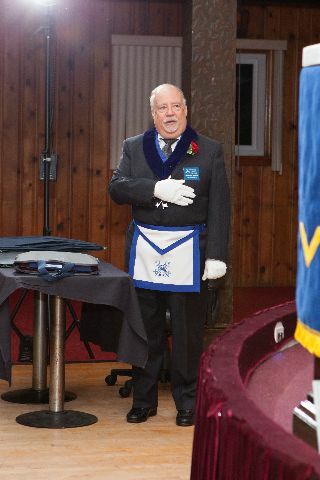 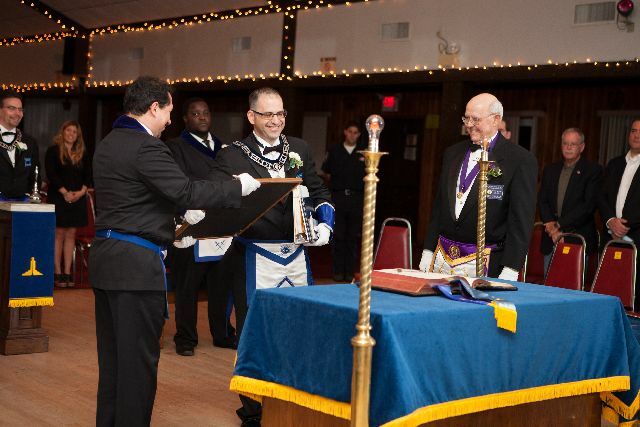 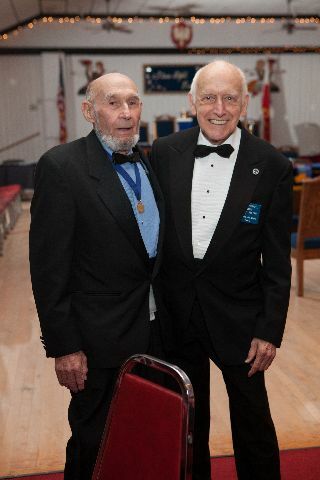 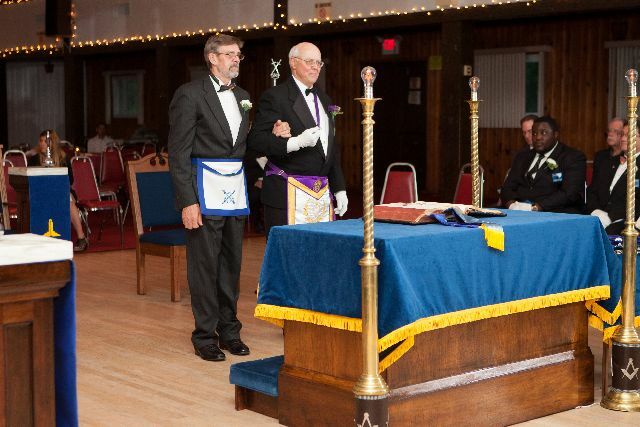 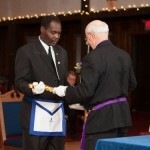 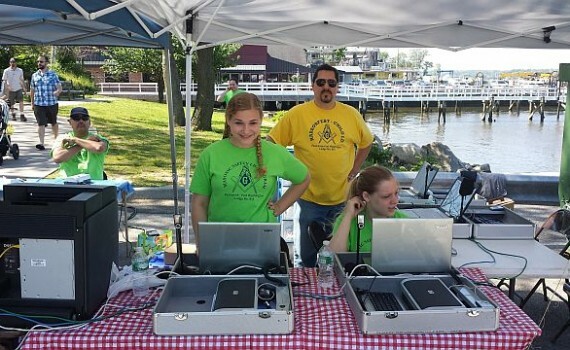 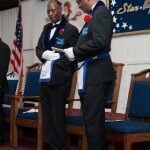 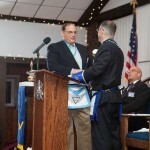 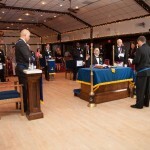 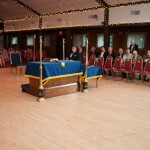 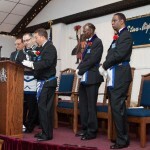 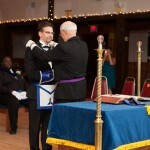 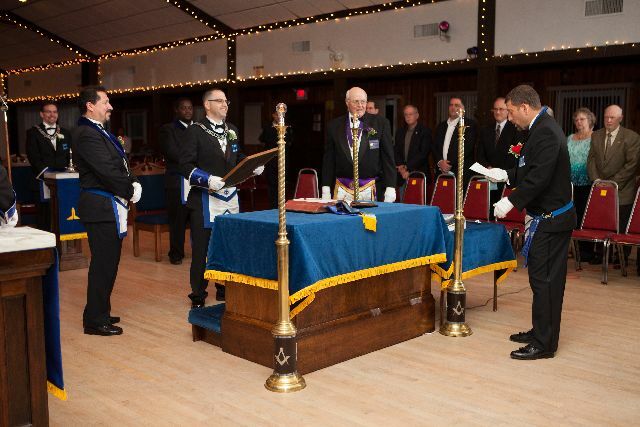 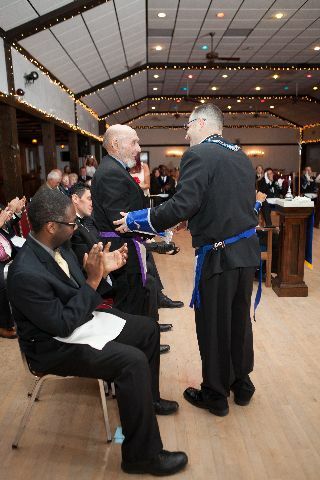 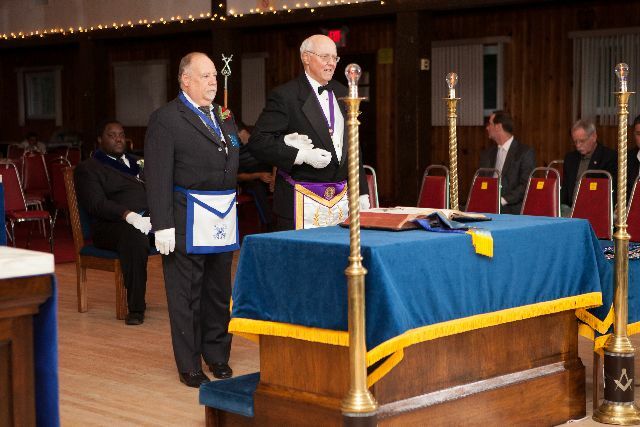 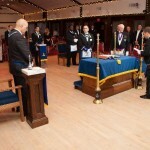 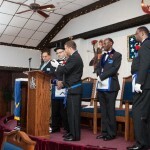 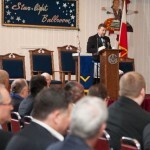 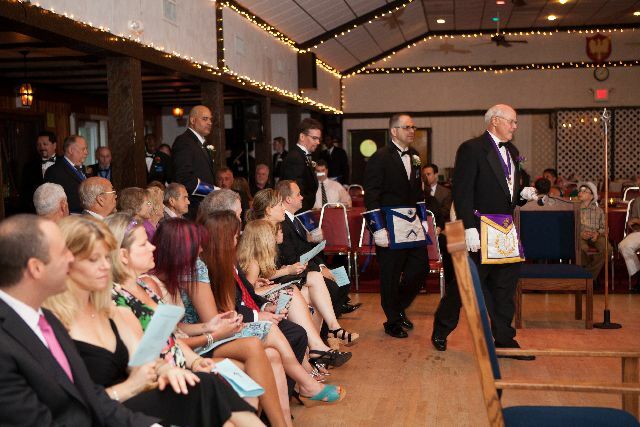 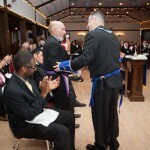 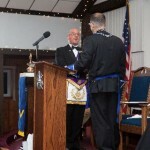 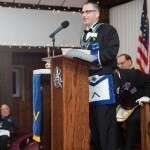 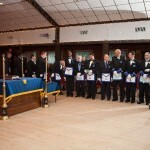 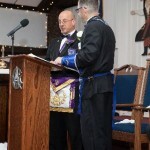 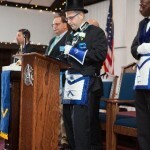 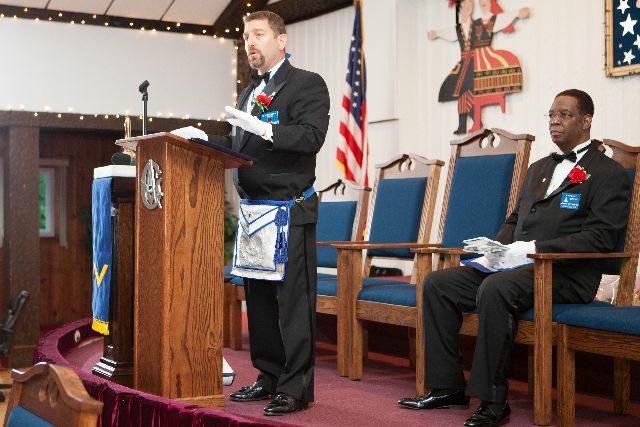 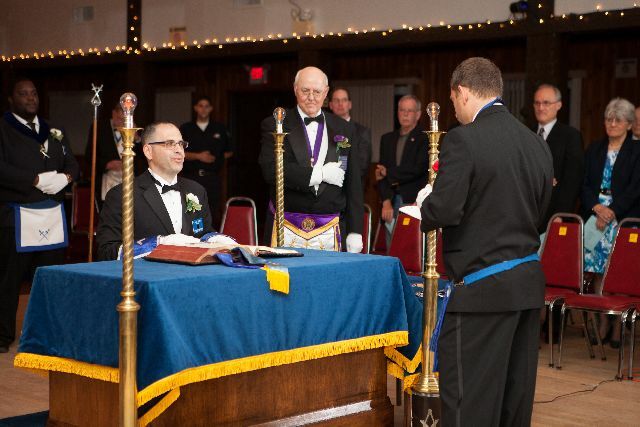 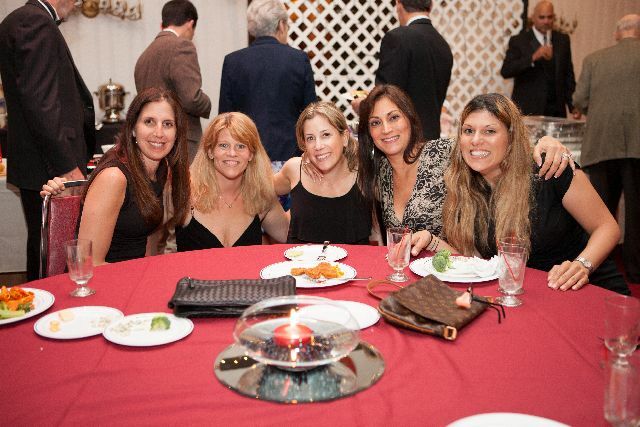 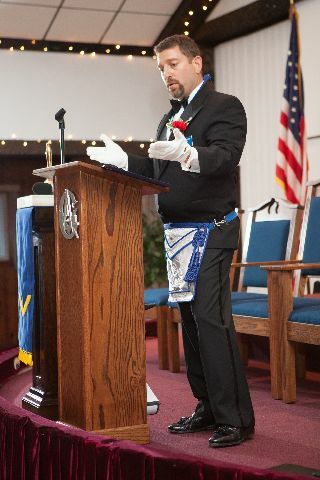 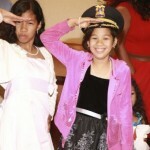 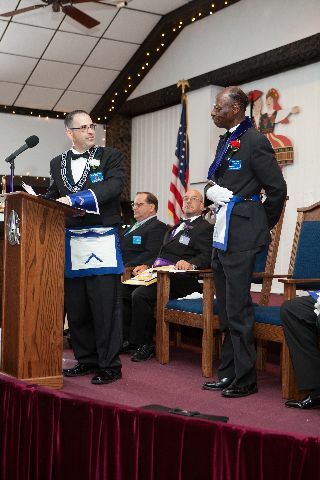 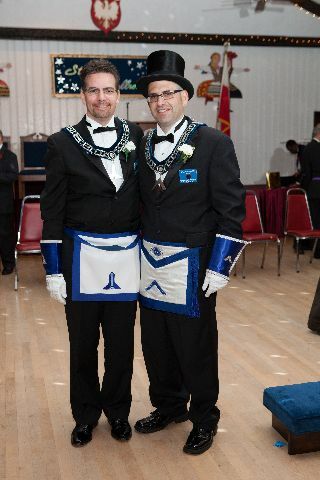 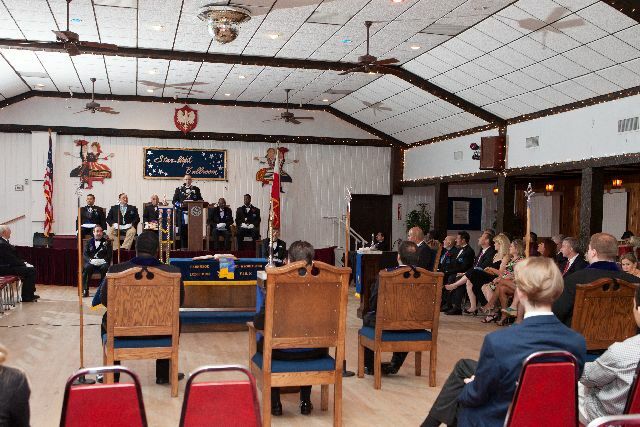 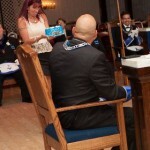 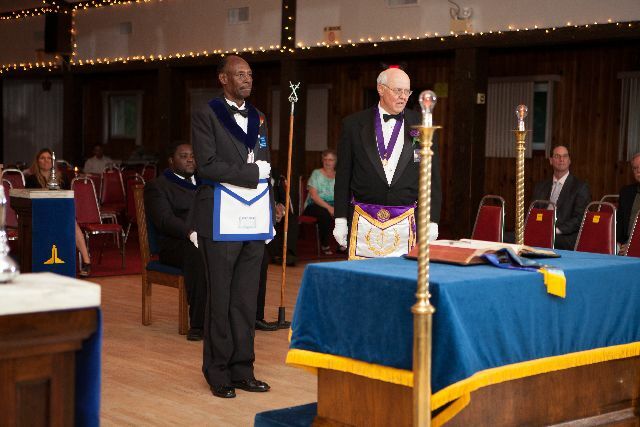 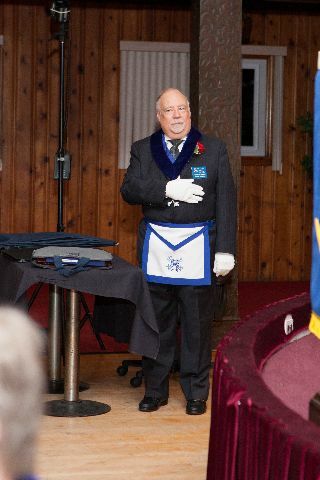 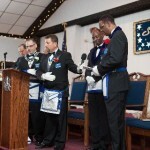 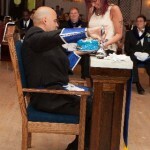 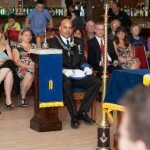 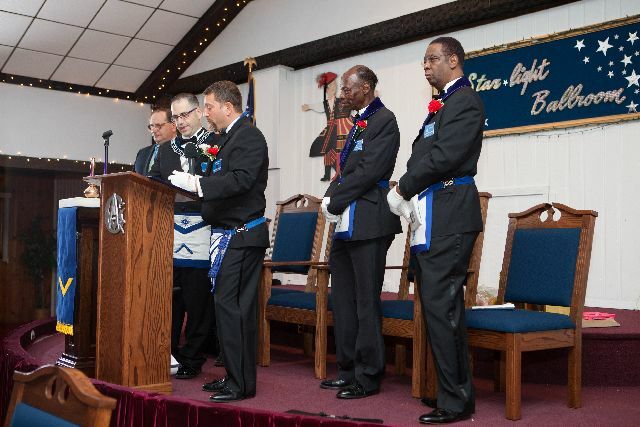 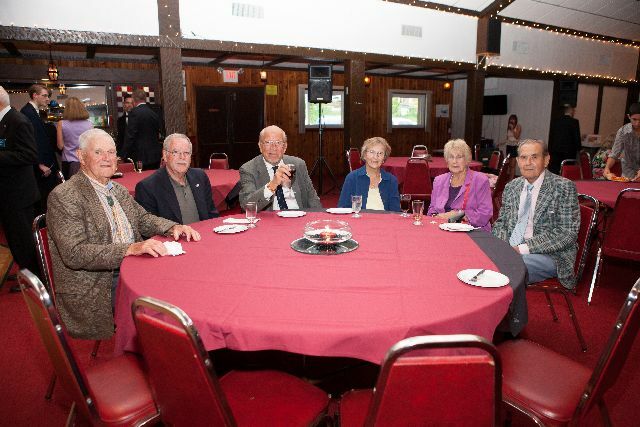 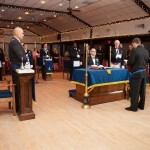 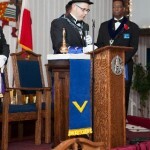 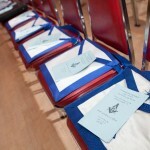 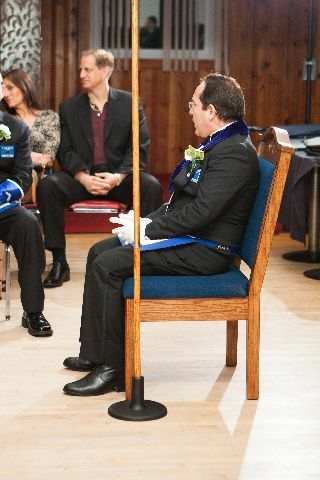 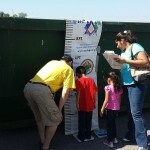 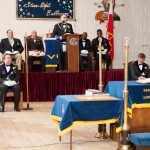 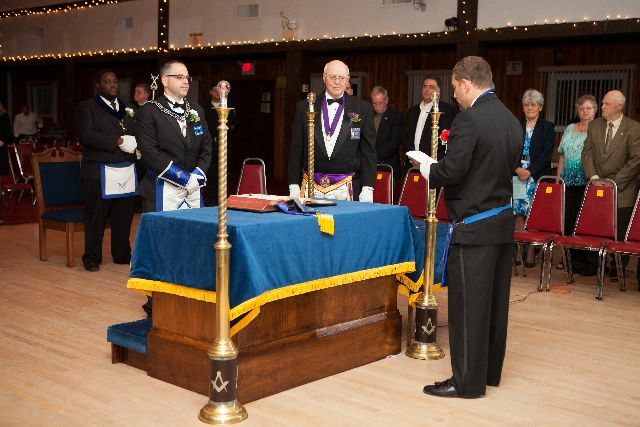 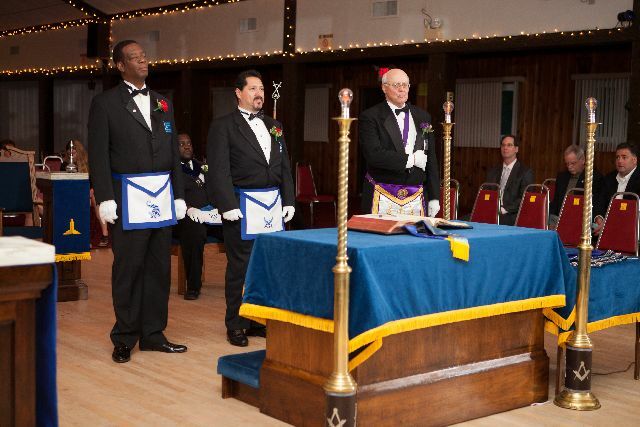 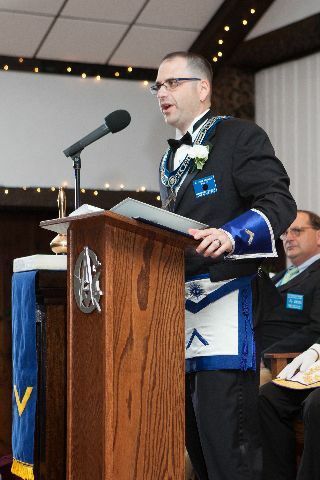 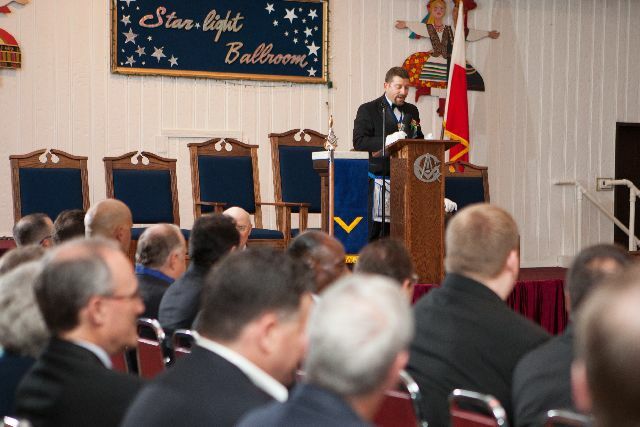 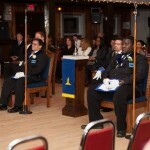 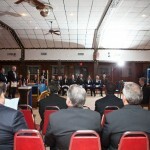 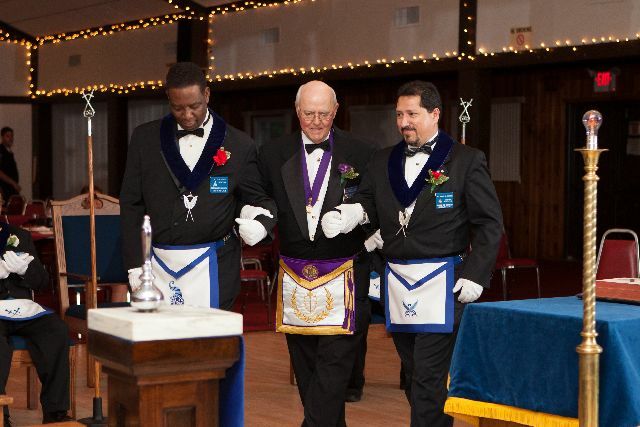 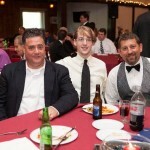 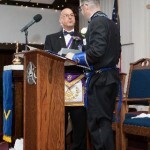 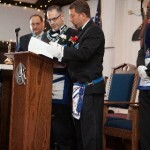 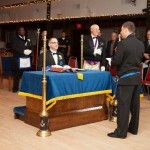 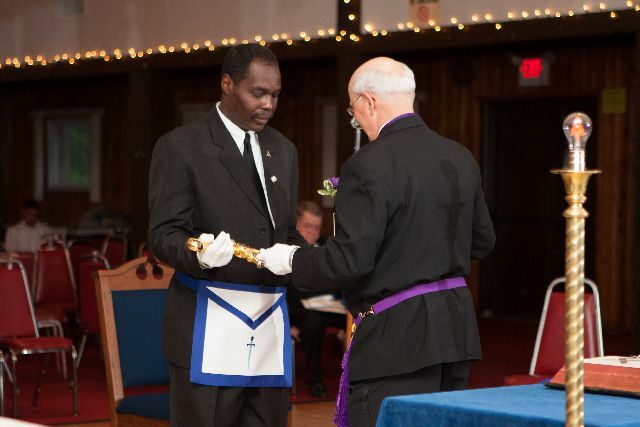 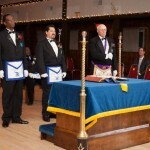 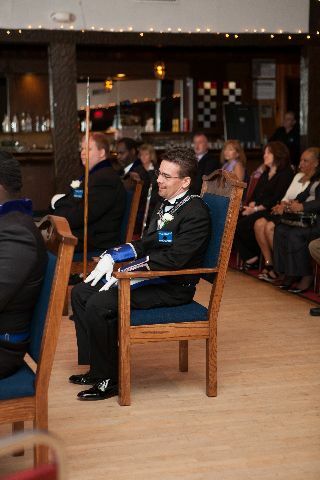 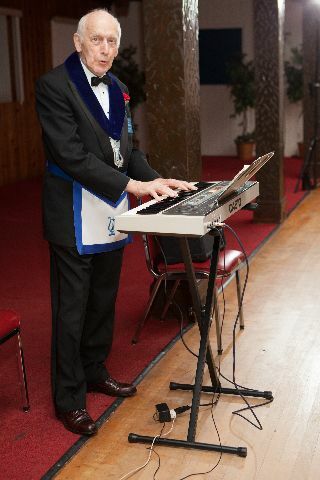 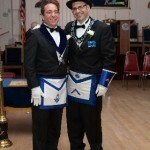 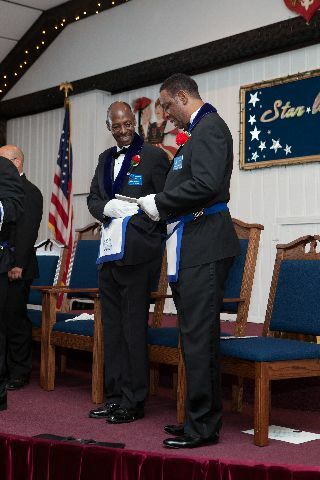 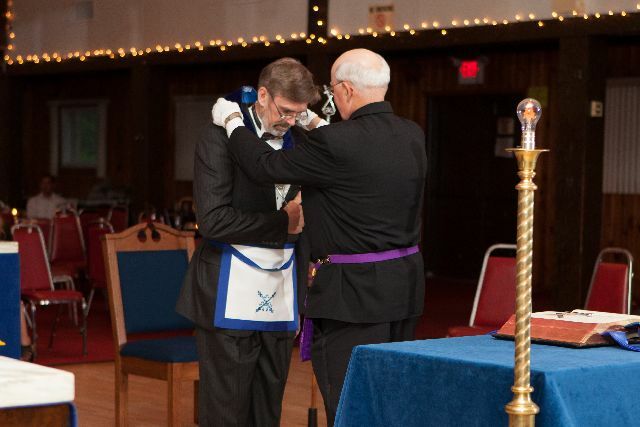 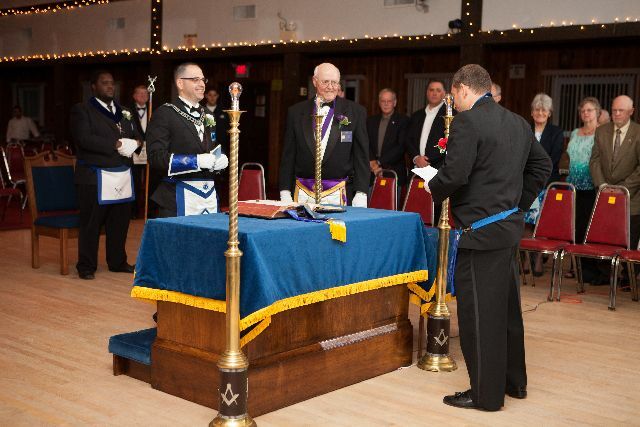 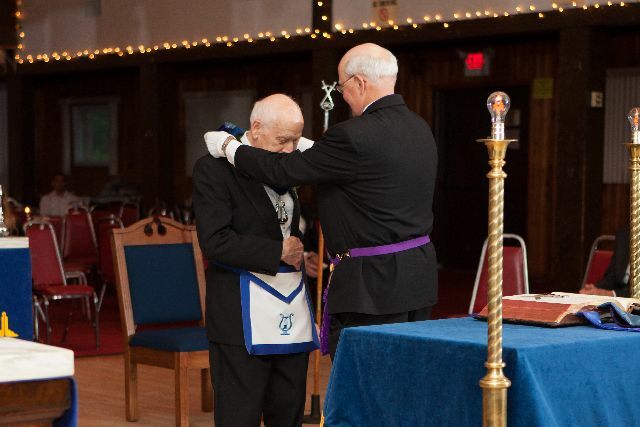 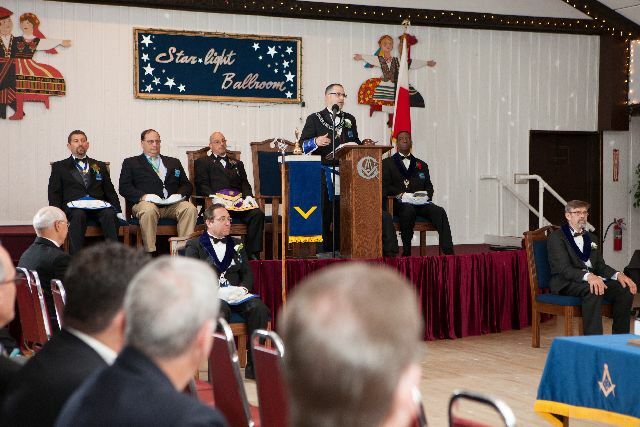 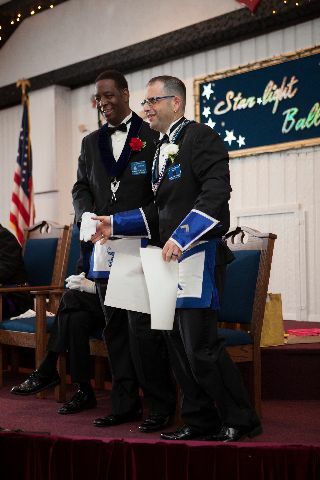 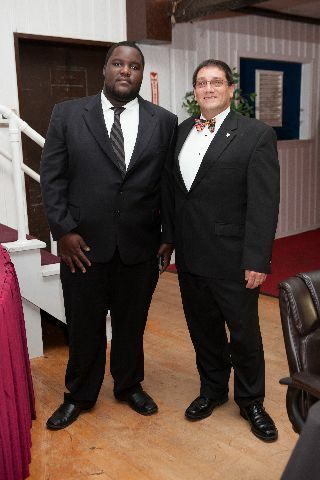 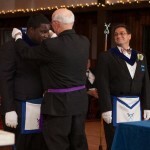 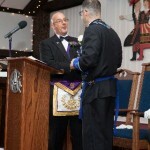 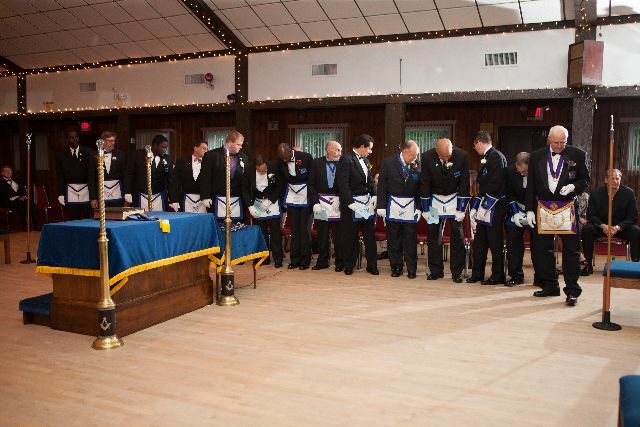 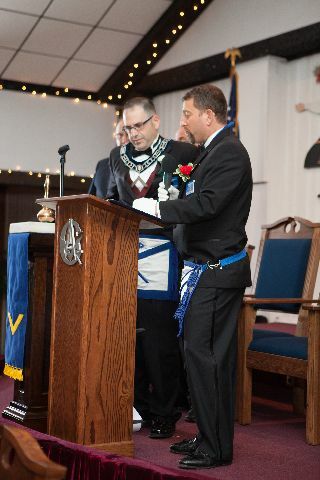 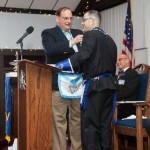 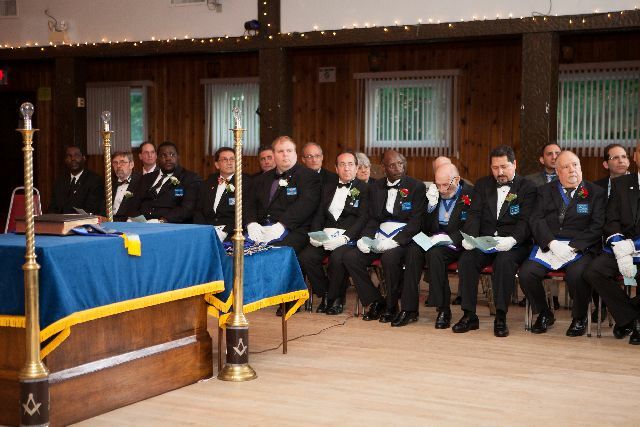 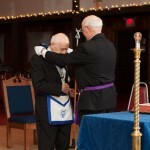 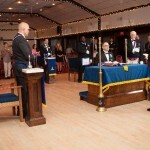 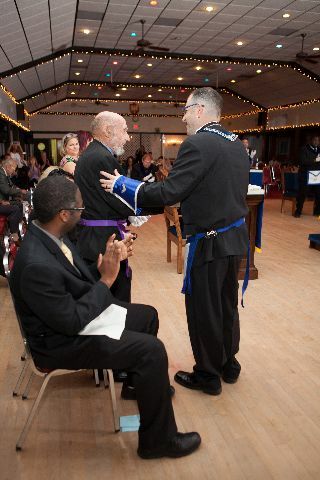 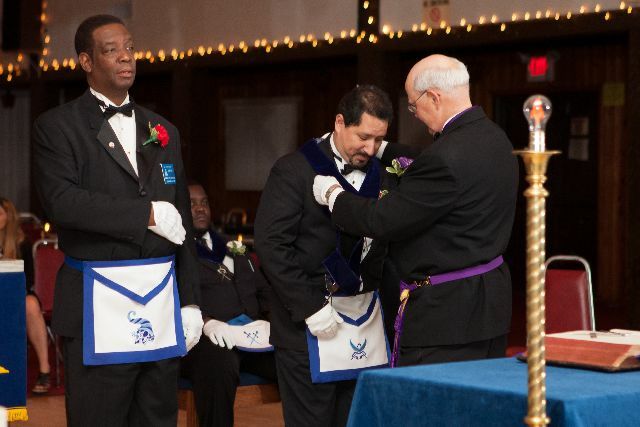 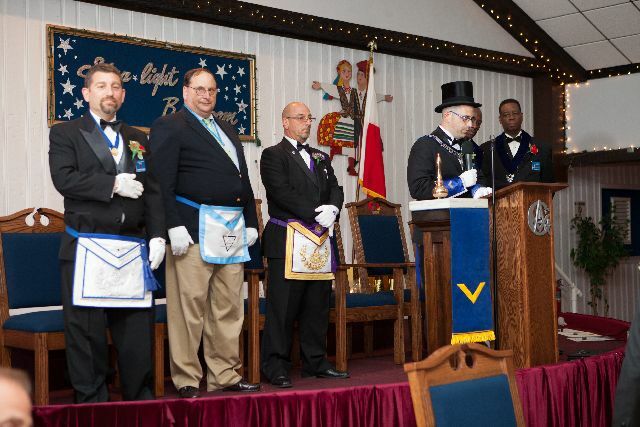 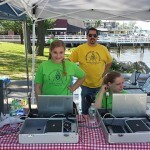 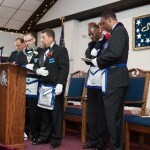 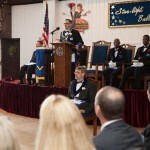 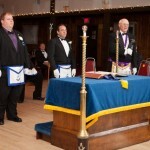 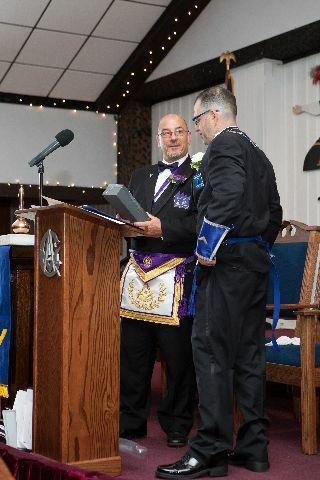 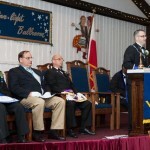 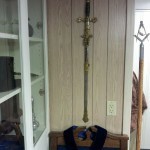 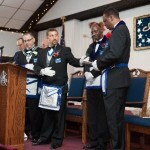 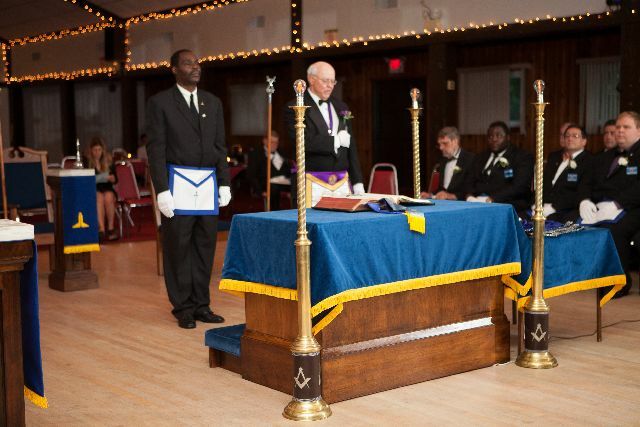 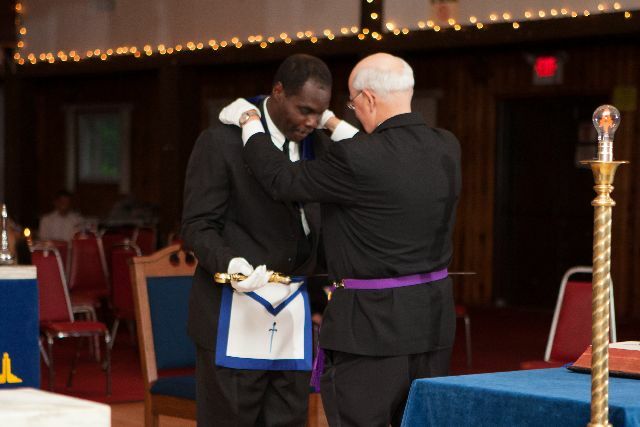 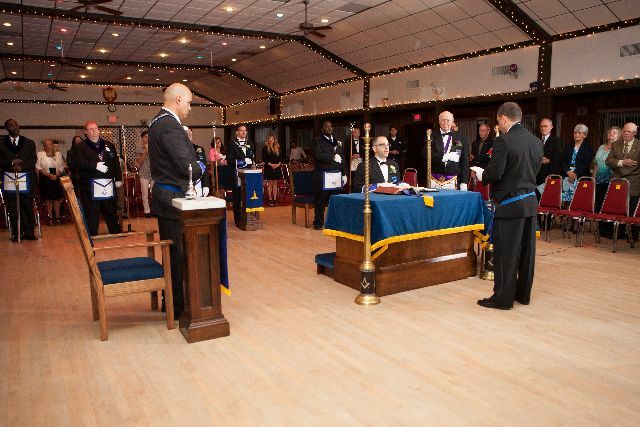 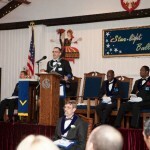 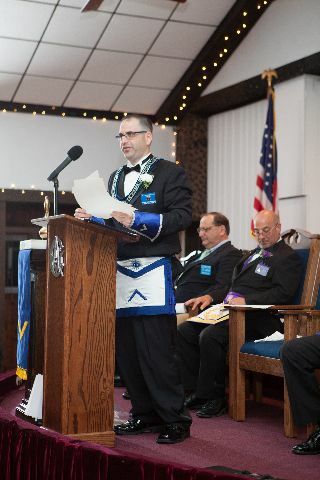 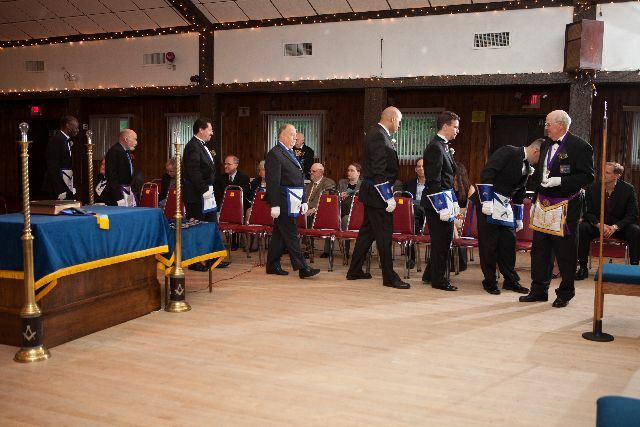 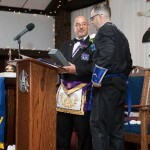 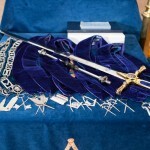 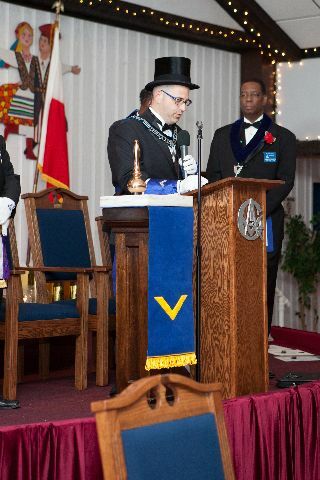 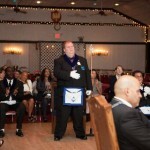 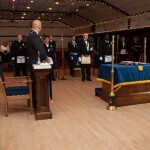 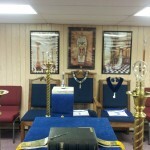 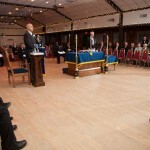 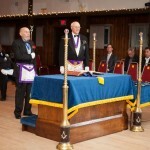 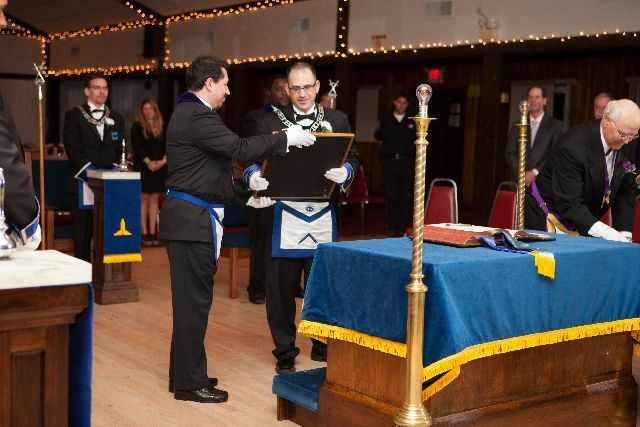 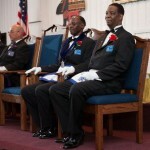 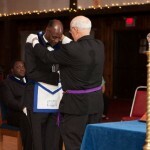 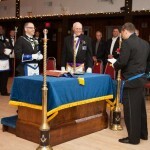 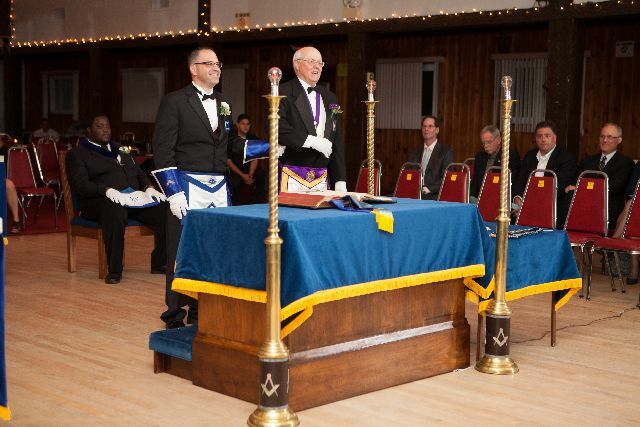 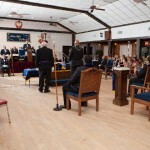 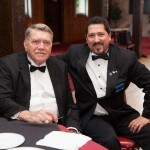 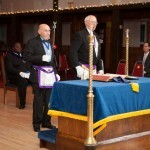 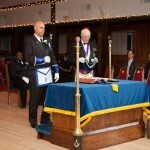 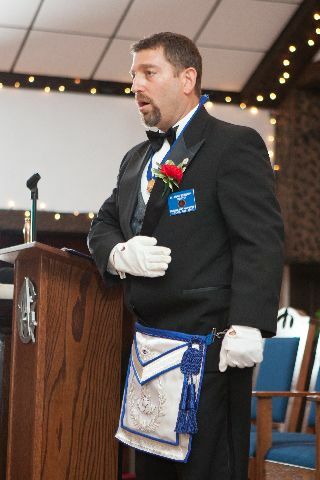 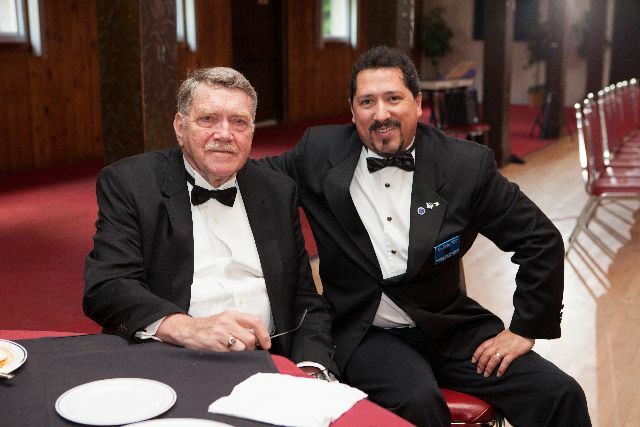 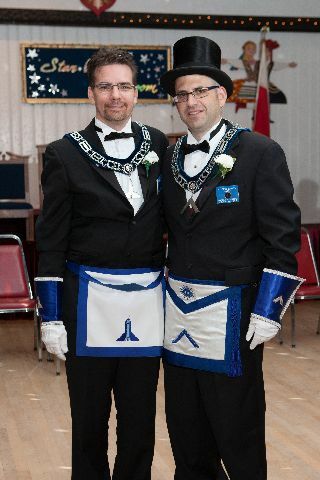 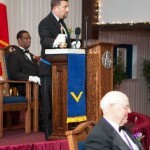 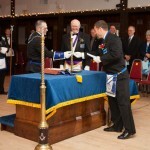 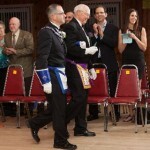 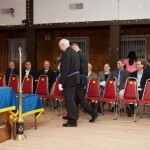 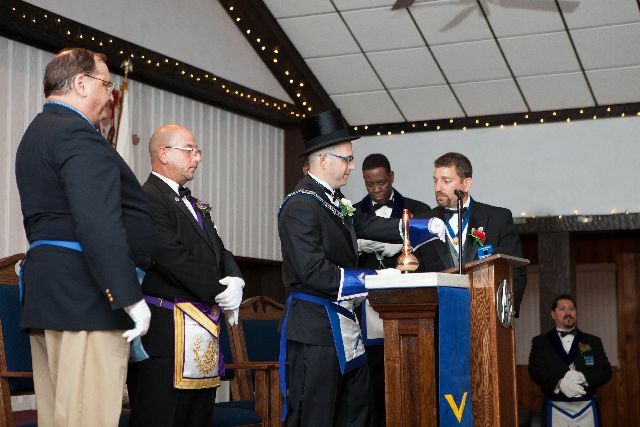 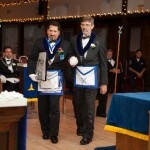 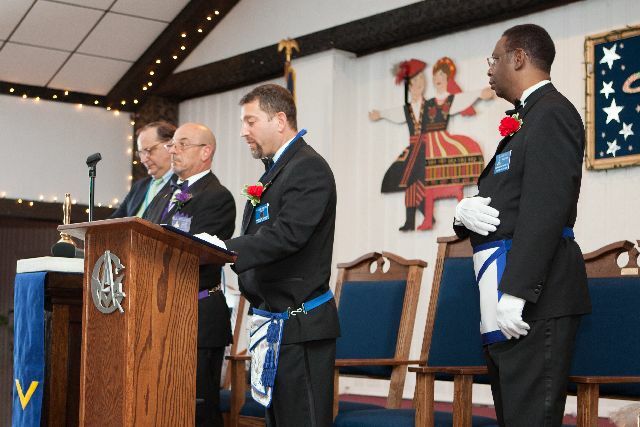 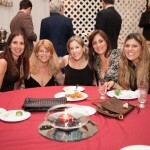 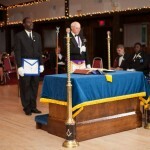 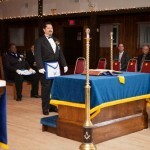 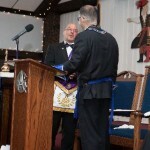 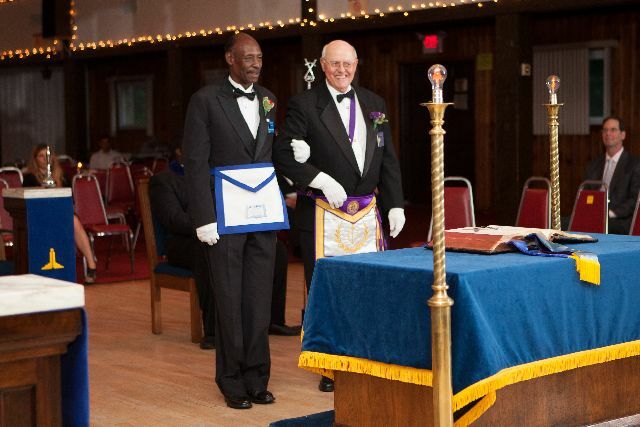 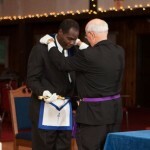 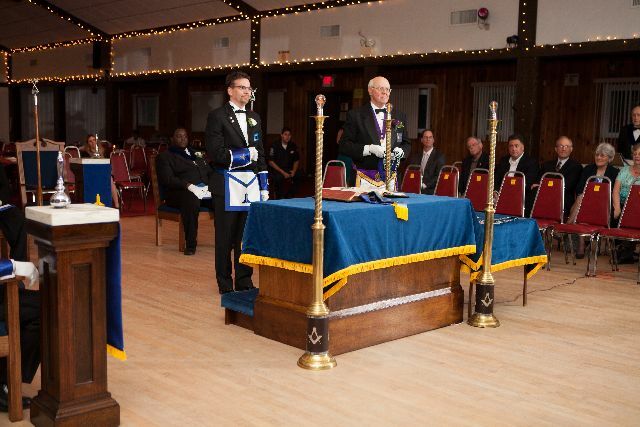 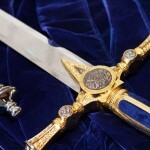 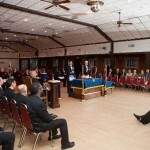 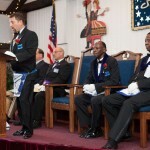 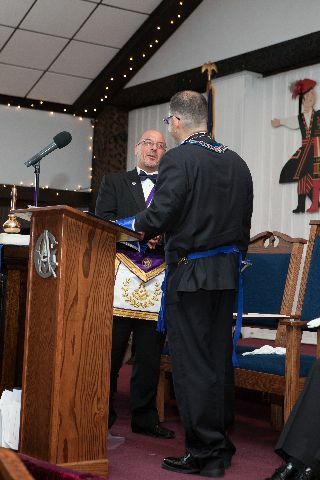 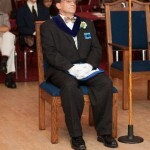 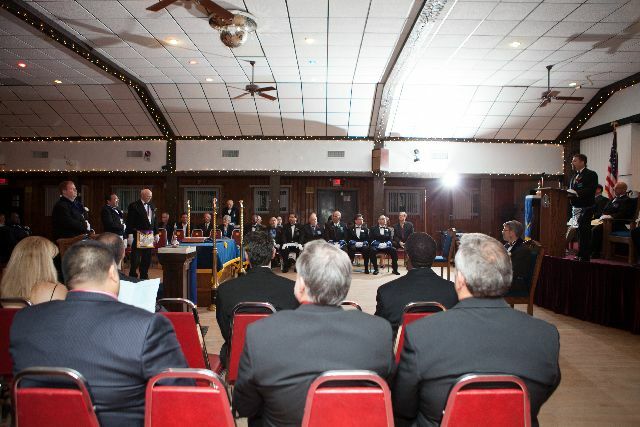 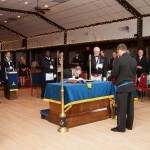 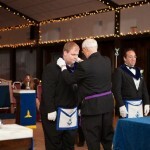 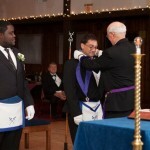 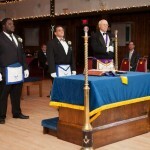 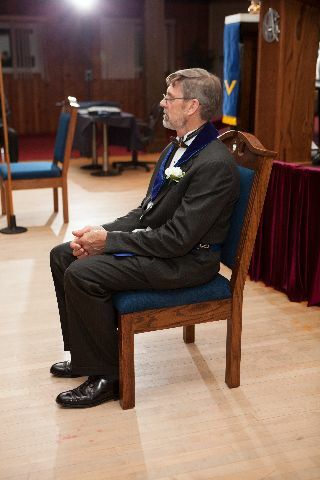 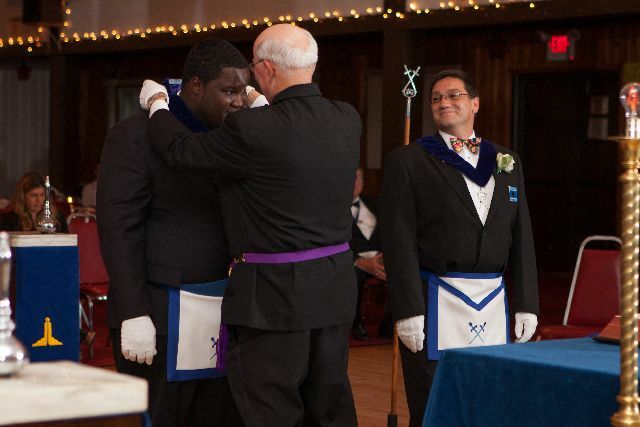 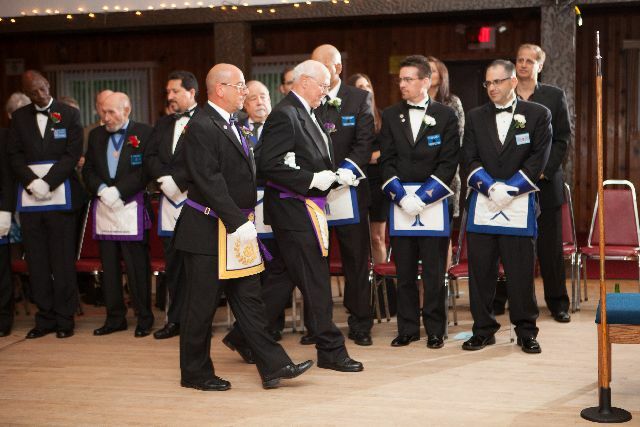 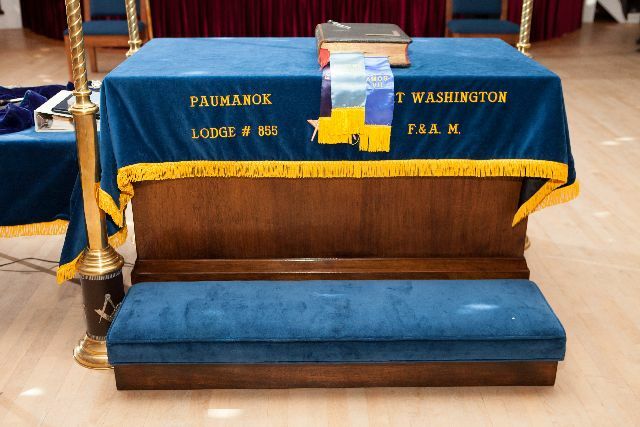 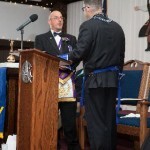 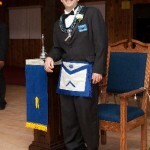 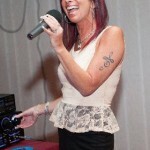 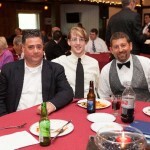 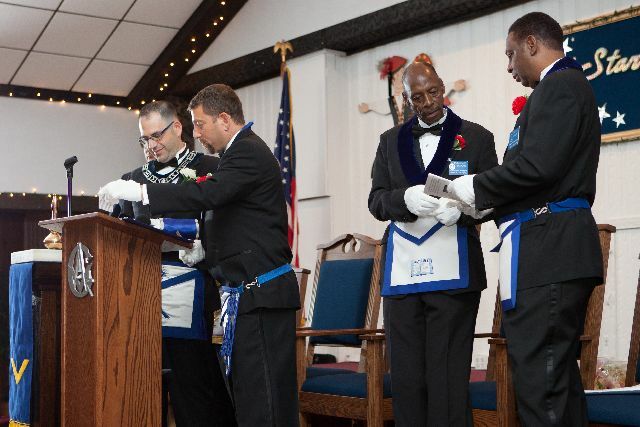 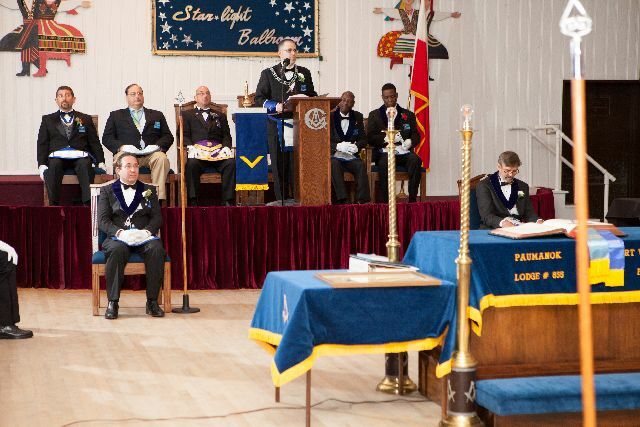 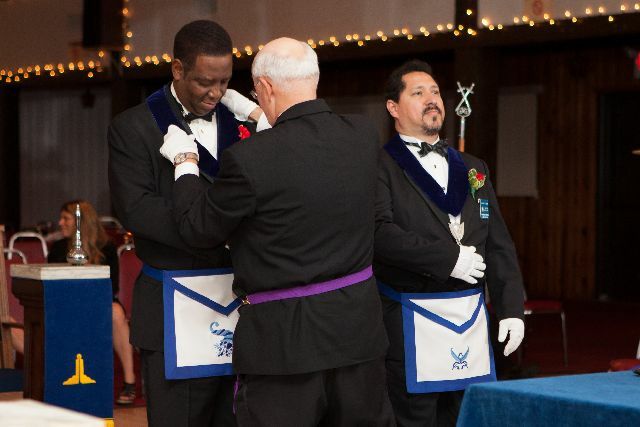 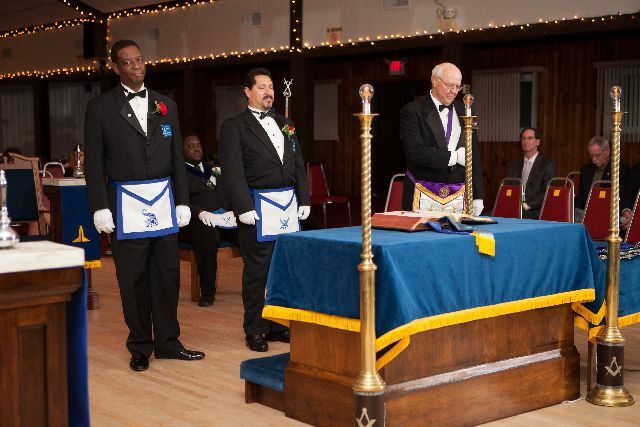 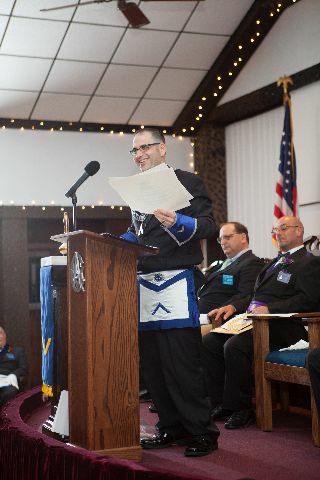 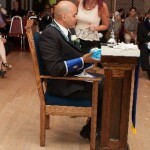 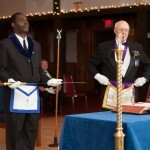 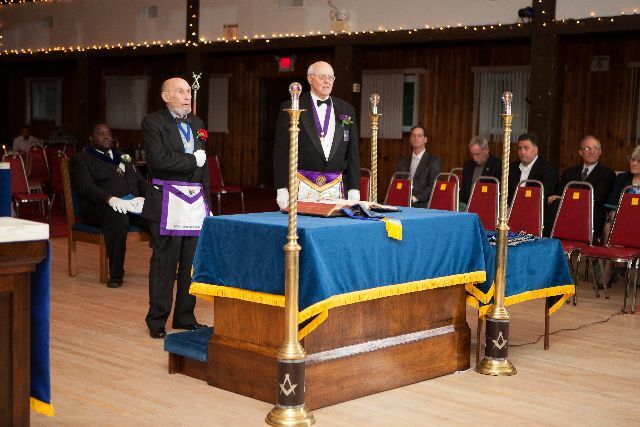 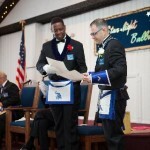 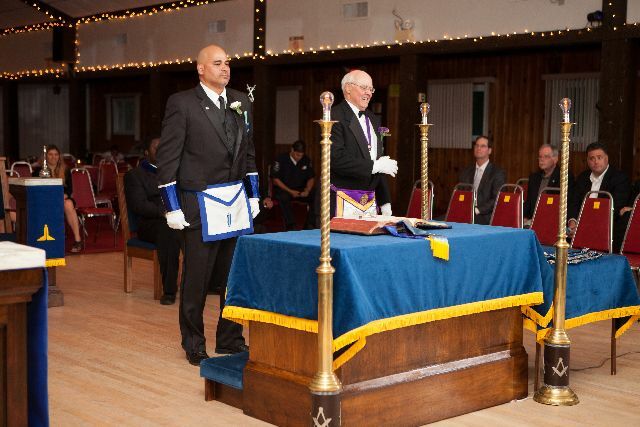 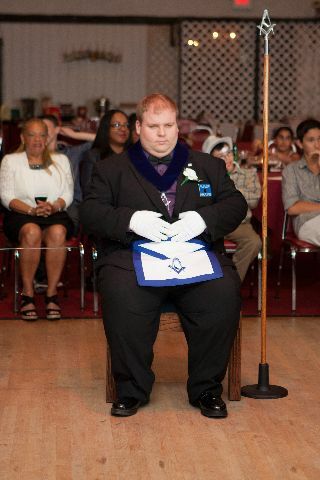 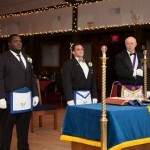 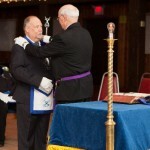 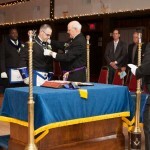 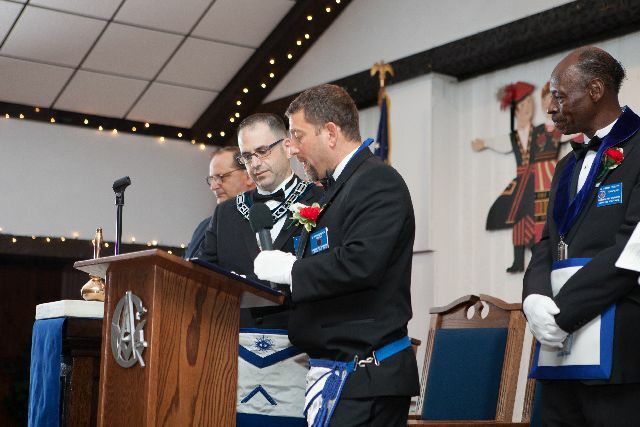 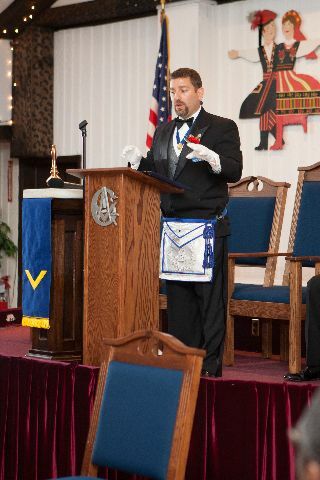 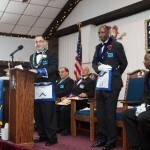 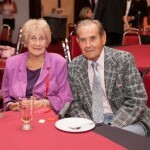 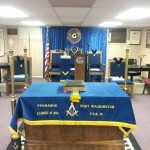 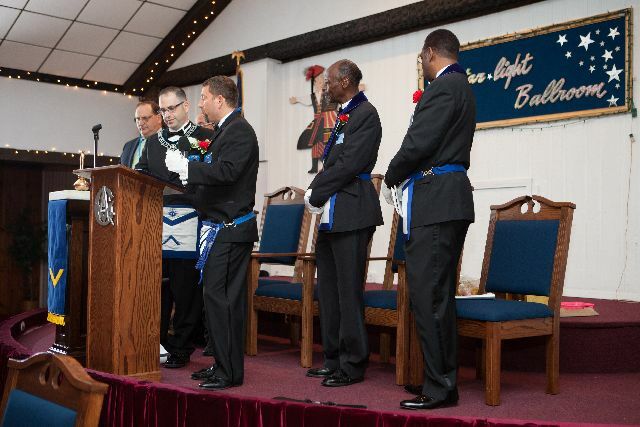 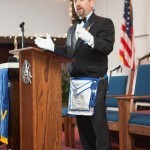 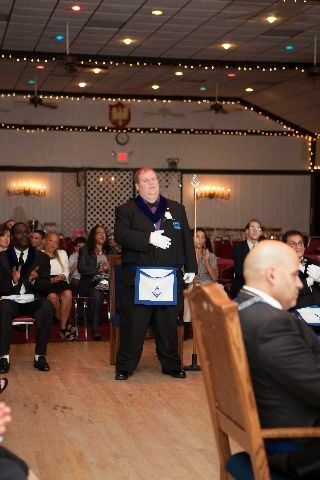 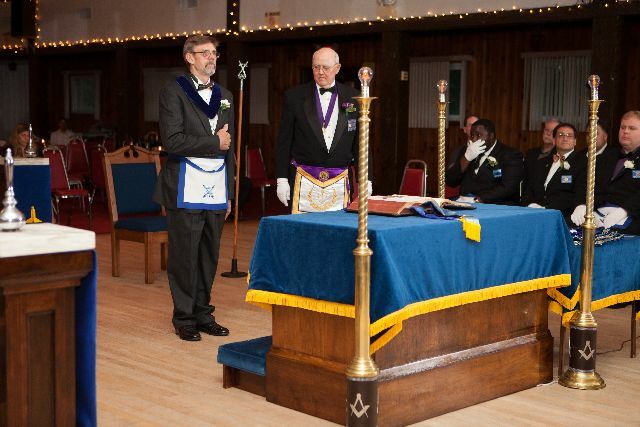 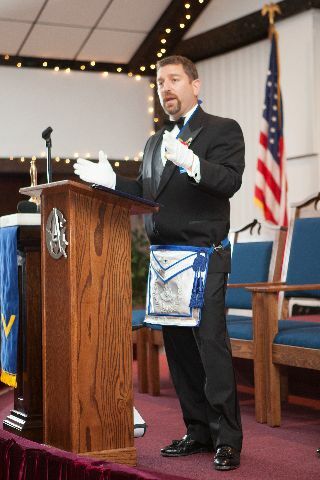 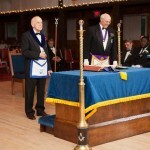 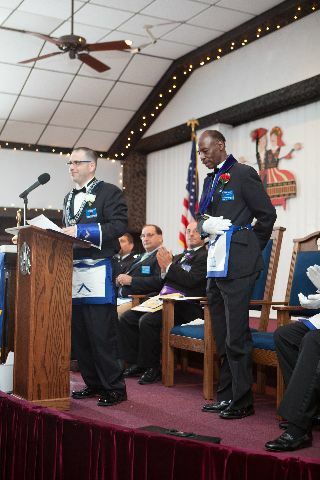 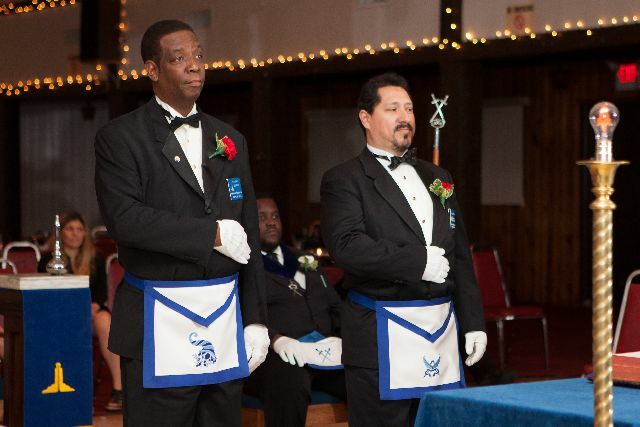 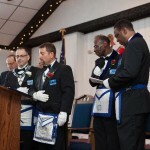 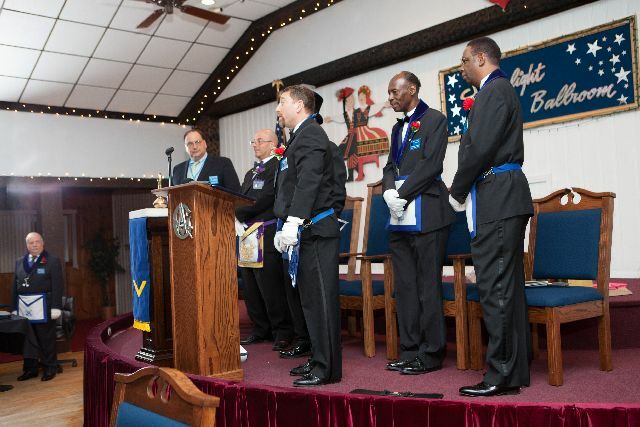 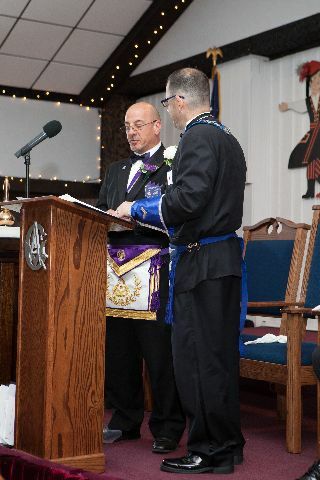 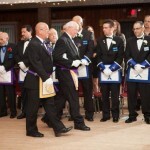 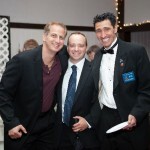 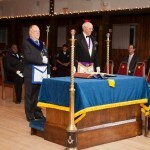 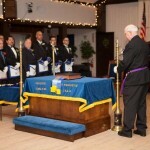 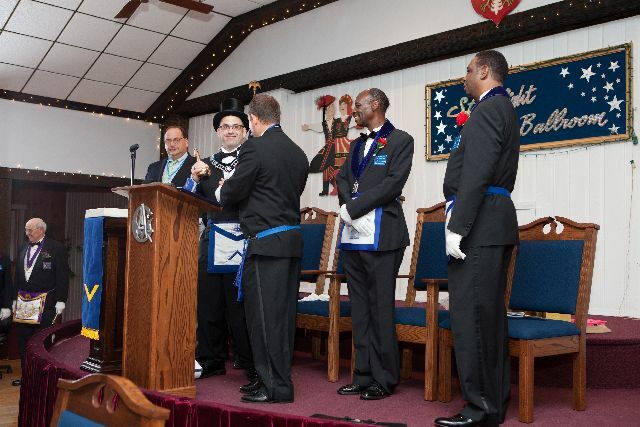 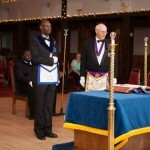 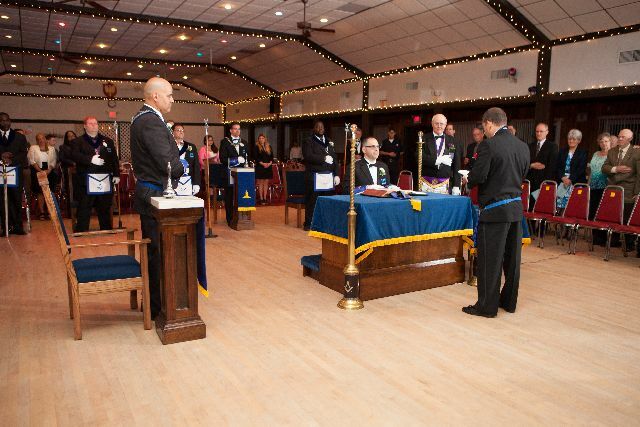 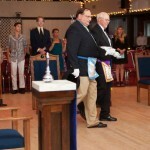 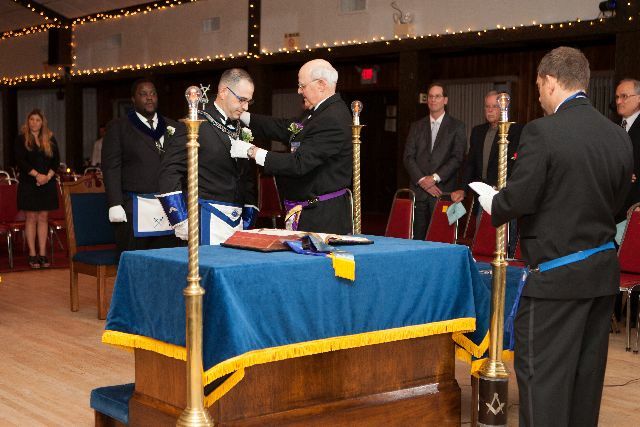 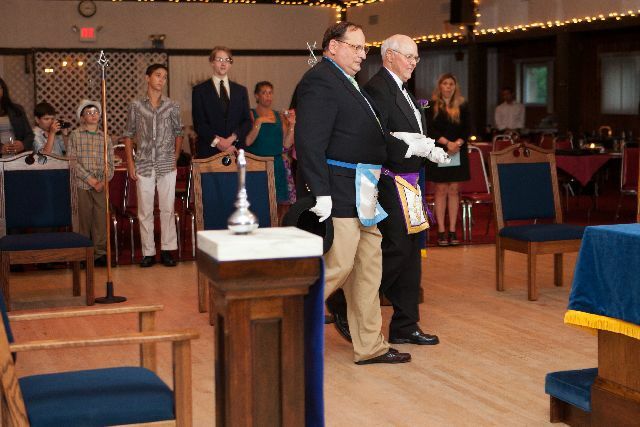 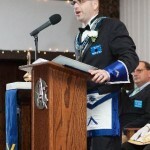 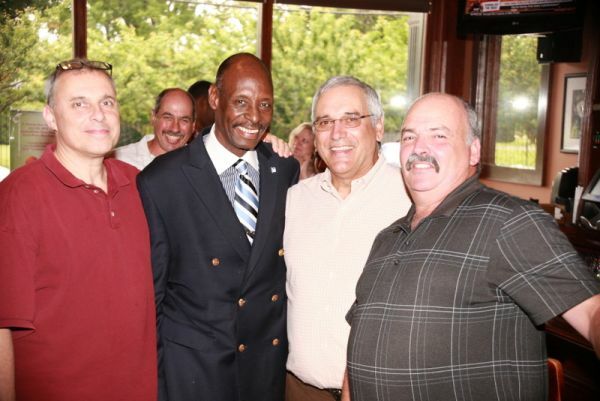 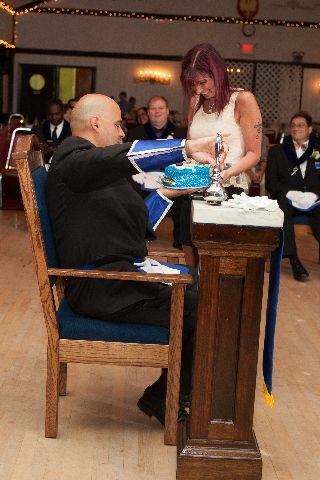 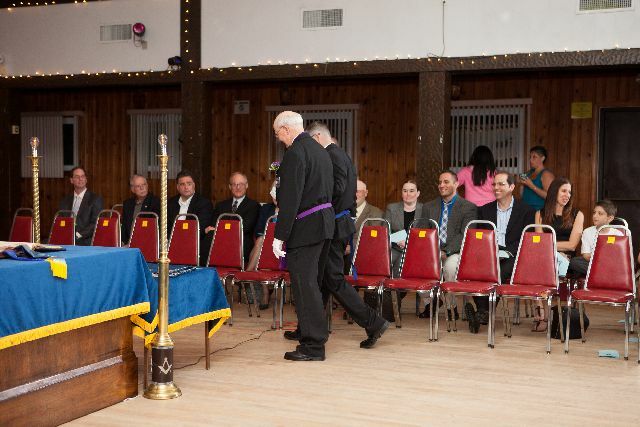 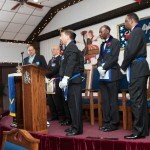 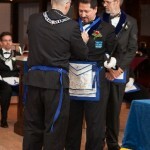 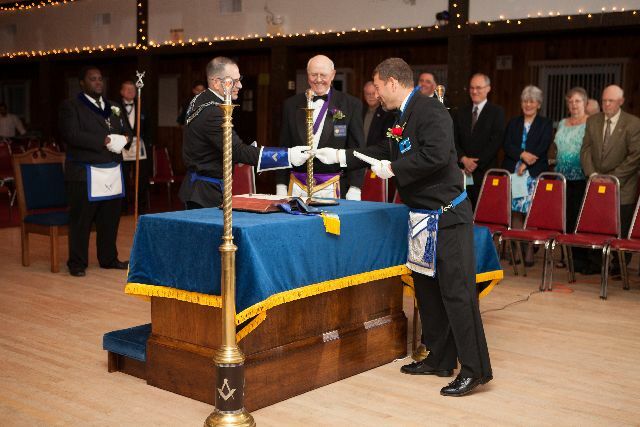 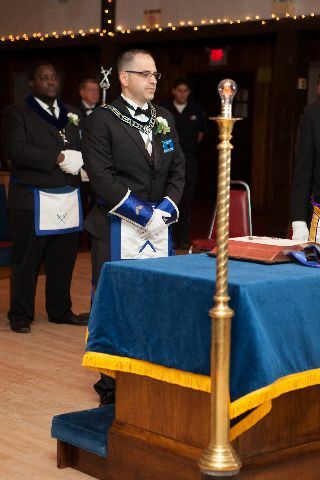 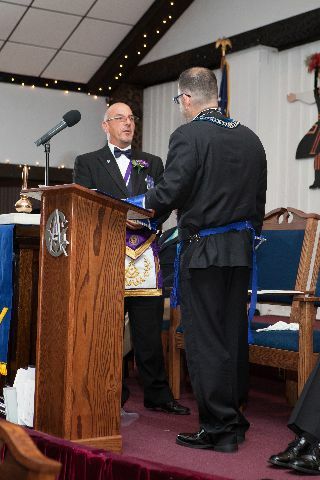 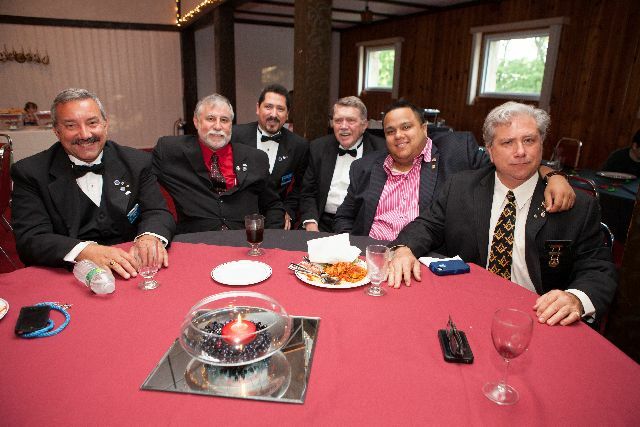 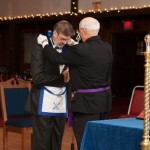 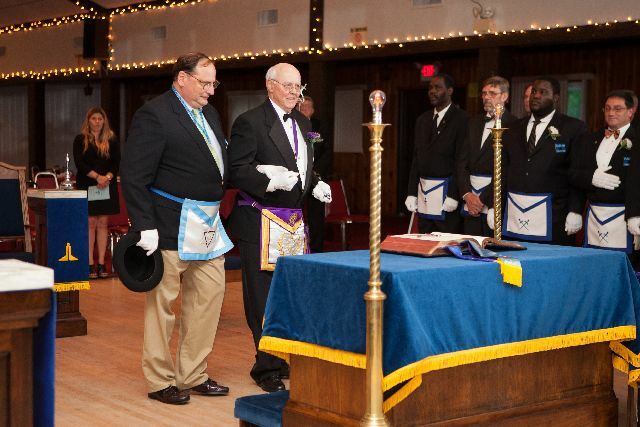 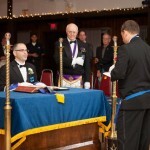 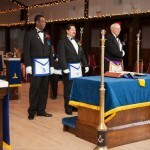 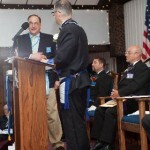 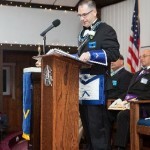 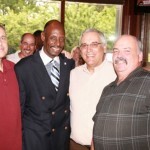 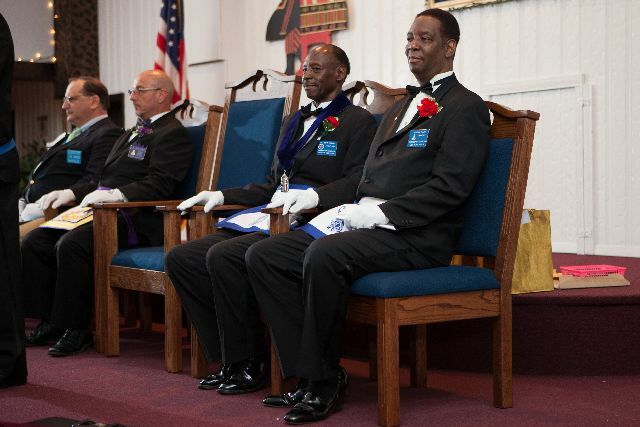 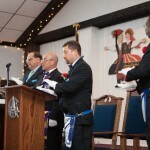 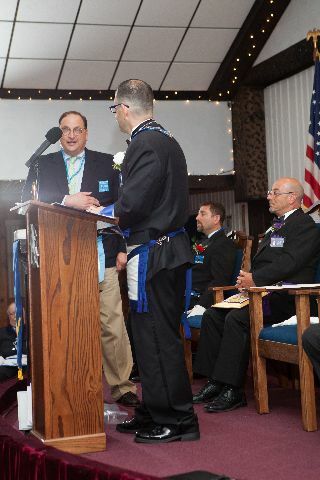 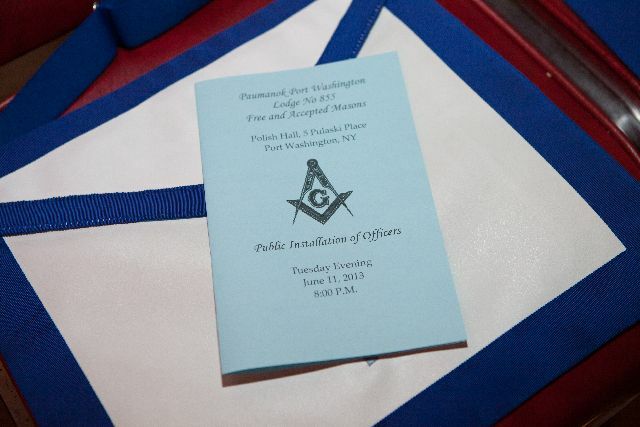 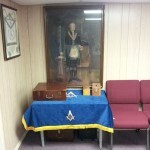 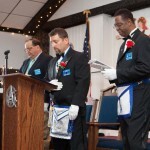 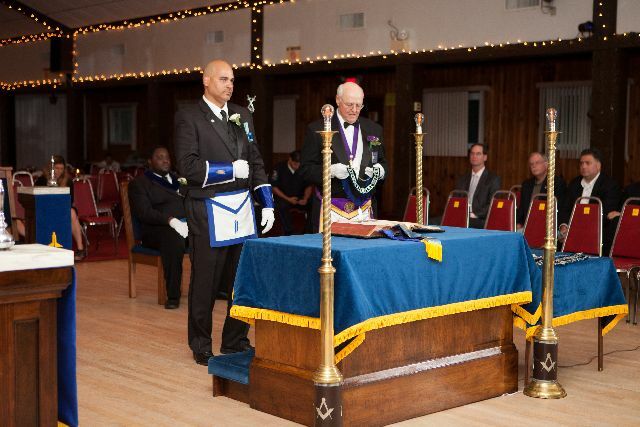 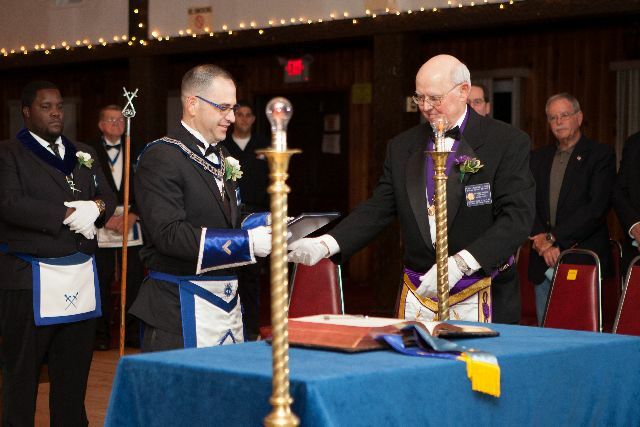 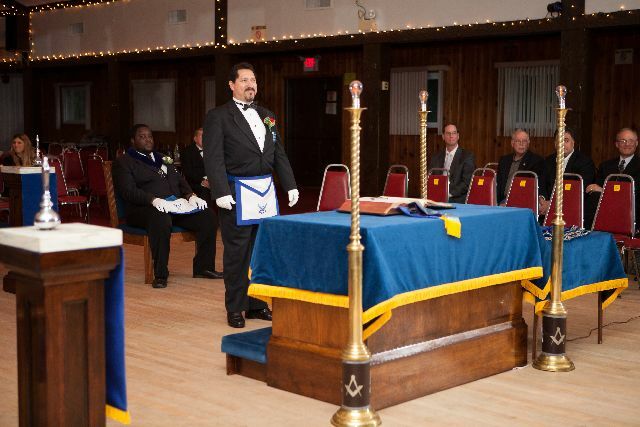 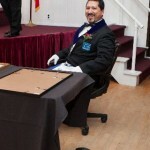 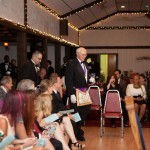 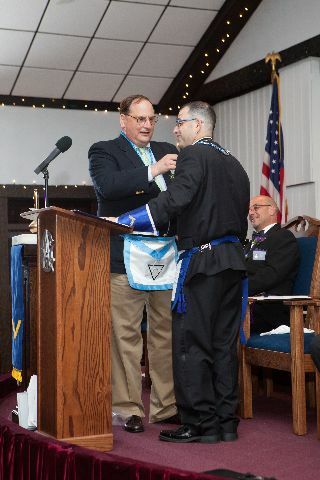 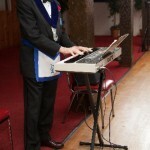 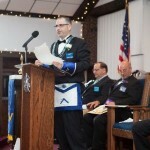 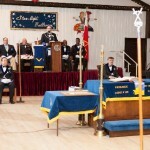 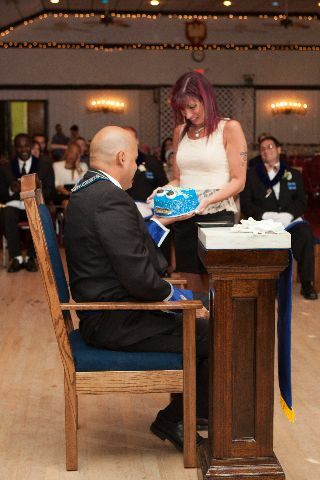 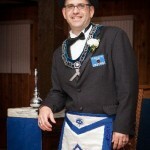 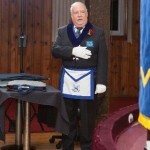 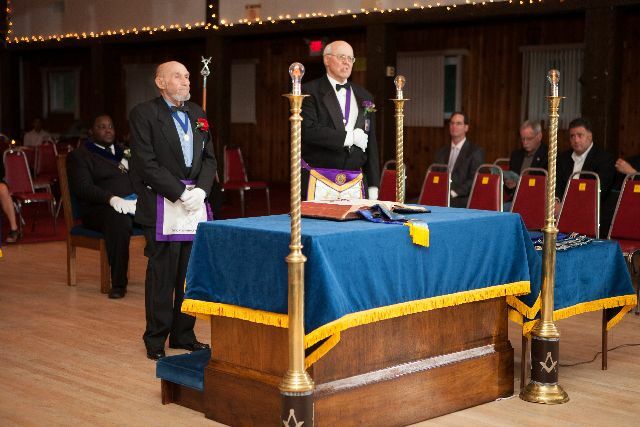 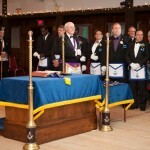 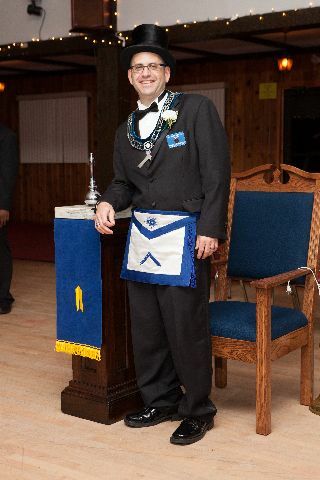 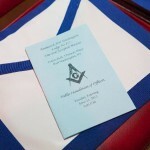 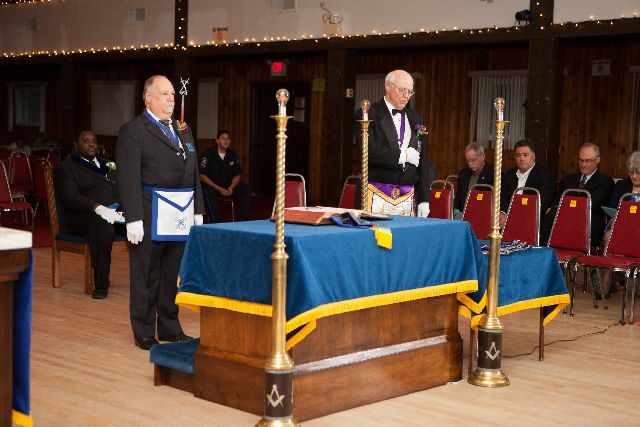 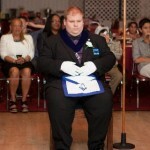 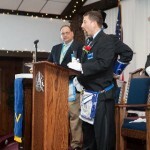 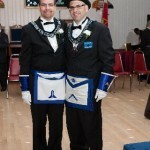 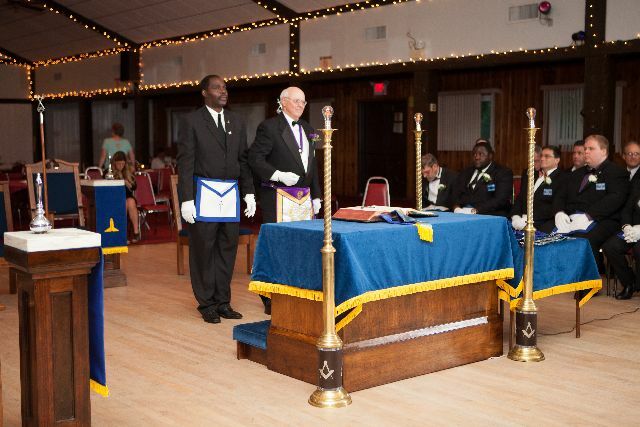 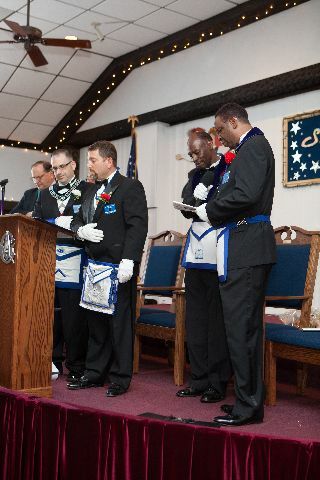 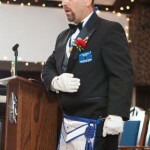 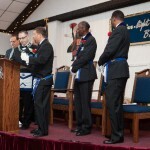 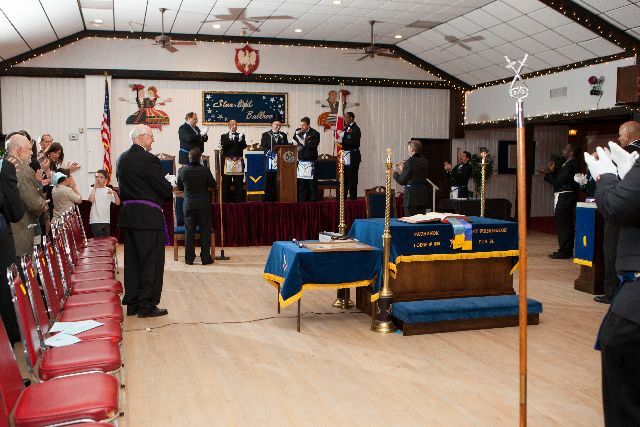 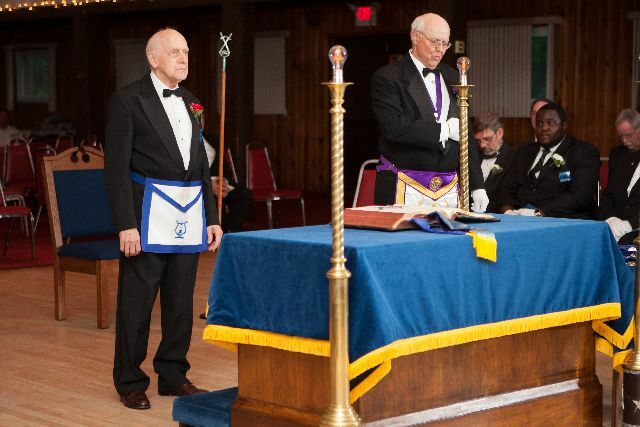 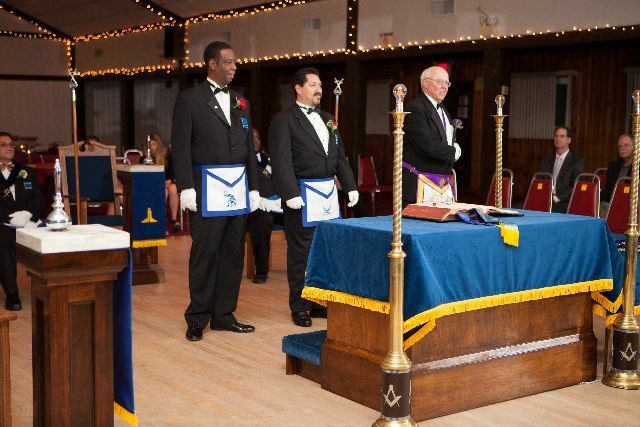 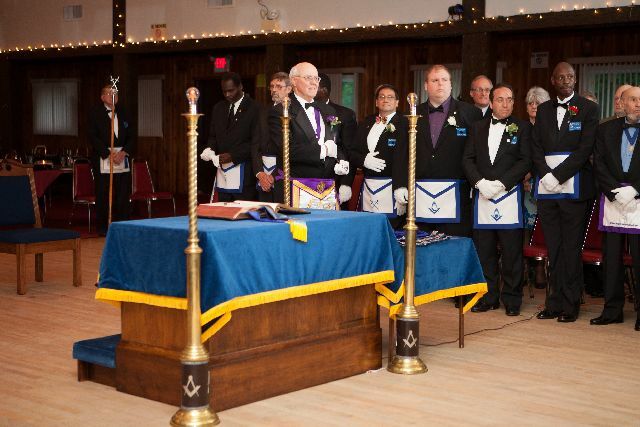 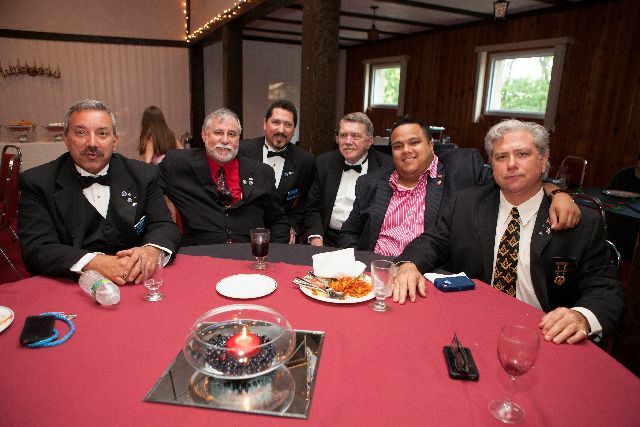 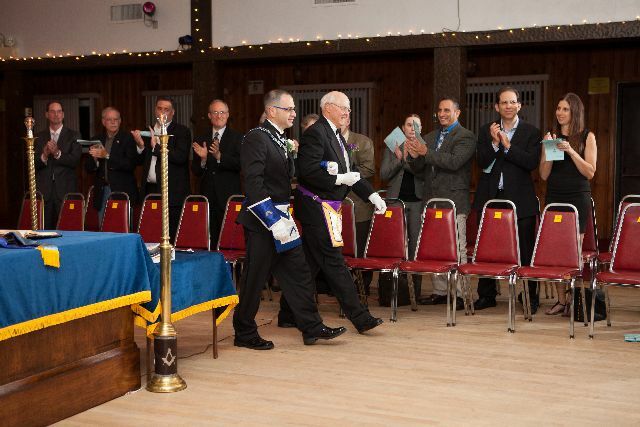 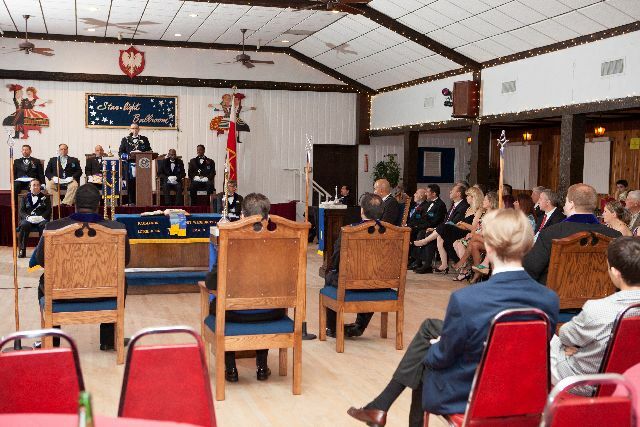 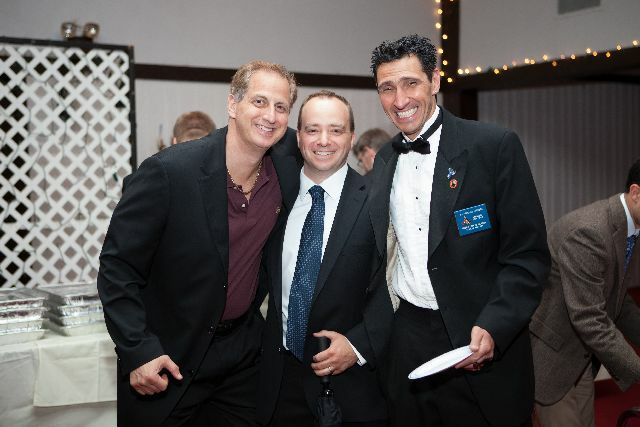 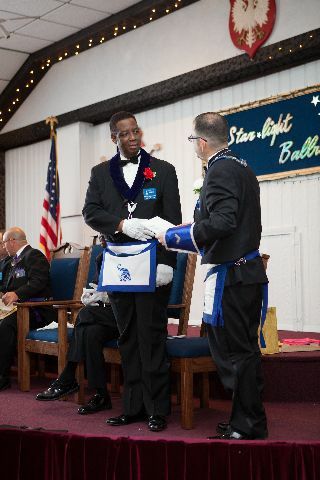 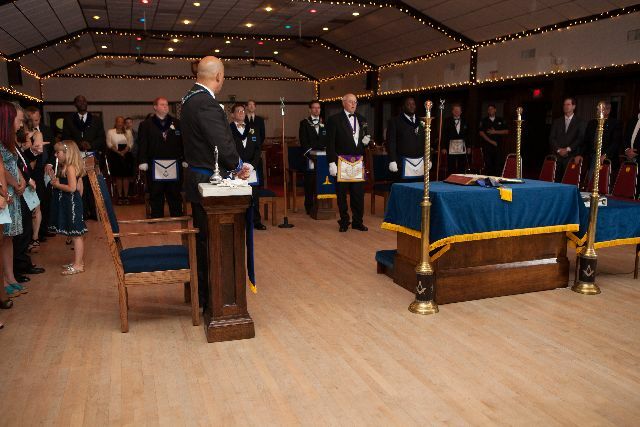 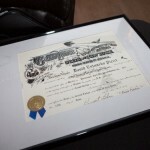 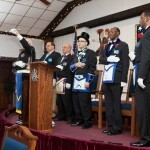 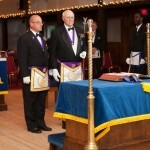 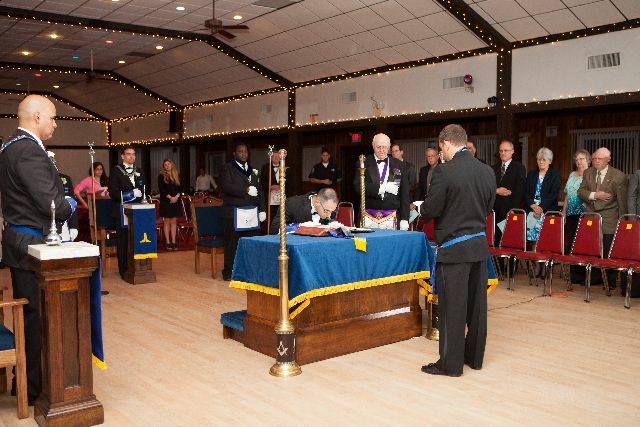 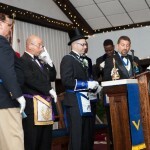 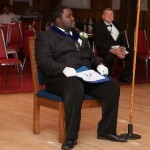 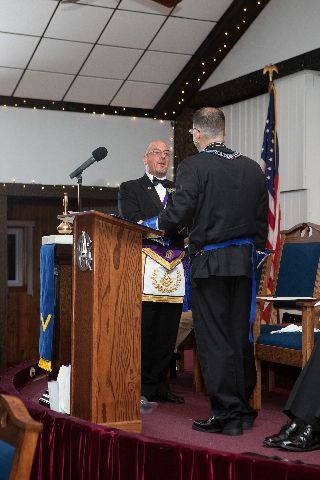 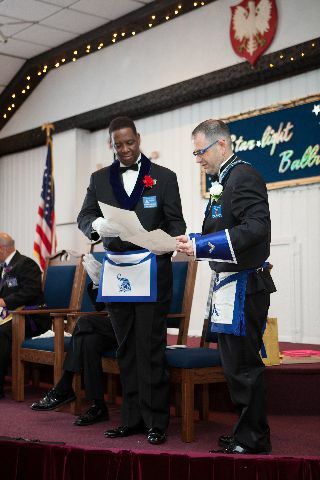 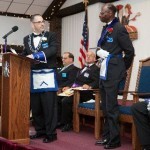 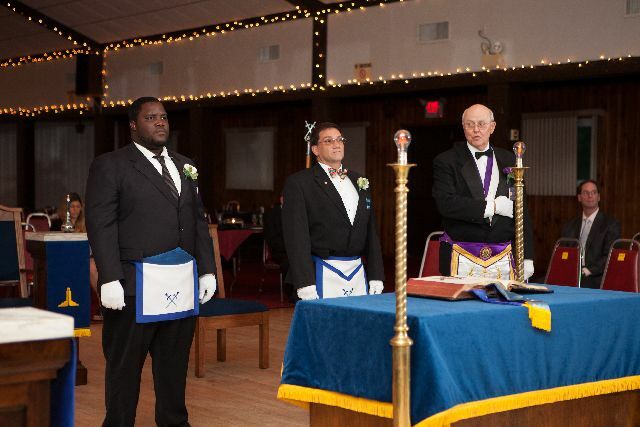 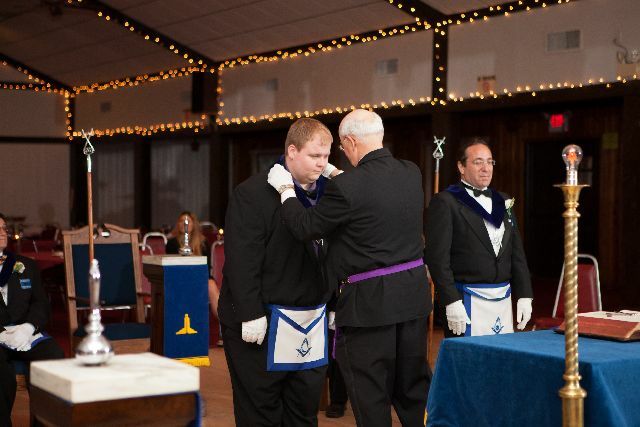 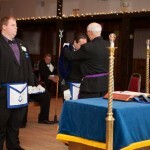 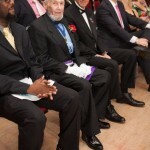 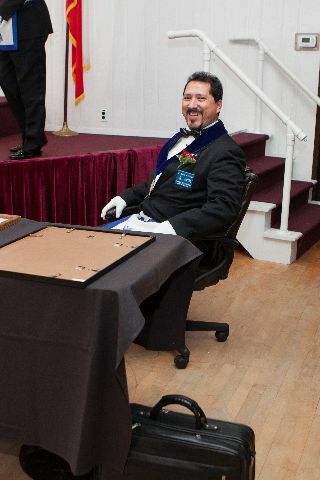 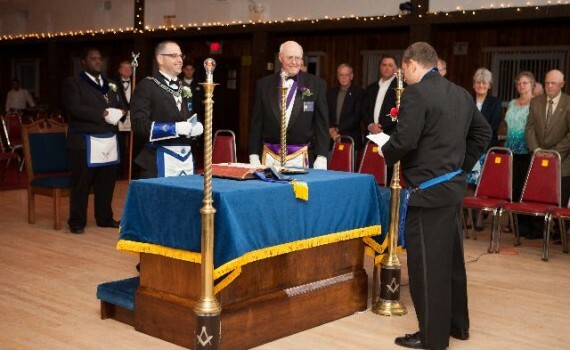 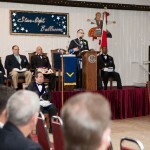 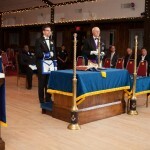 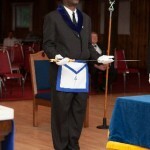 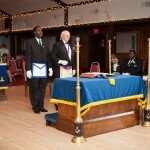 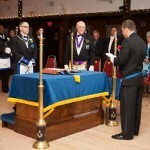 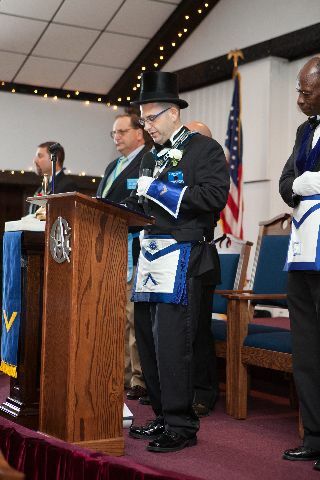 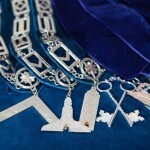 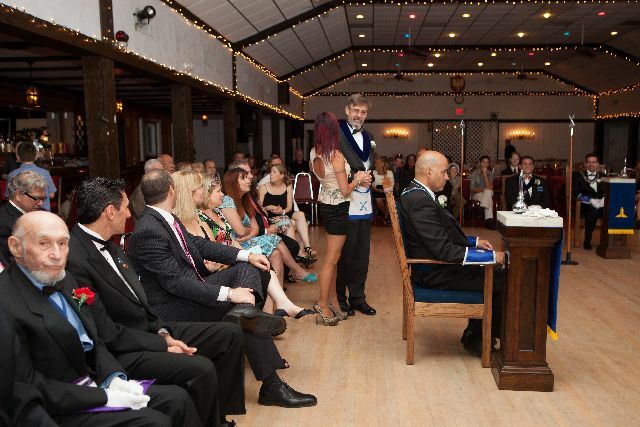 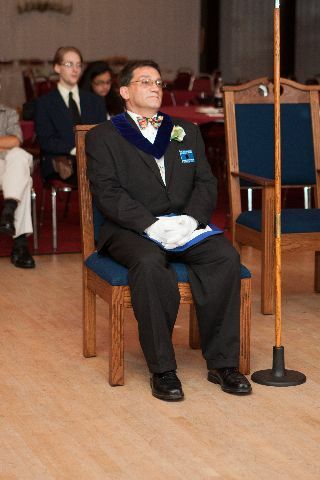 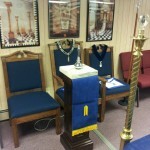 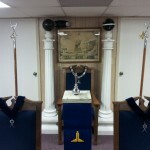 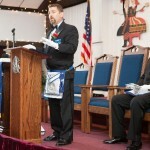 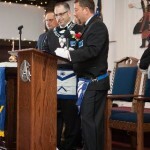 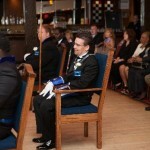 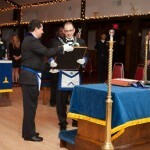 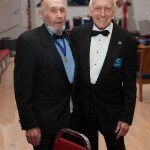 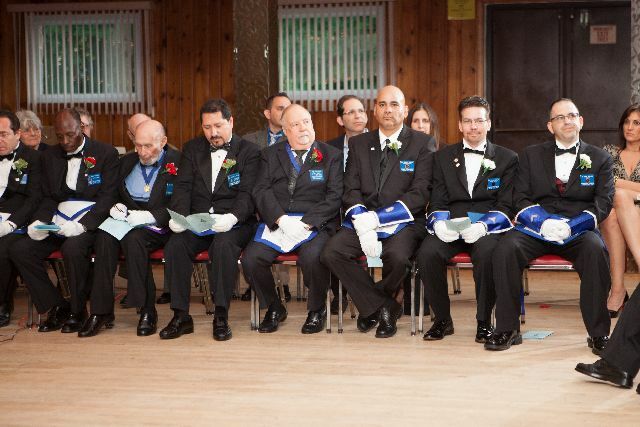 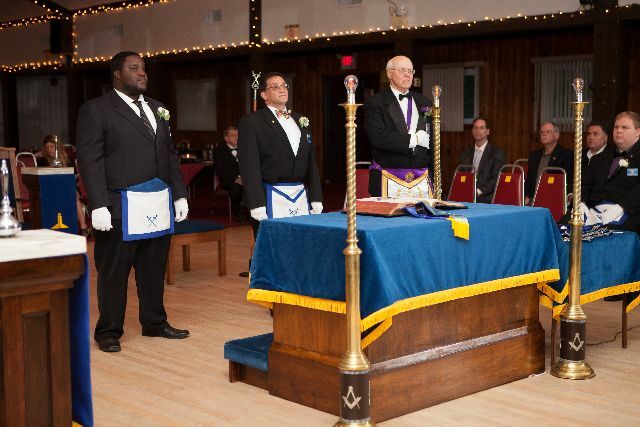 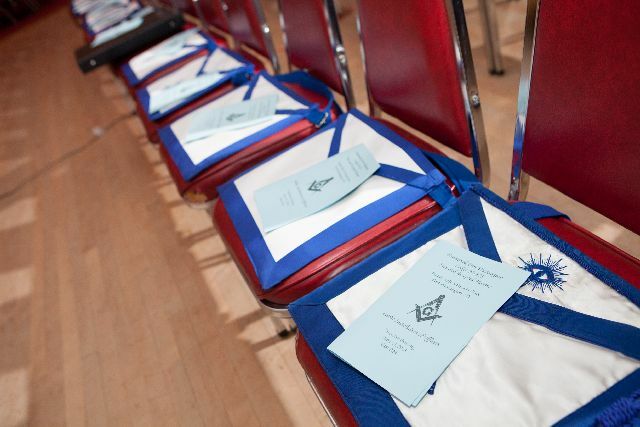 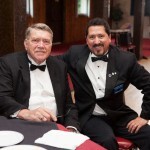 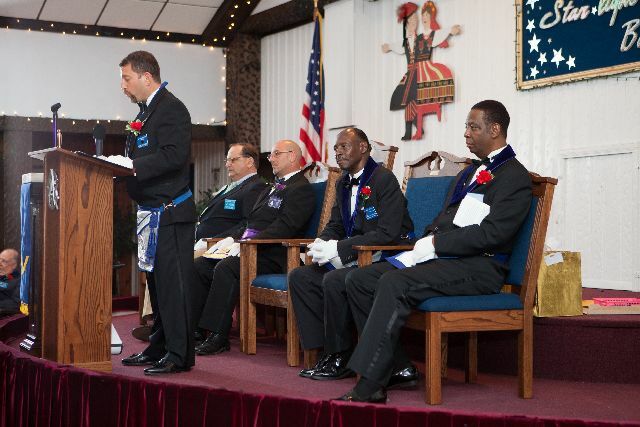 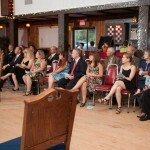 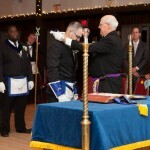 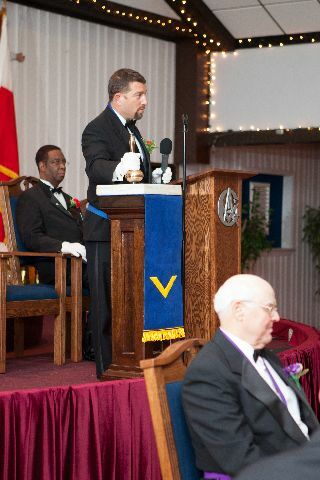 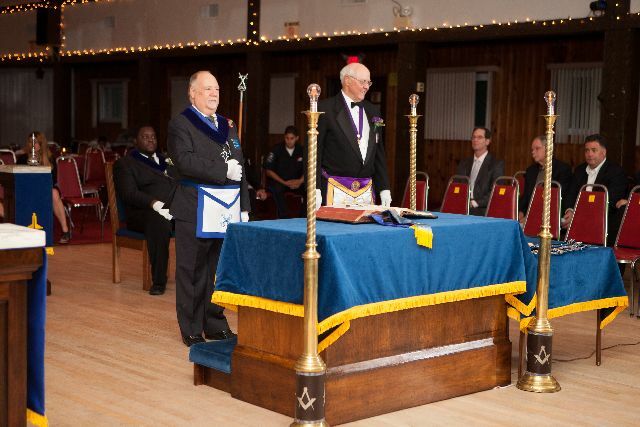 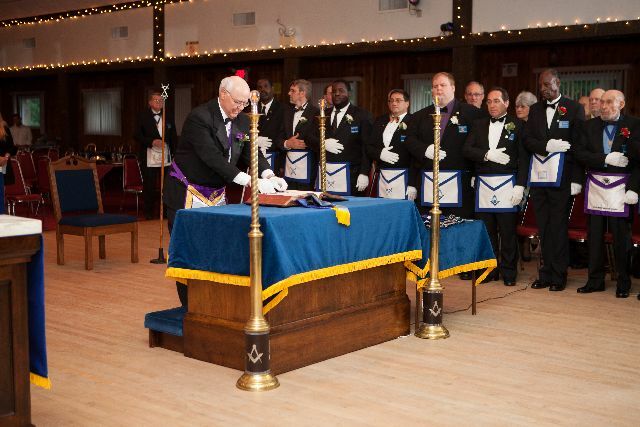 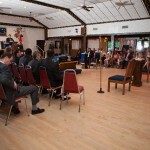 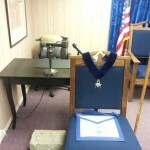 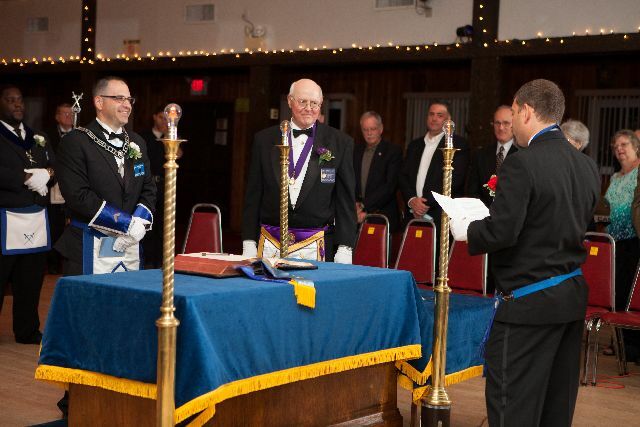 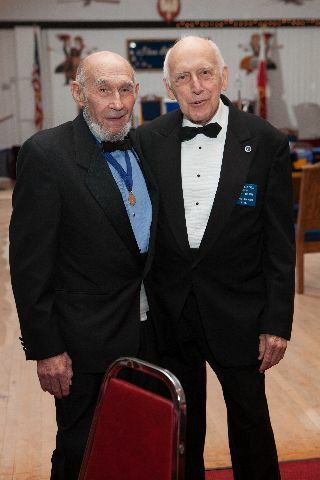 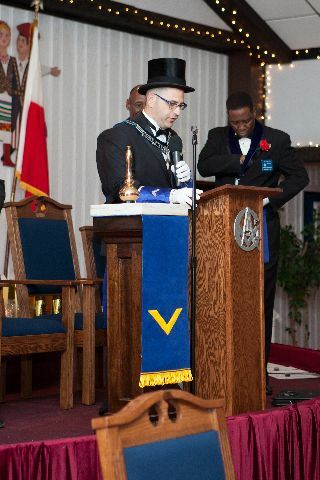 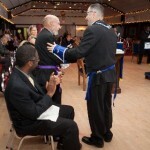 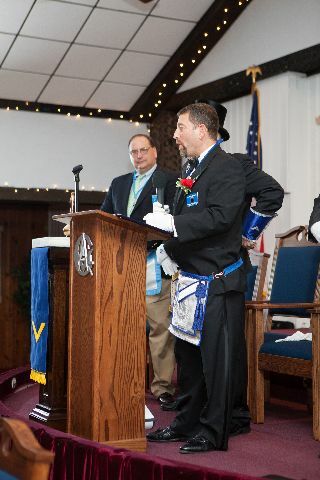 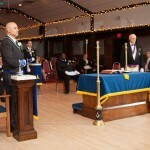 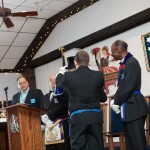 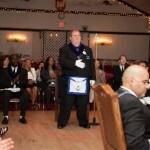 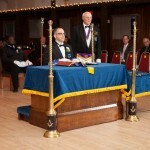 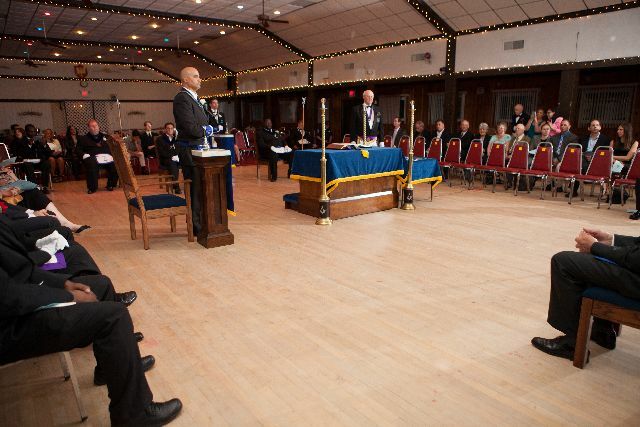 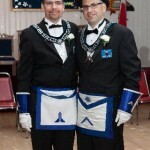 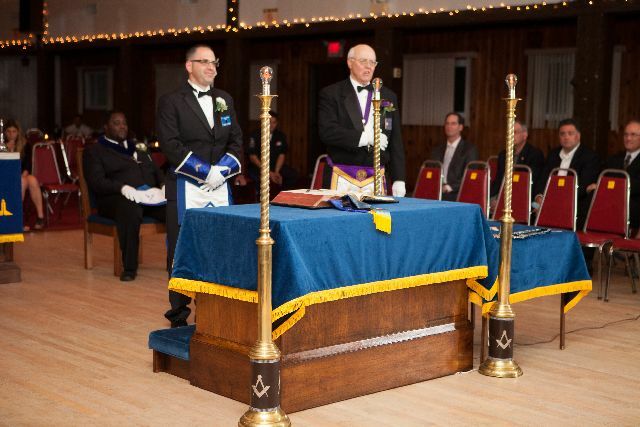 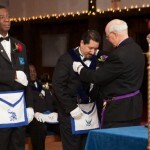 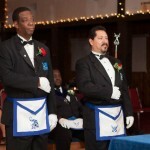 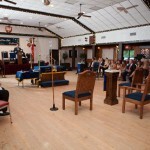 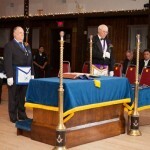 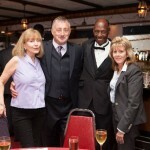 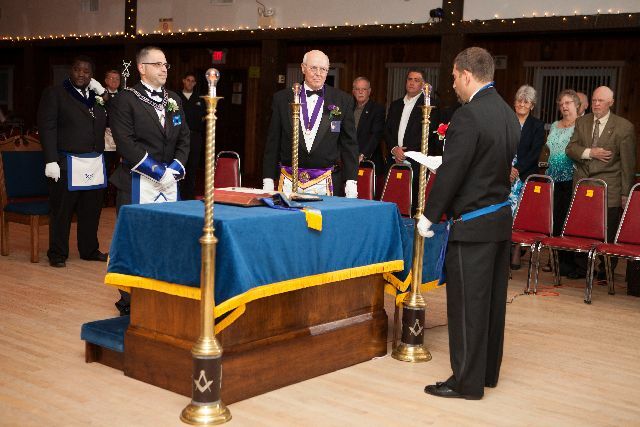 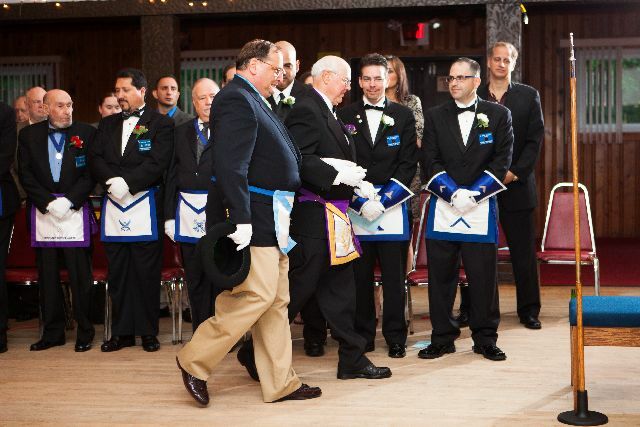 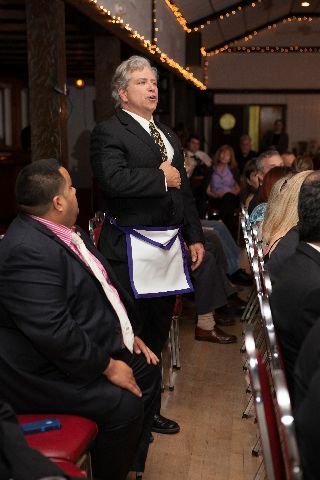 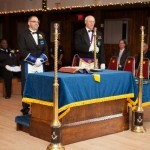 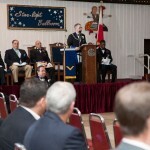 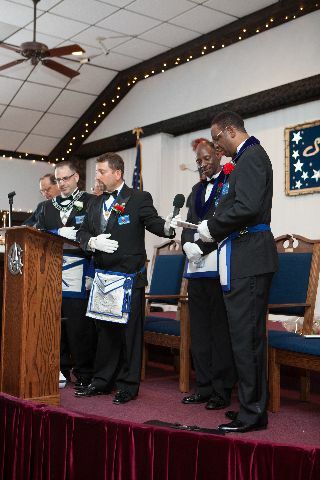 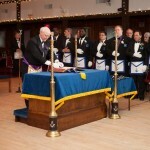 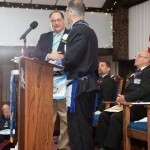 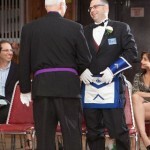 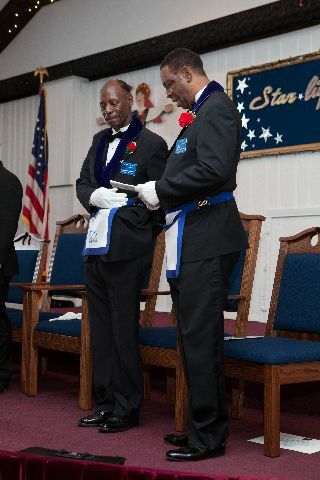 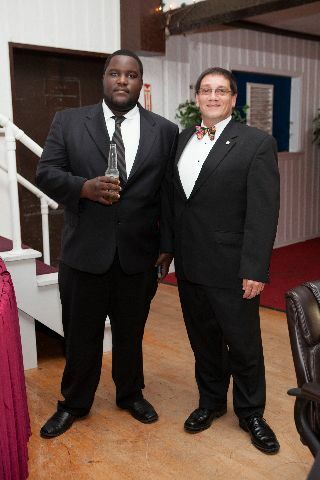 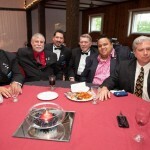 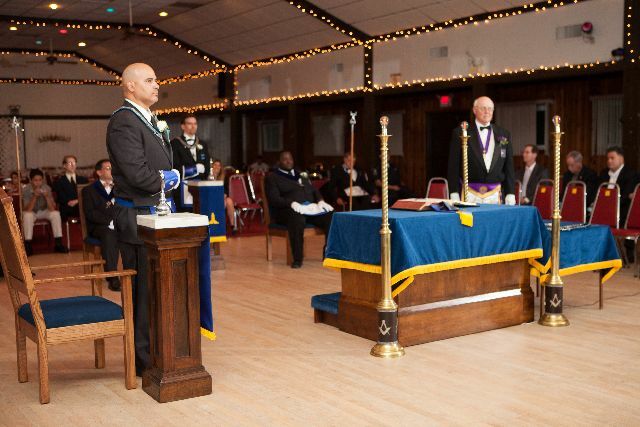 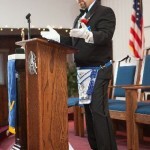 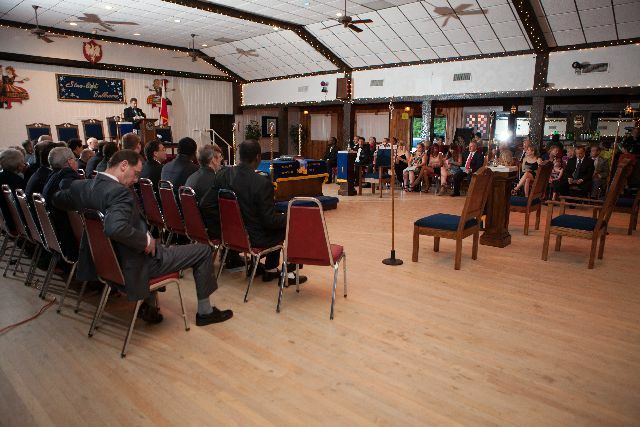 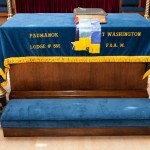 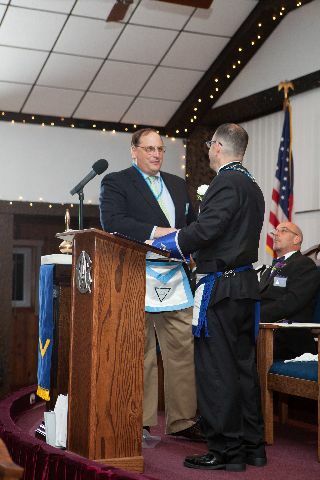 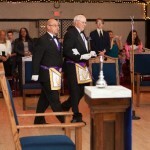 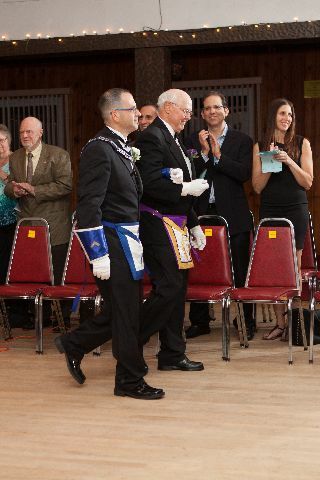 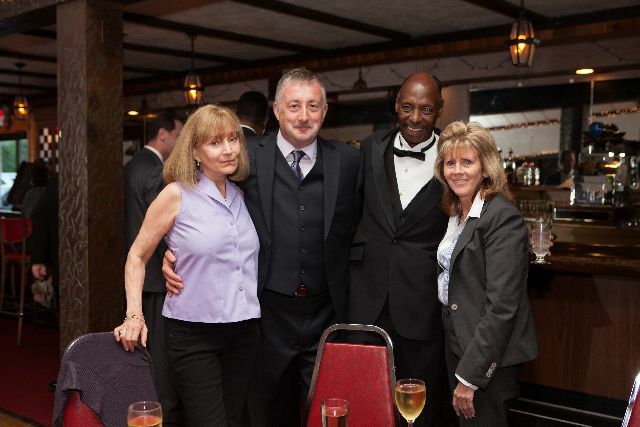 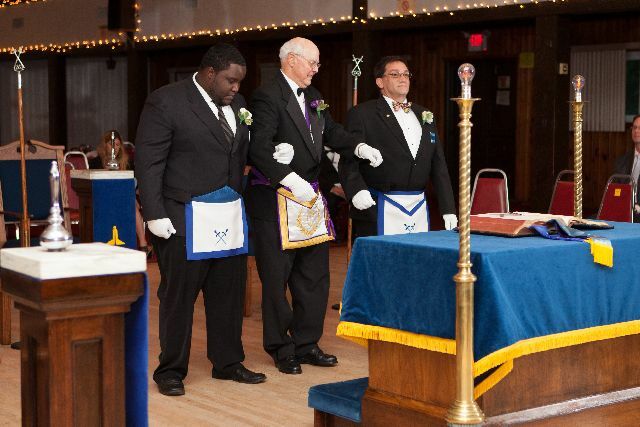 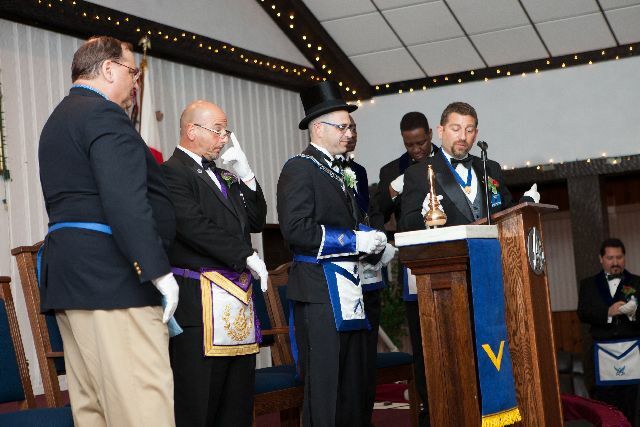 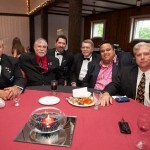 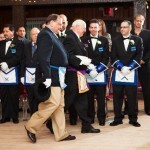 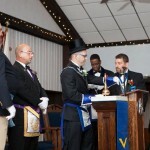 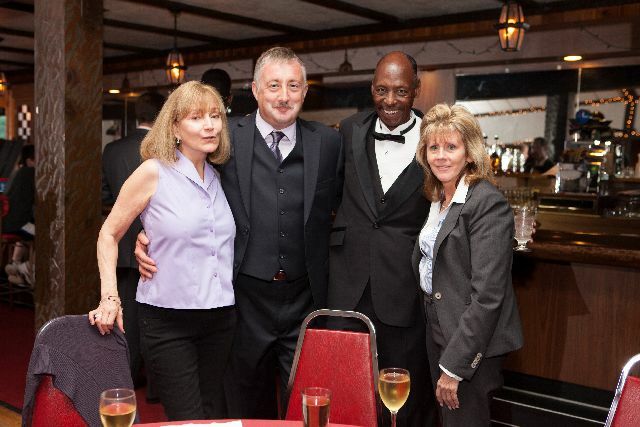 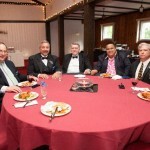 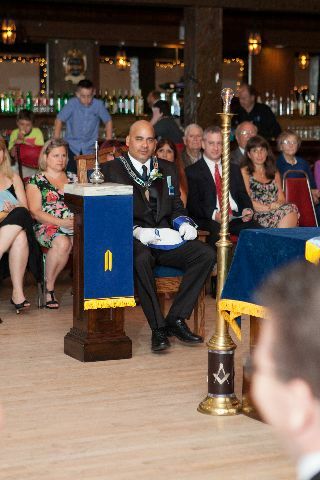 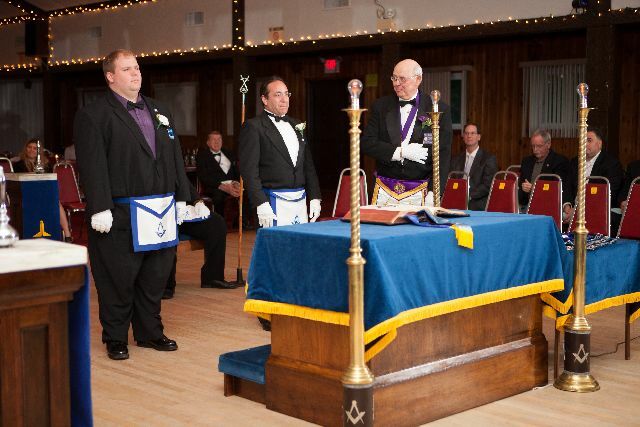 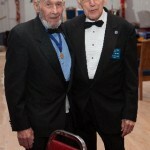 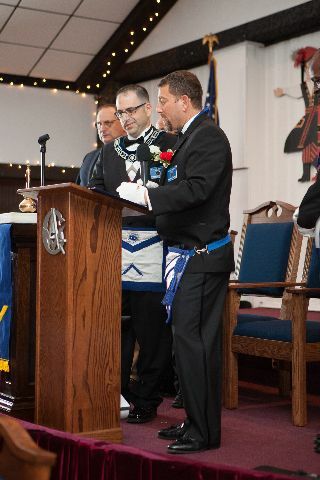 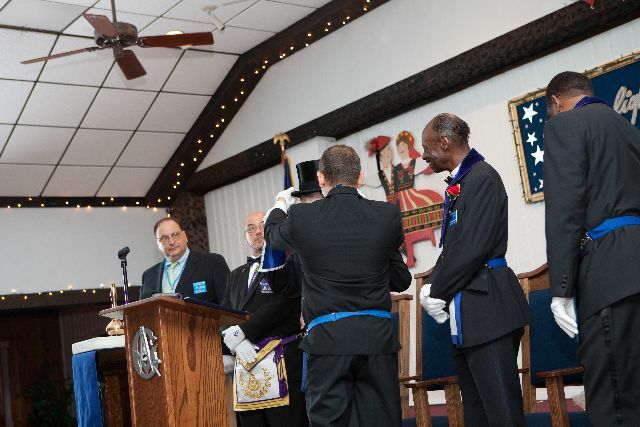 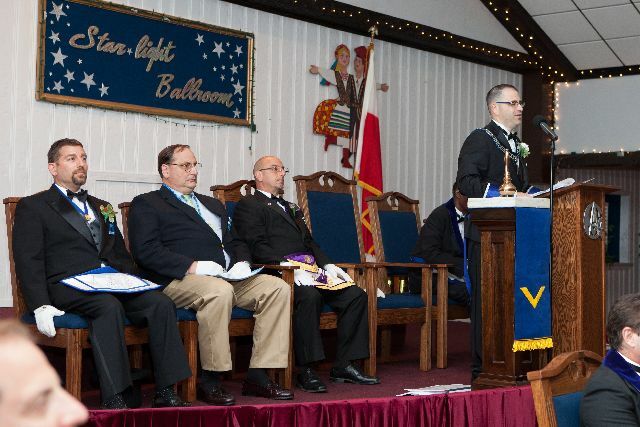 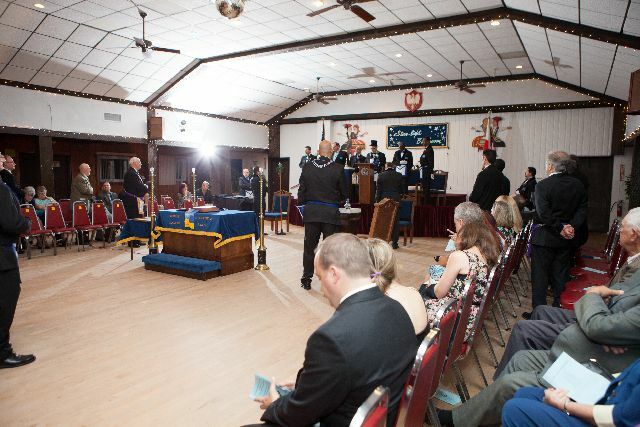 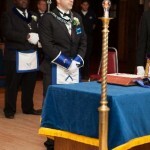 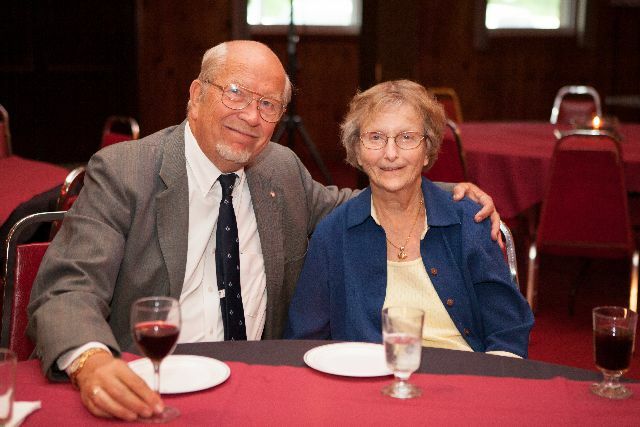 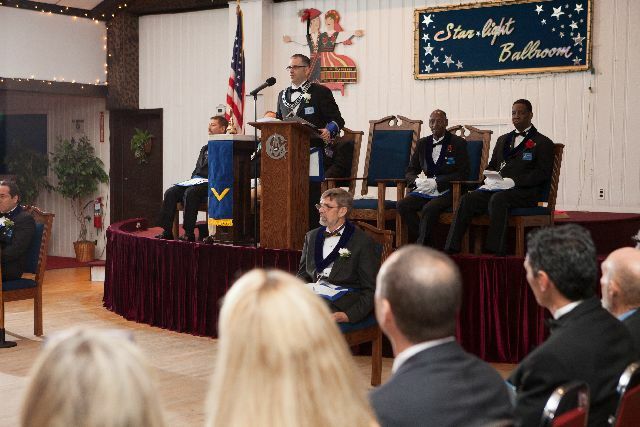 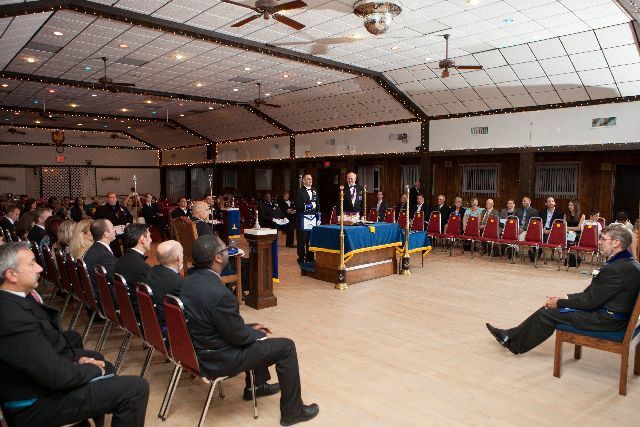 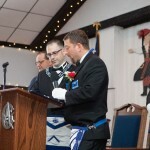 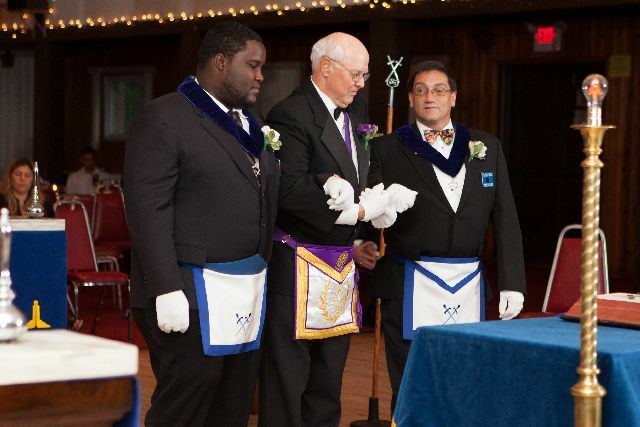 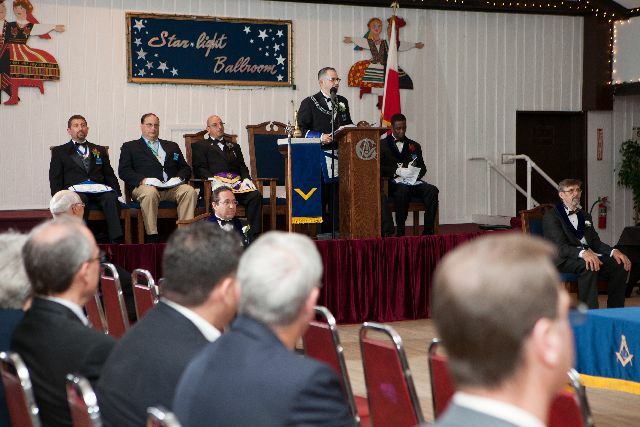 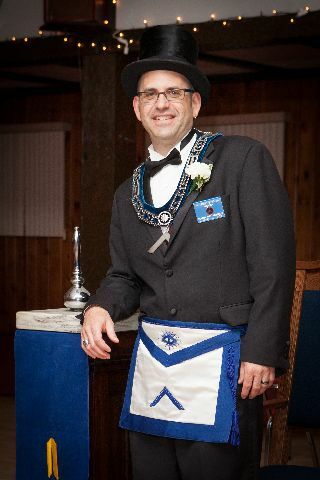 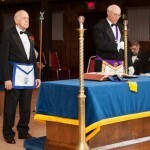 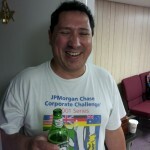 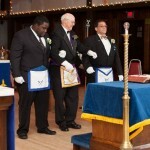 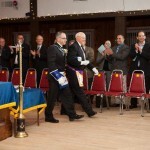 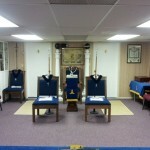 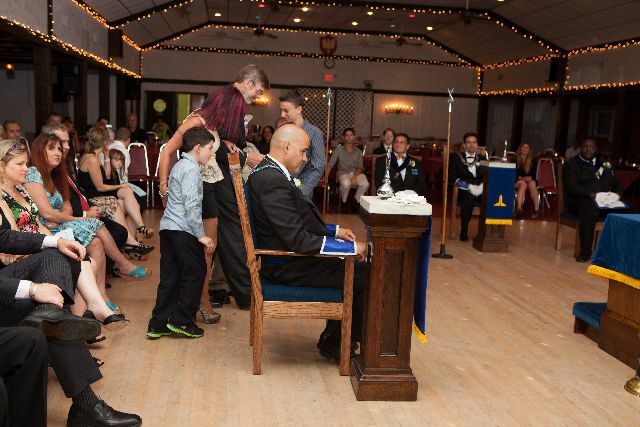 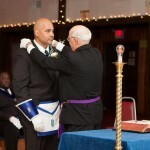 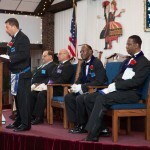 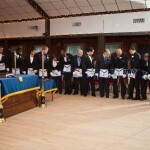 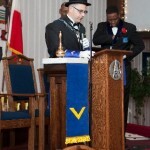 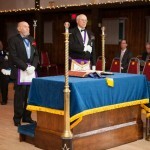 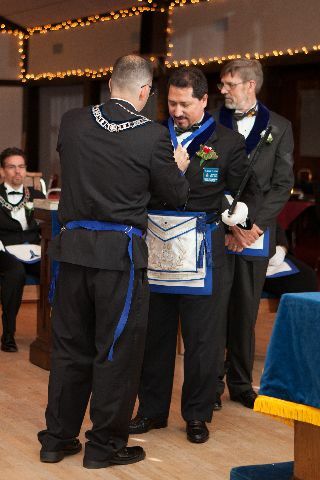 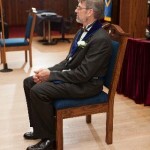 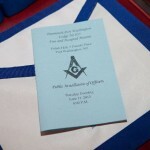 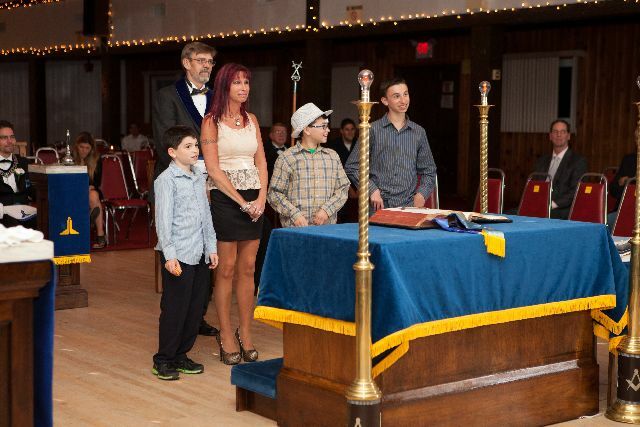 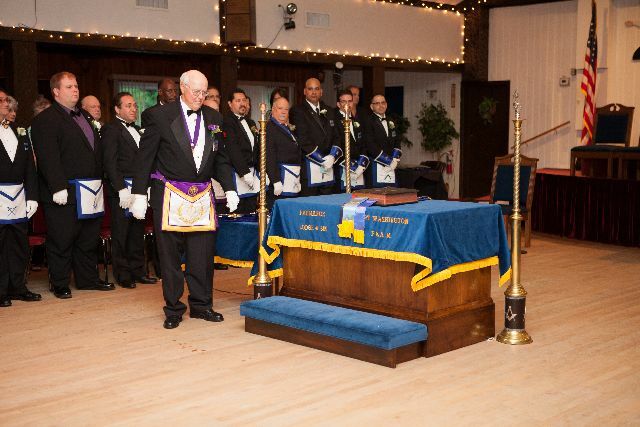 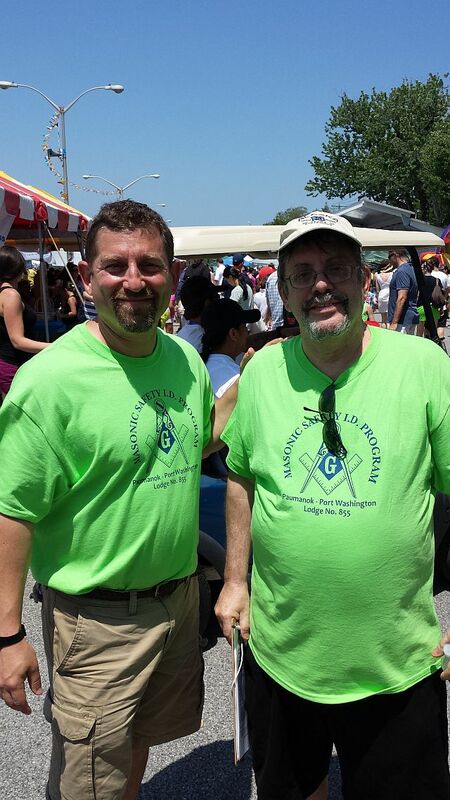 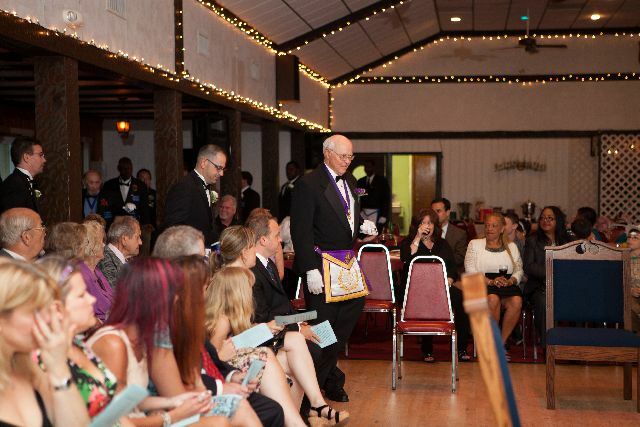 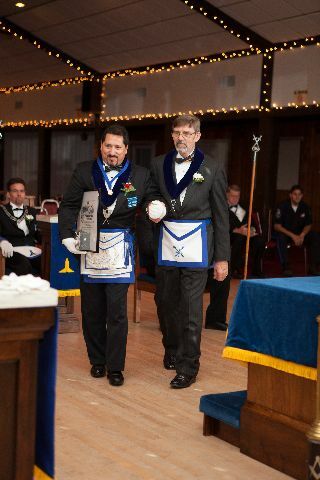 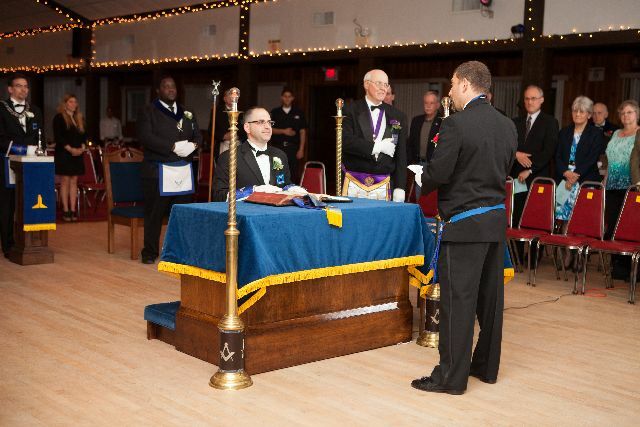 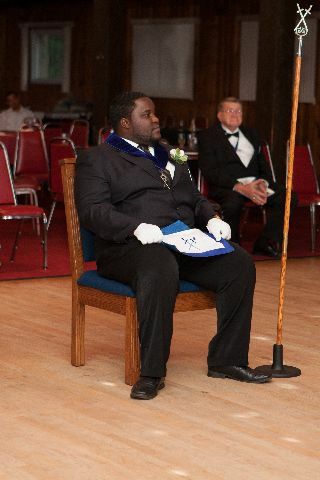 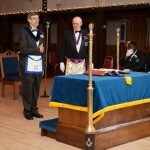 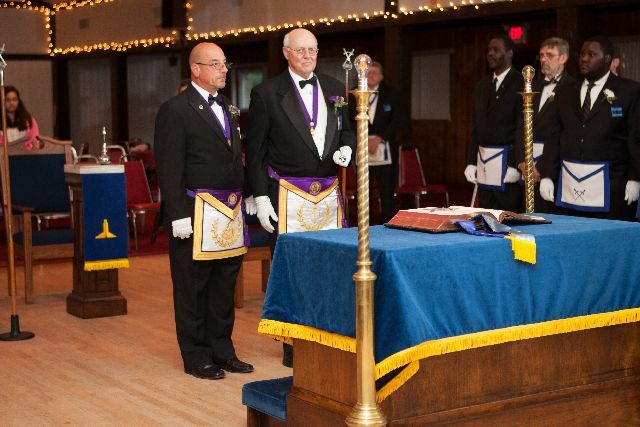 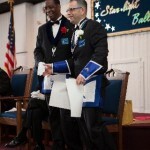 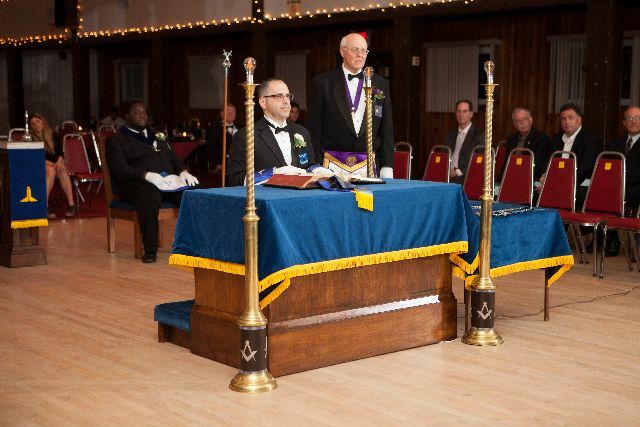 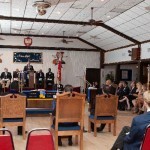 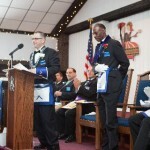 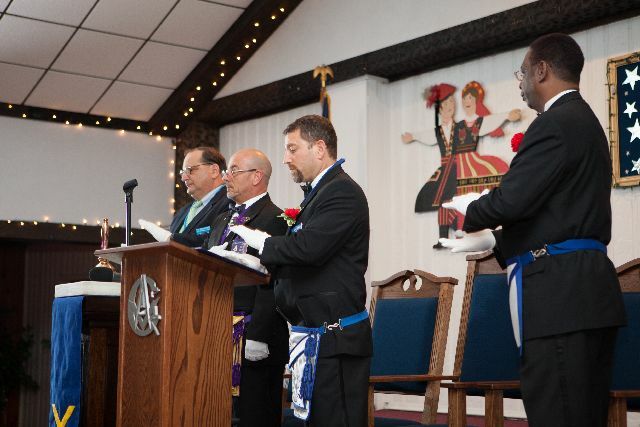 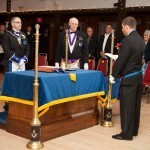 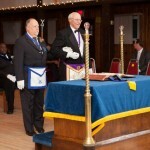 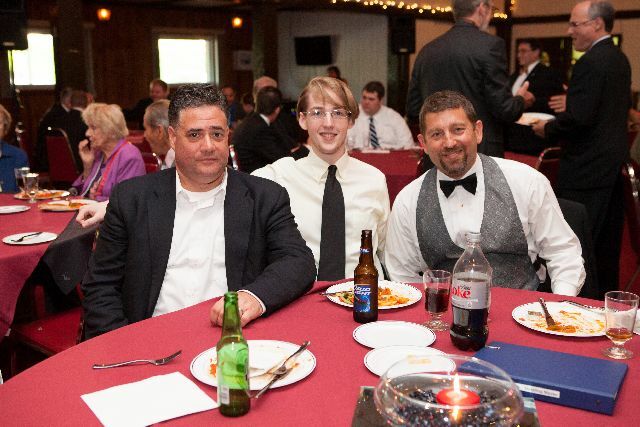 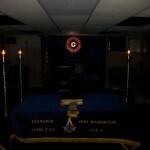 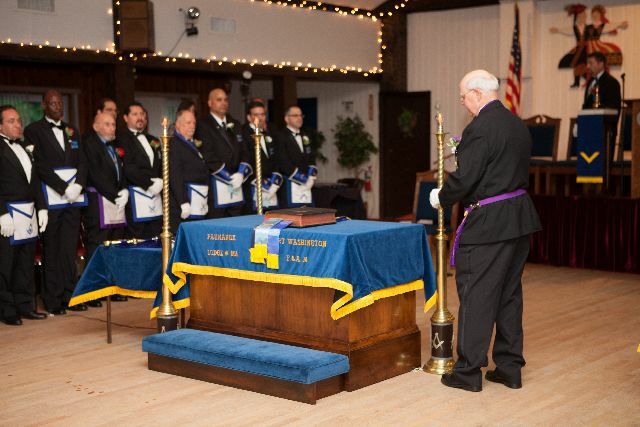 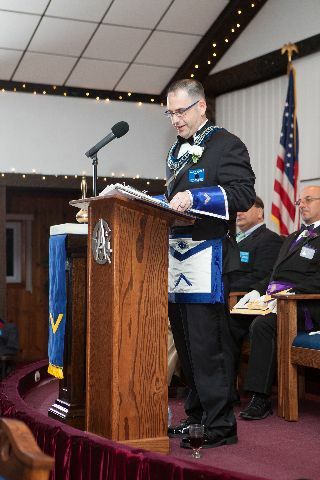 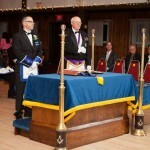 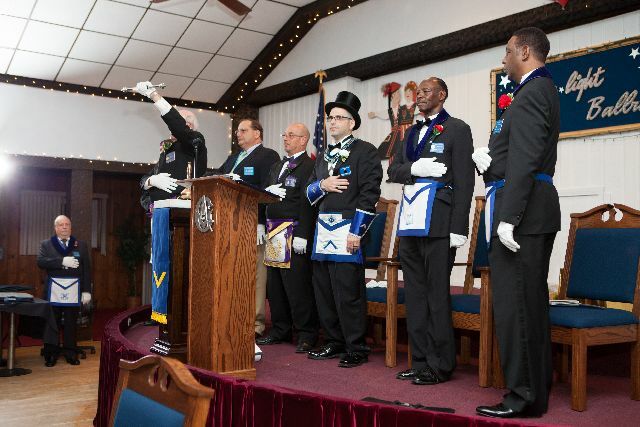 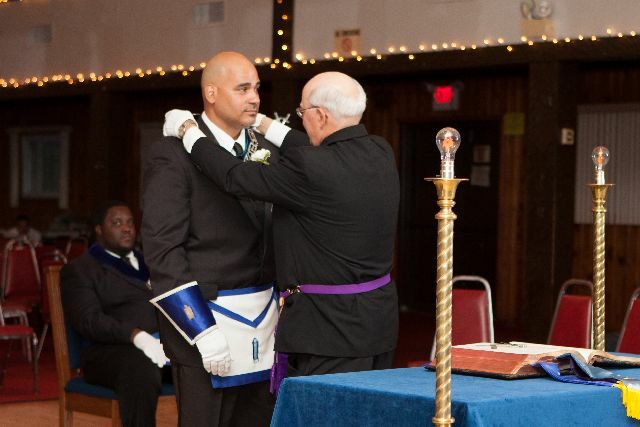 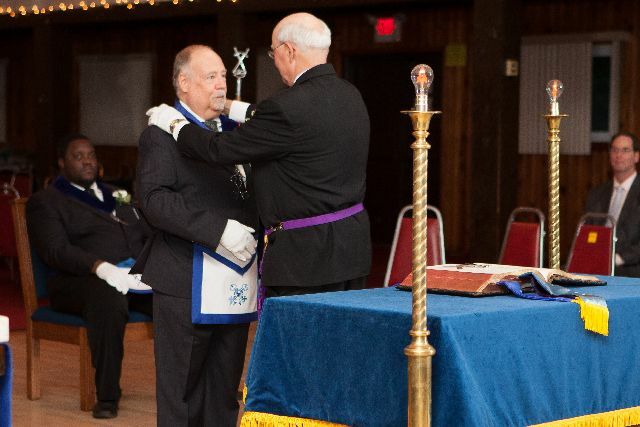 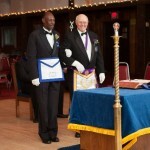 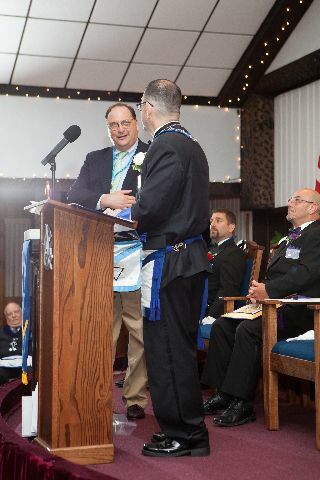 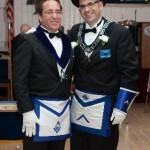 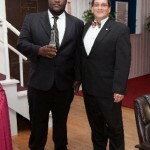 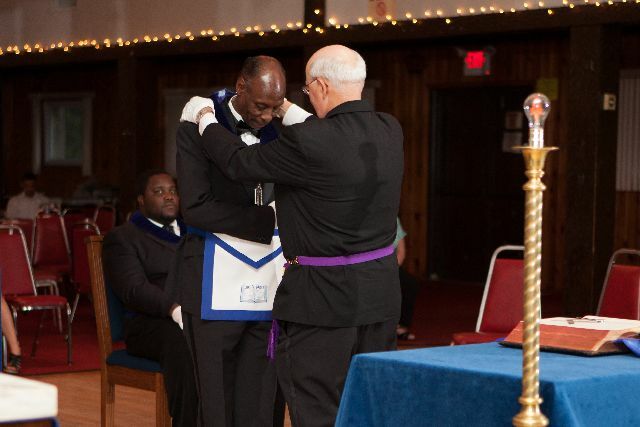 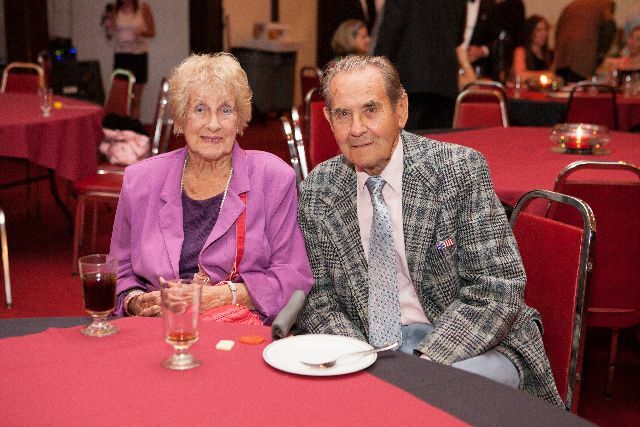 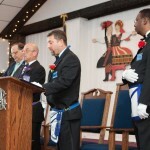 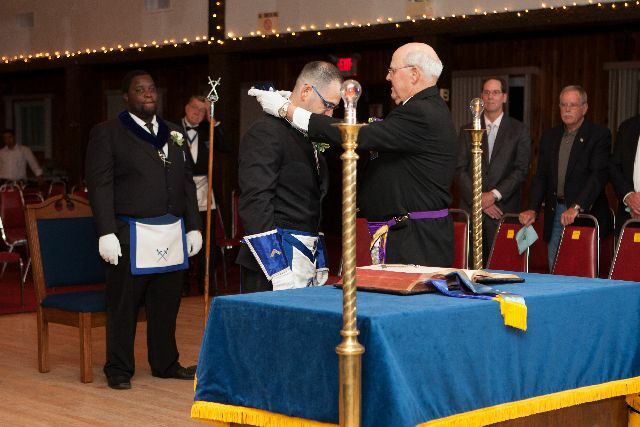 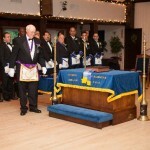 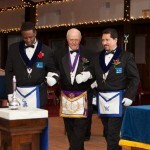 At the conclusion of the 2011-2012 masonic year, Paumanok-Port Washington Lodge No. 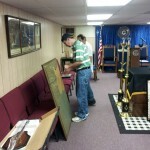 855 F. & A.M. voted to make some very necessary renovations to their new home. 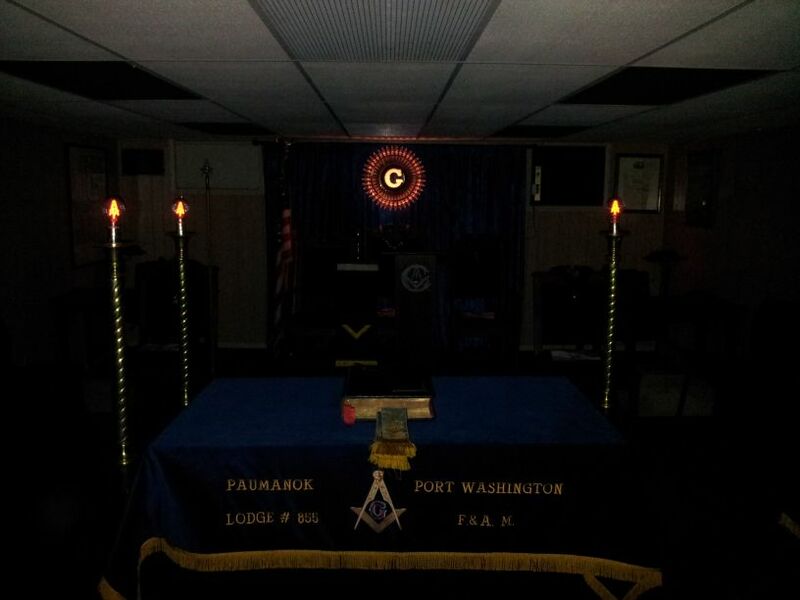 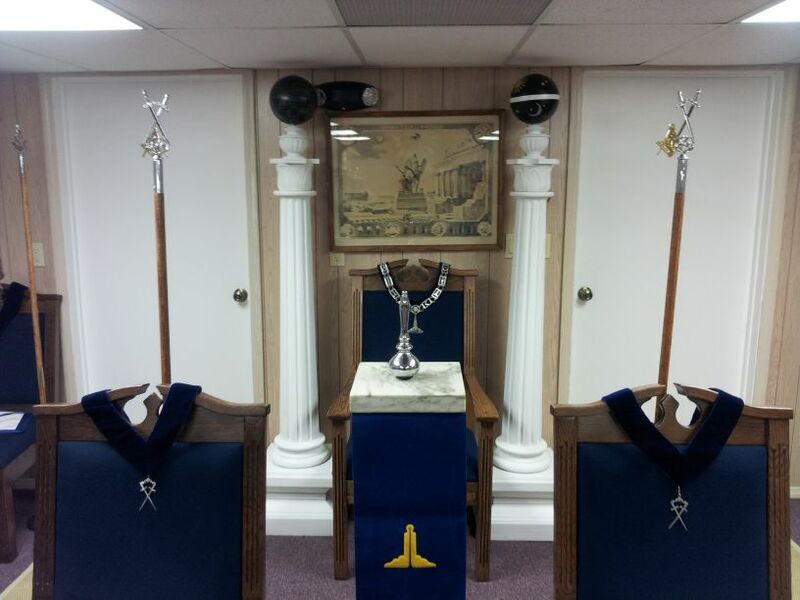 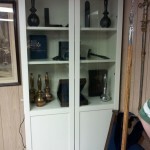 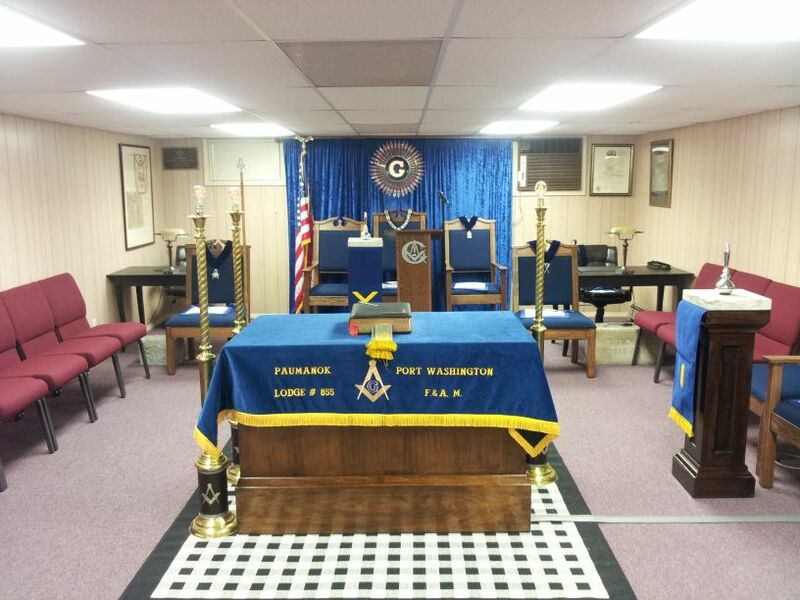 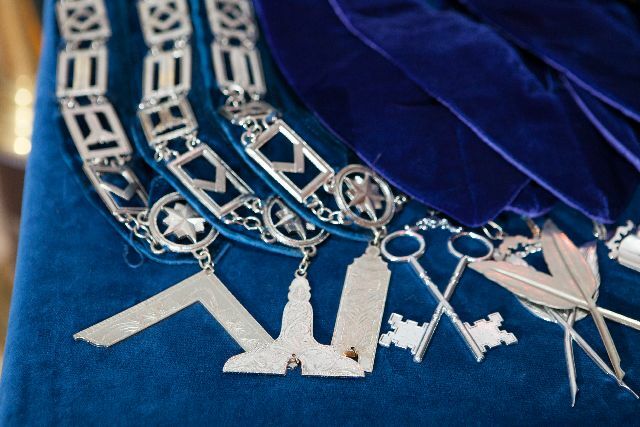 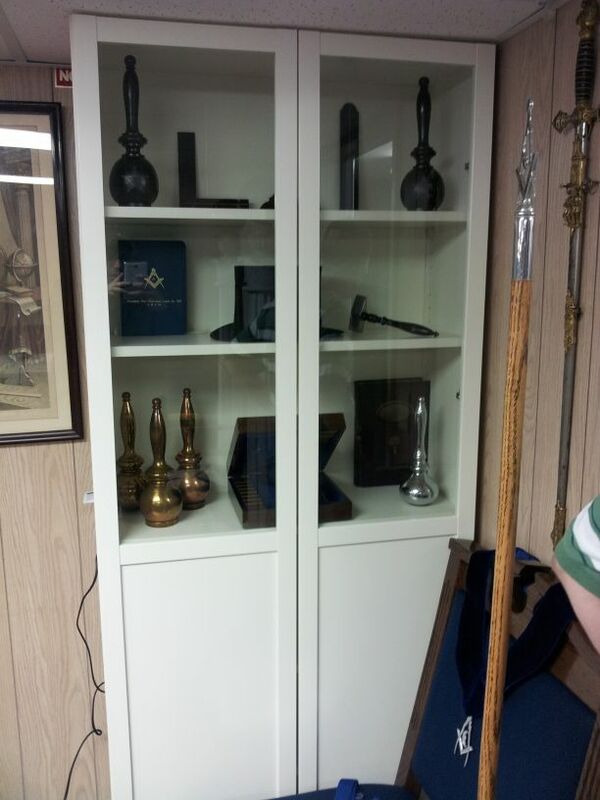 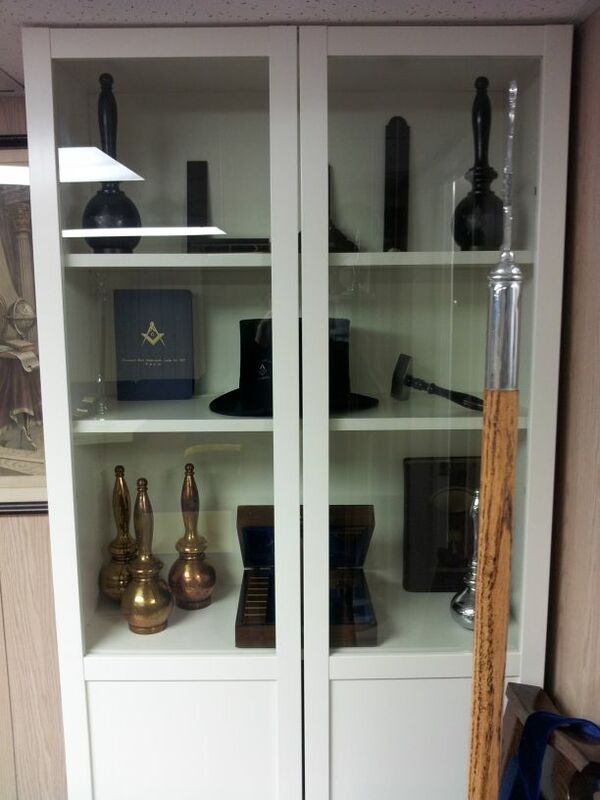 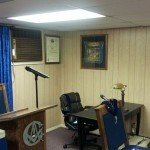 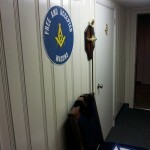 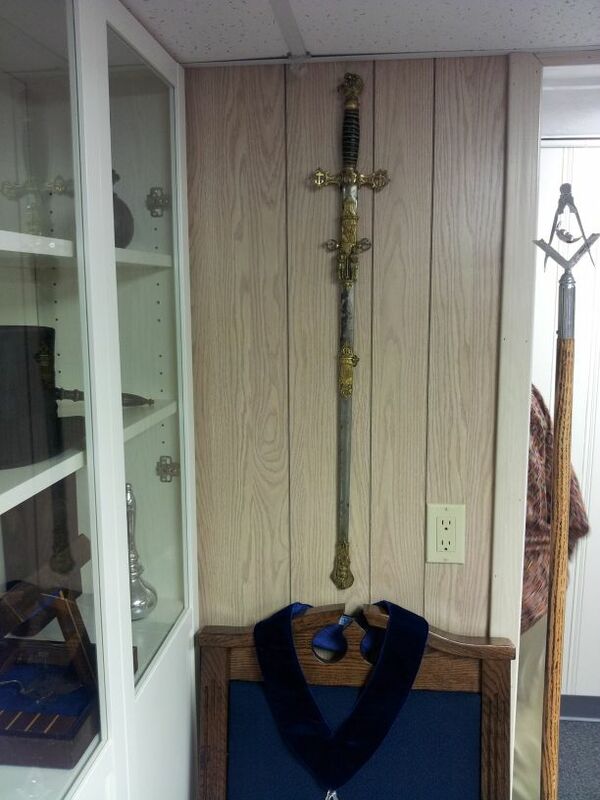 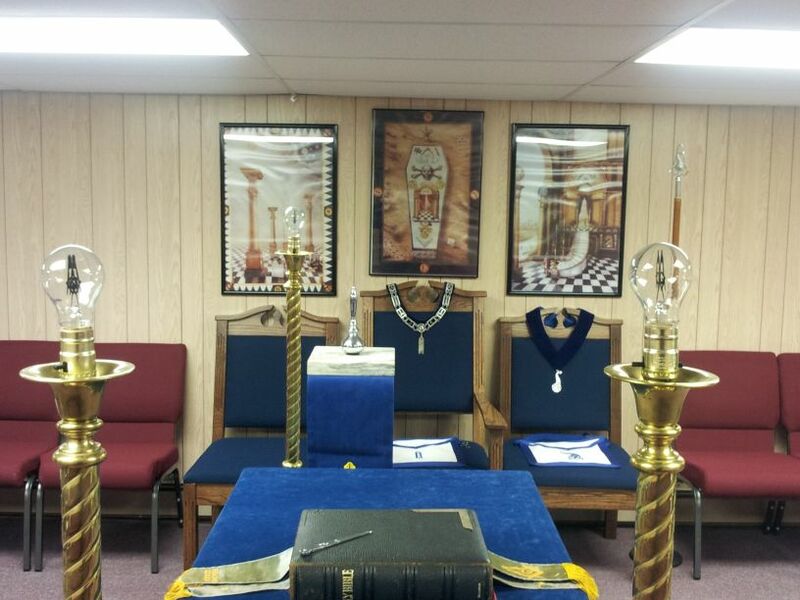 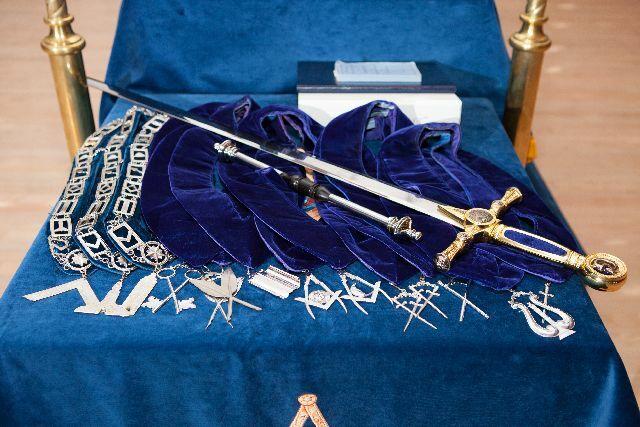 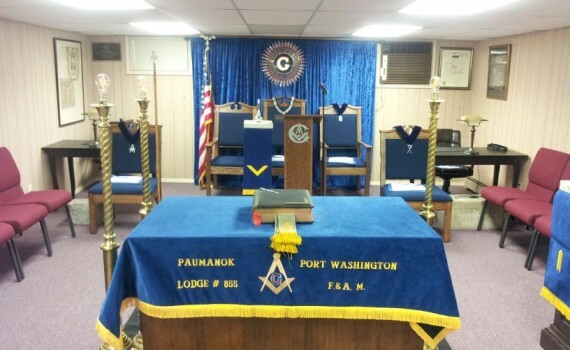 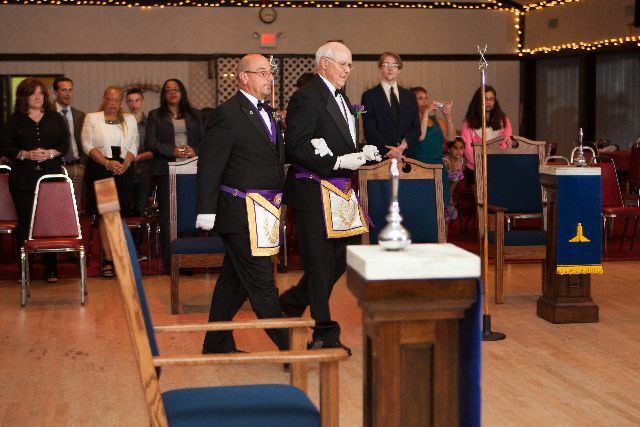 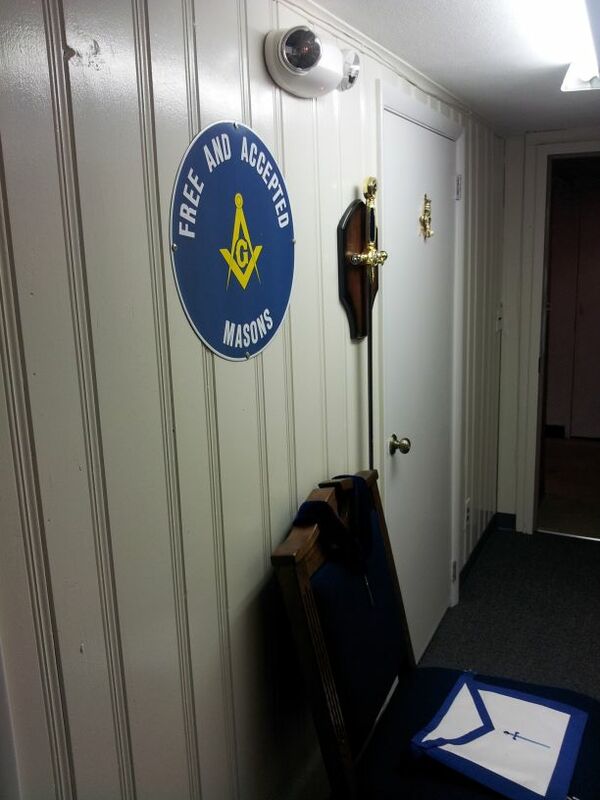 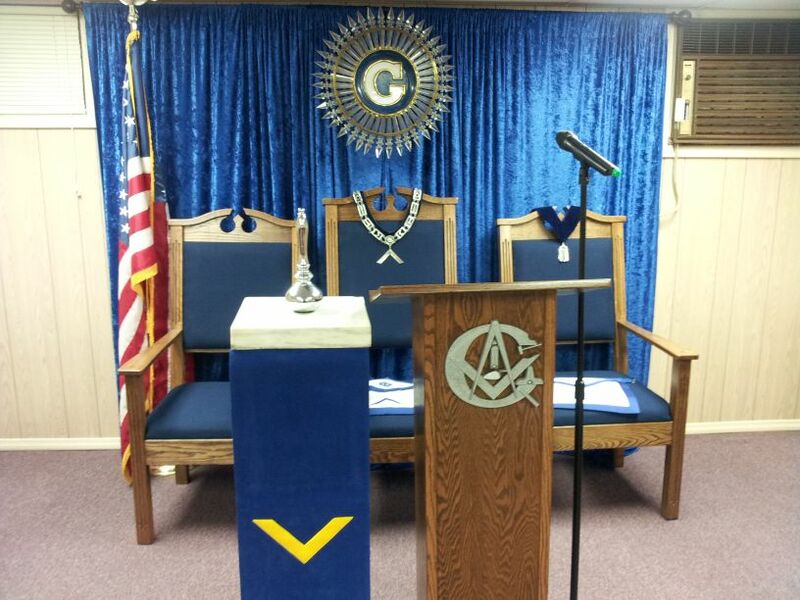 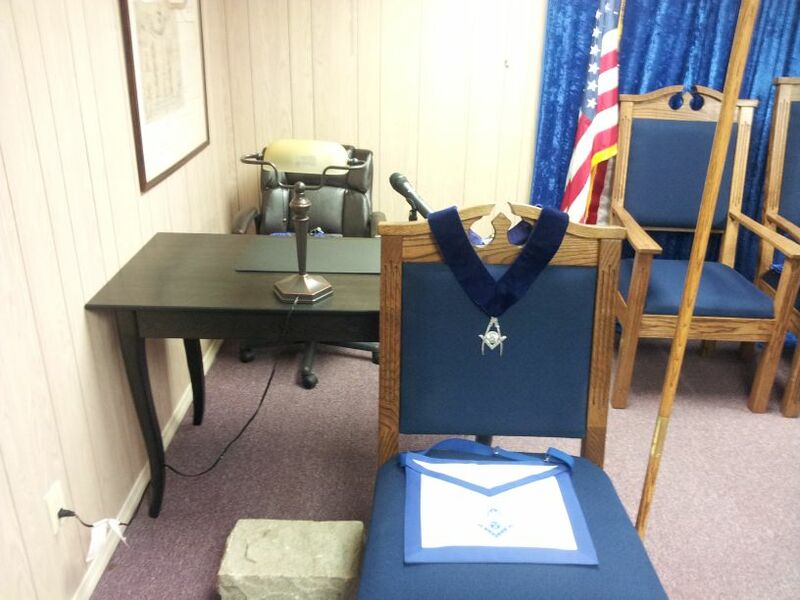 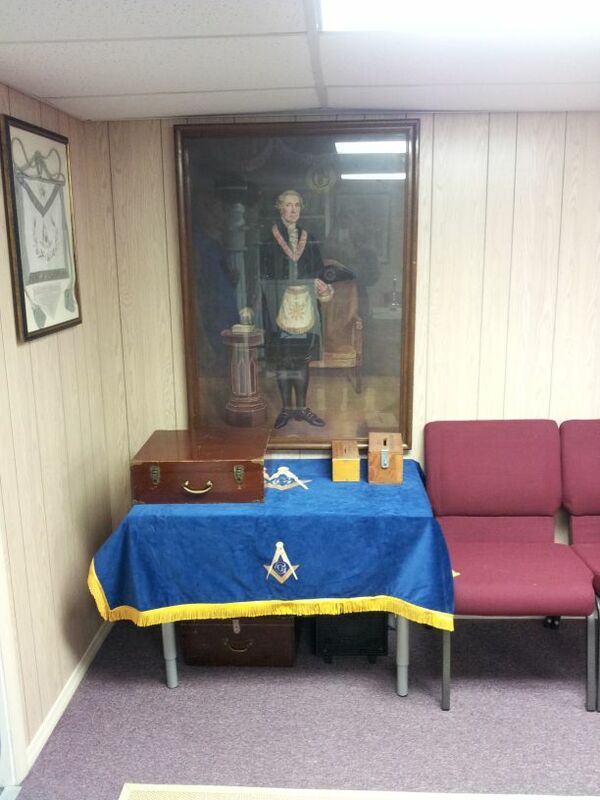 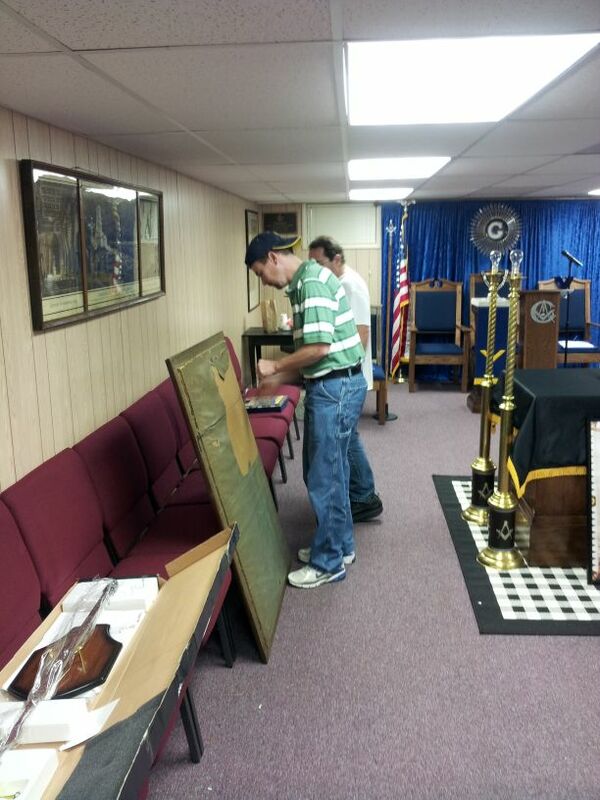 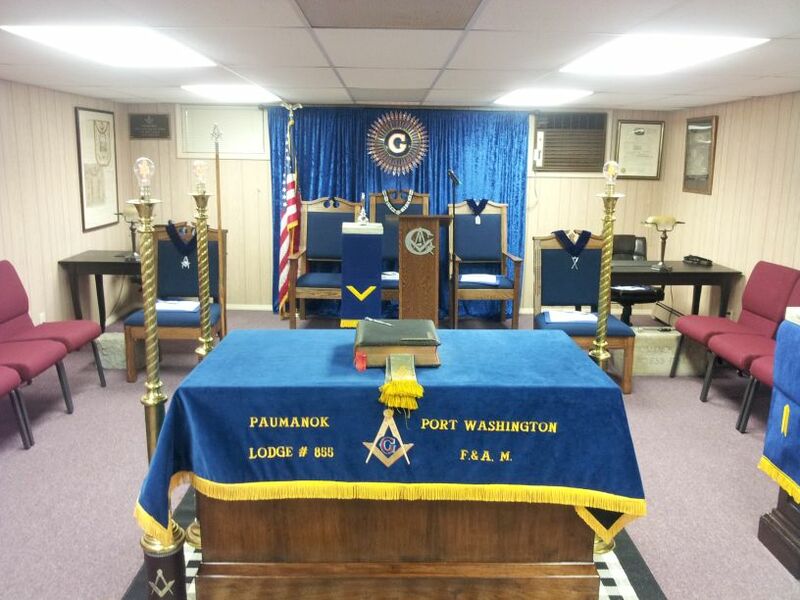 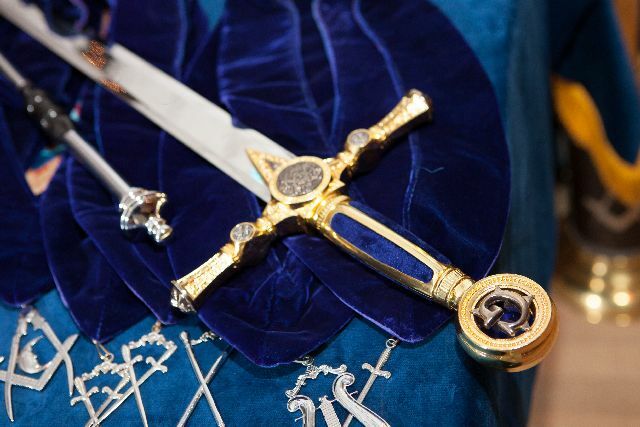 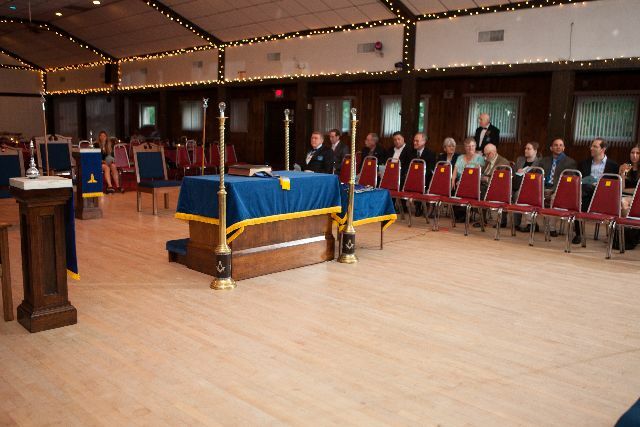 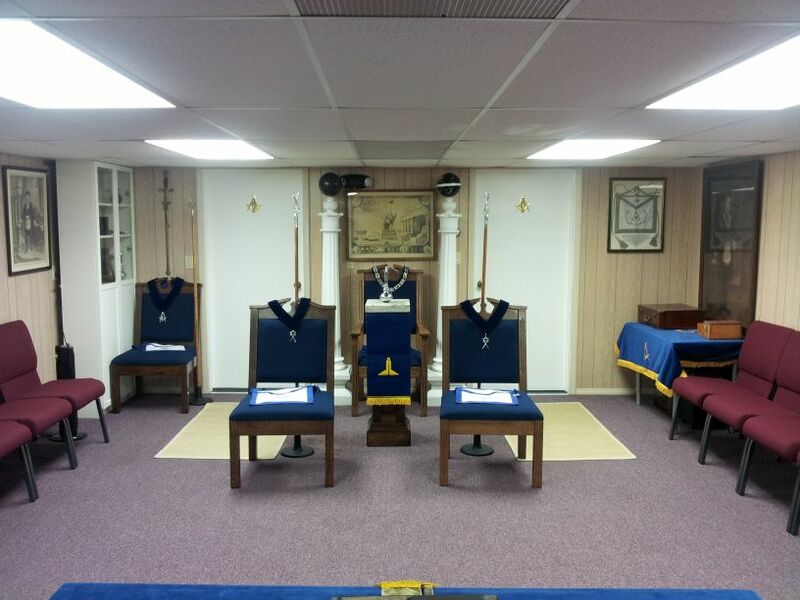 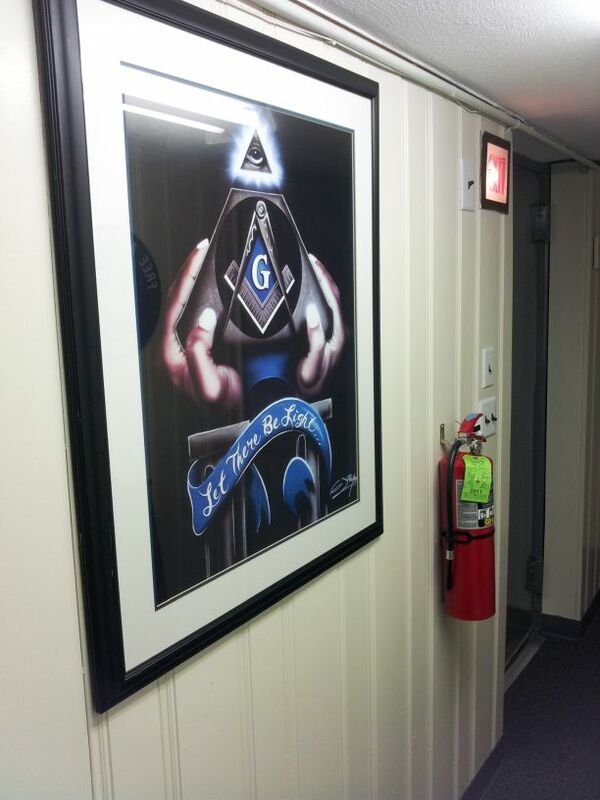 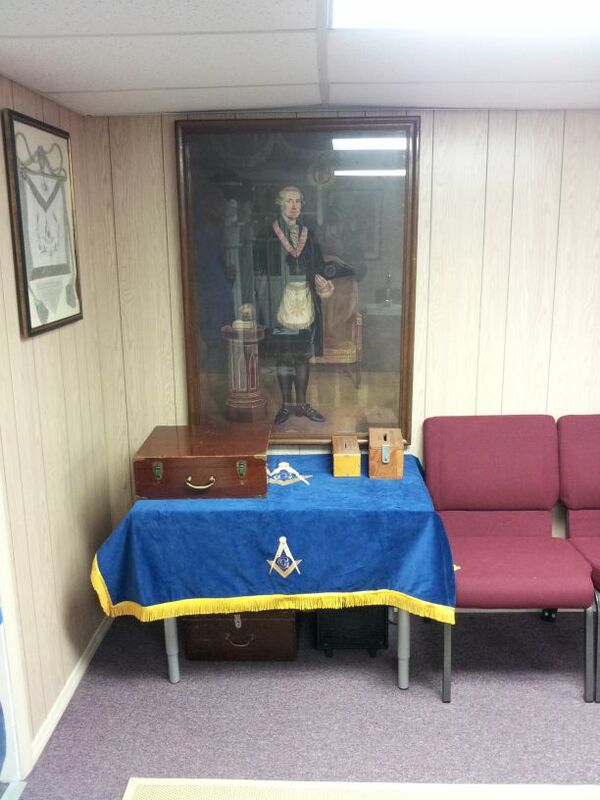 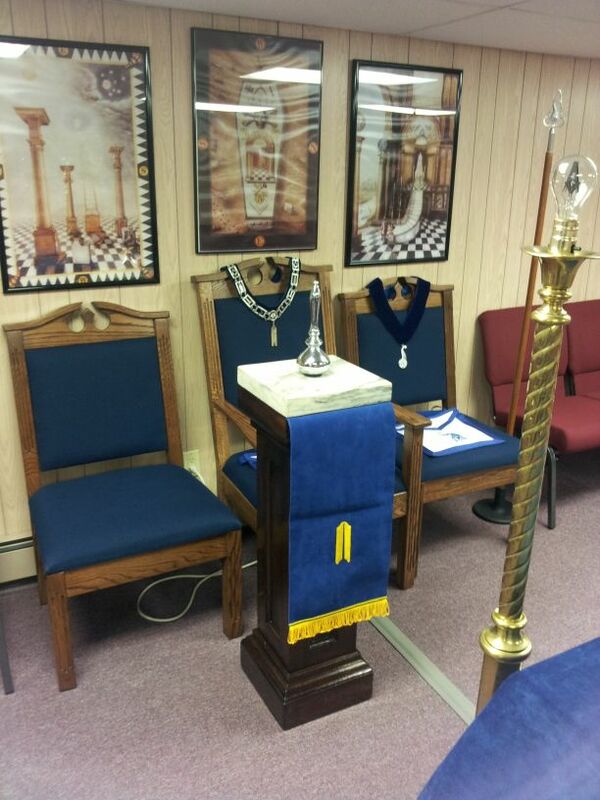 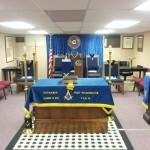 No longer meeting at the Elks Hall which was formerly a masonic lodge, the new place needed a Masonic touch. 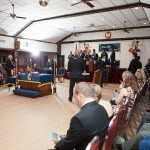 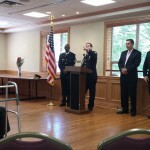 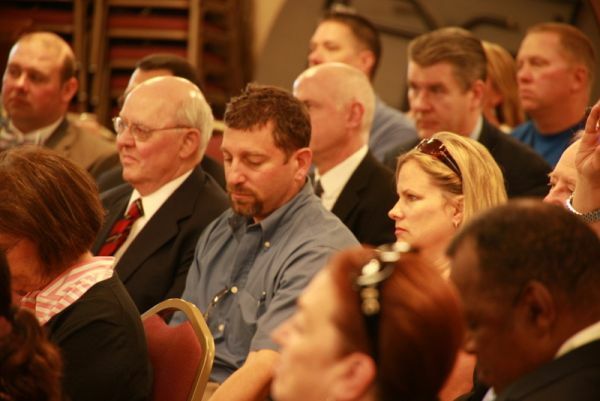 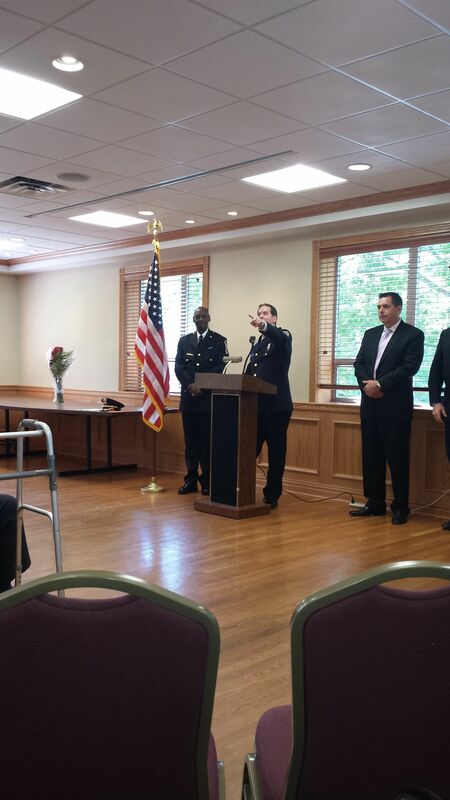 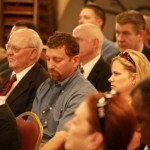 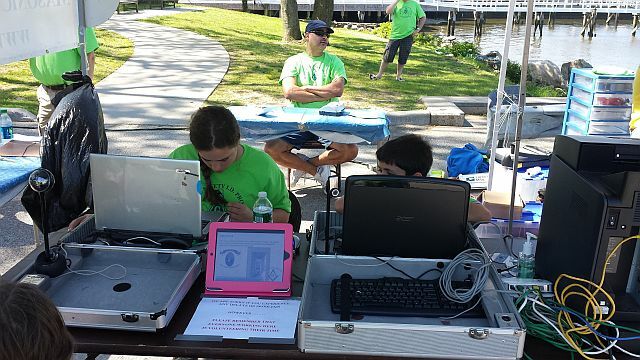 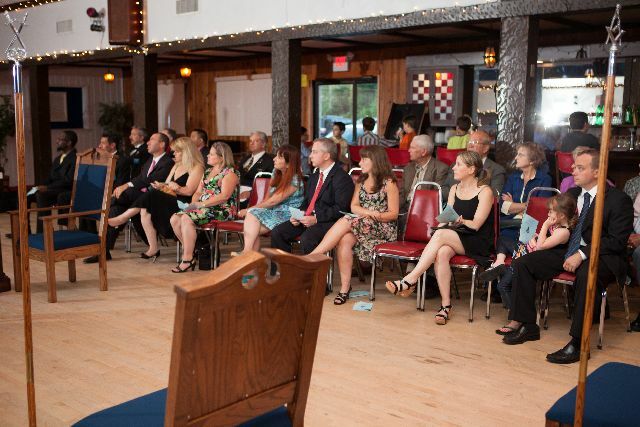 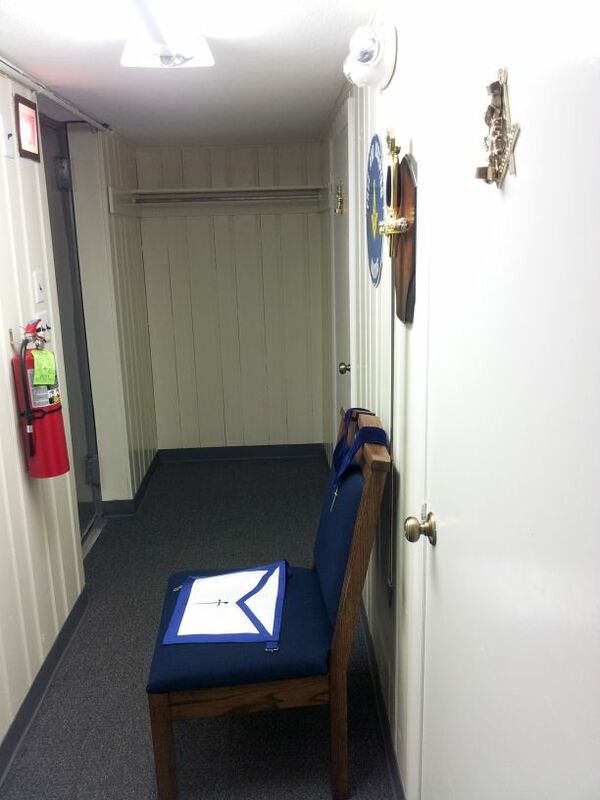 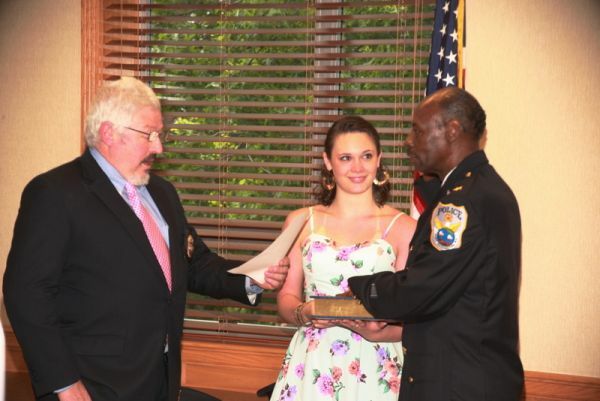 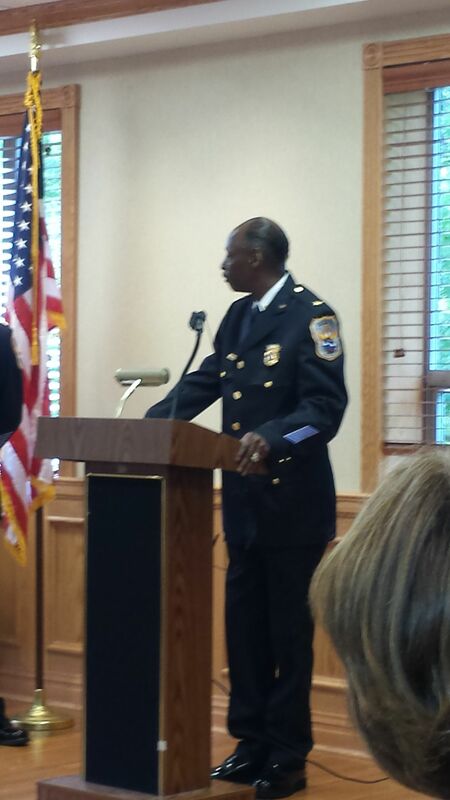 Starting with the furniture – all new officers and side-liners chairs were purchased. 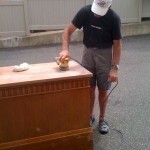 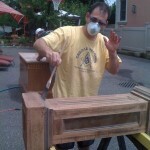 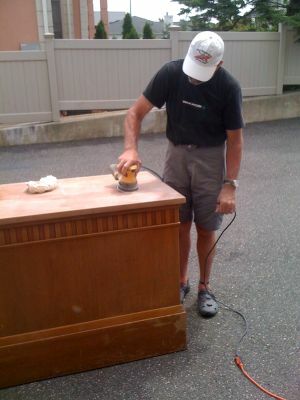 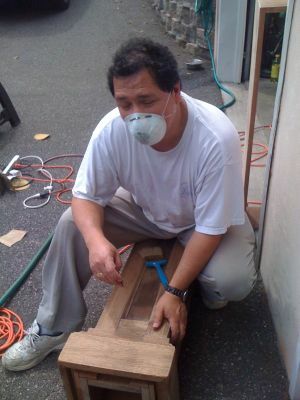 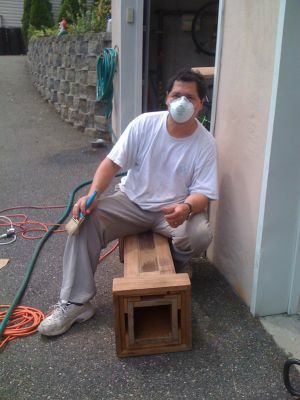 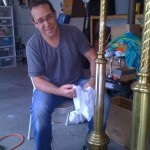 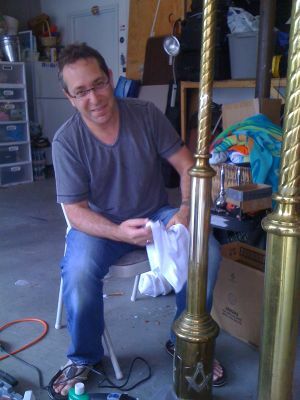 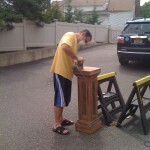 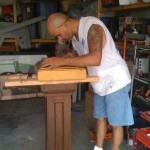 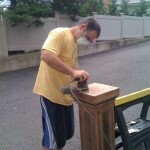 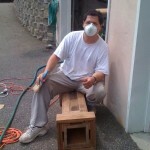 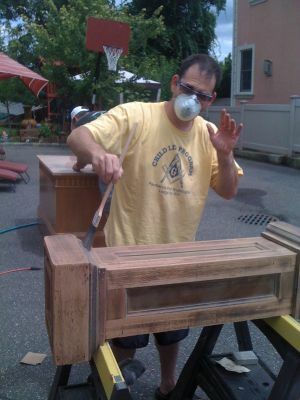 The pedestals, alter and kneelers were sanded bare, stained and given a healthy coating of polyurethane. 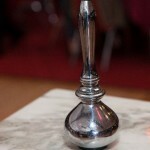 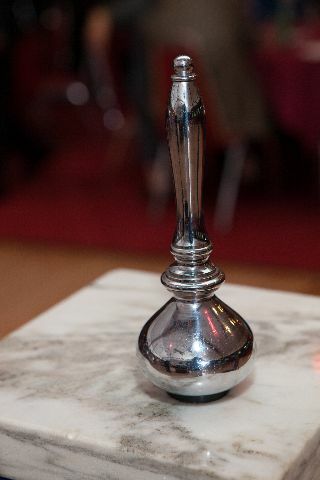 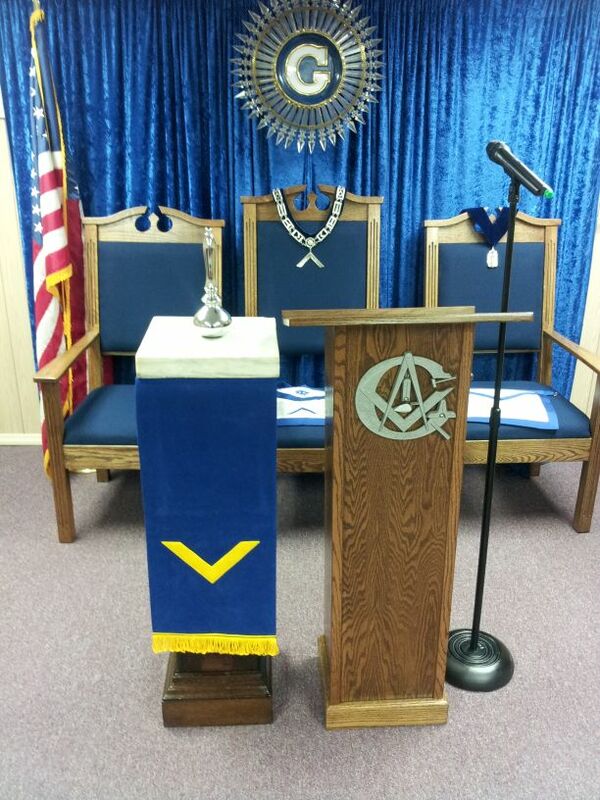 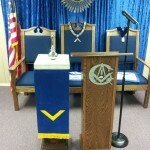 A new lectern was purchased for the East as well as desks and chairs for the Treasurer and Secretary. 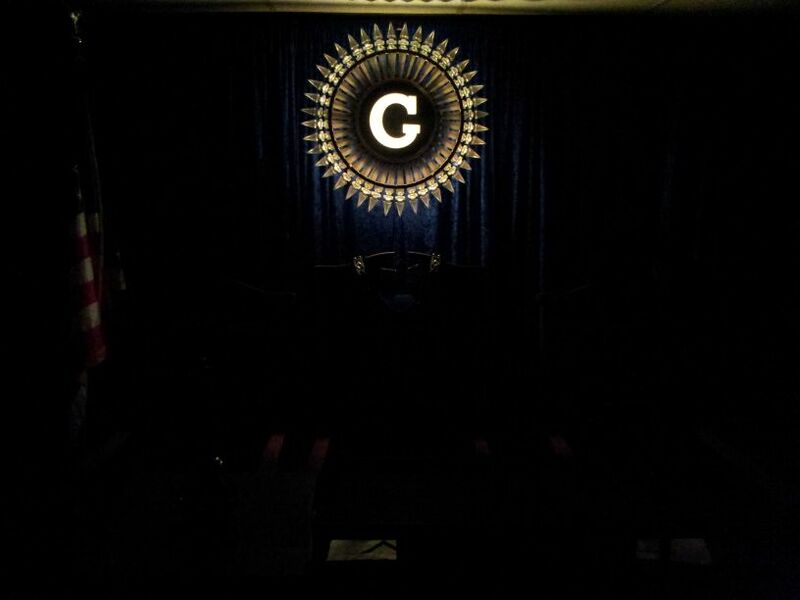 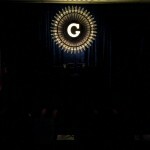 The East was adorned with new drapes and a cleaned and polished illuminated “G”. 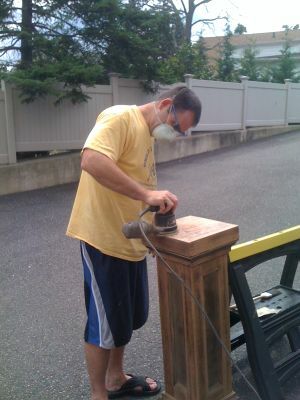 In the West sits freshly painted columns with new globes. 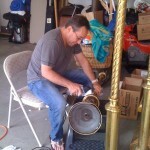 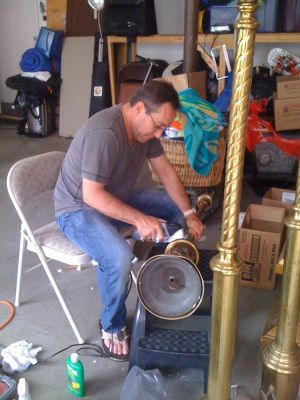 The 3 tapirs were polished, rewired, and wrapped with leather at the base. 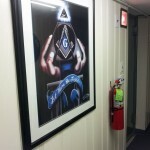 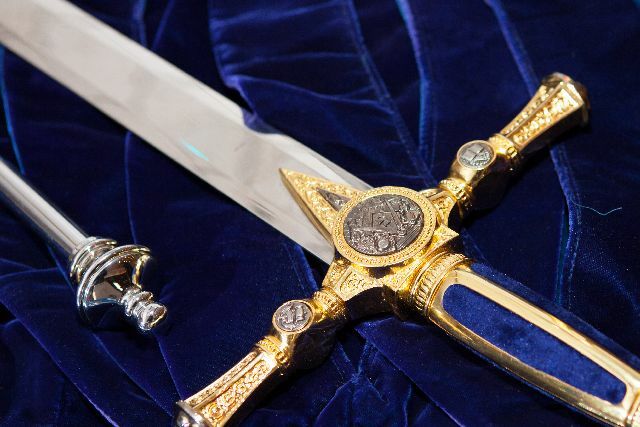 New and old paintings and prints were hung around the room, a new Tyler’s sword hands in the hallway along with more Masonic imagery. 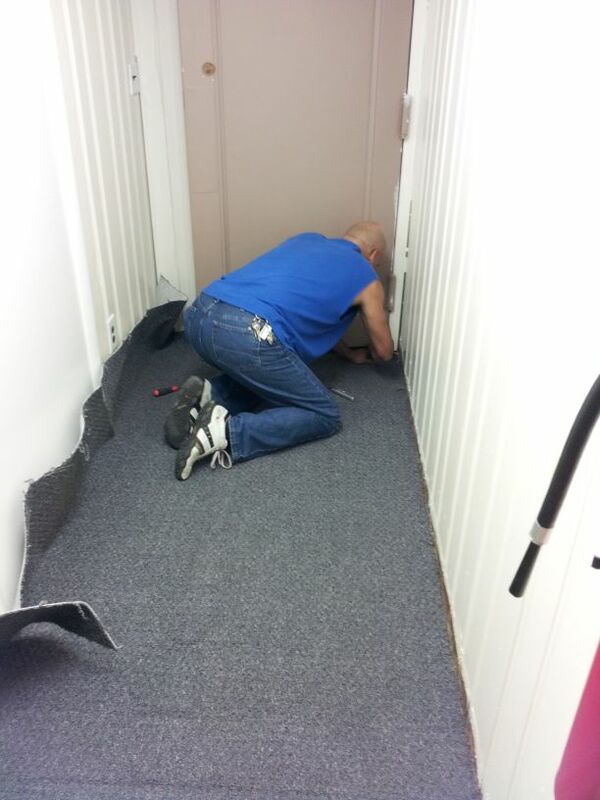 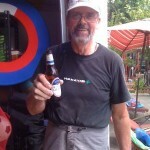 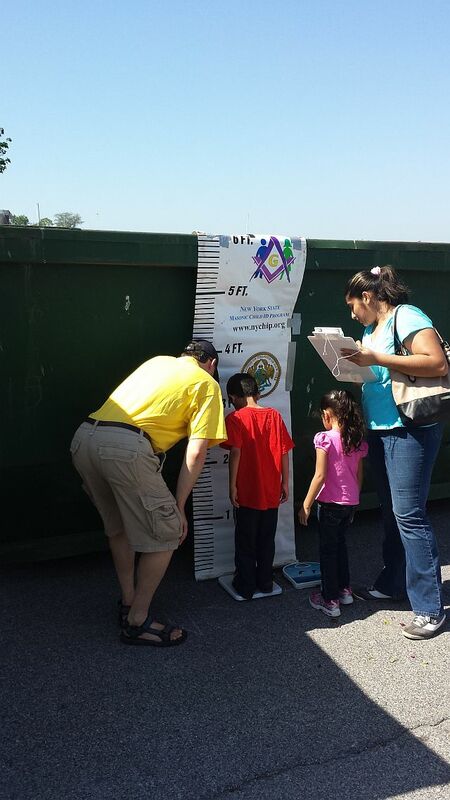 The list of improvements goes on and on and have to be beheld in person. 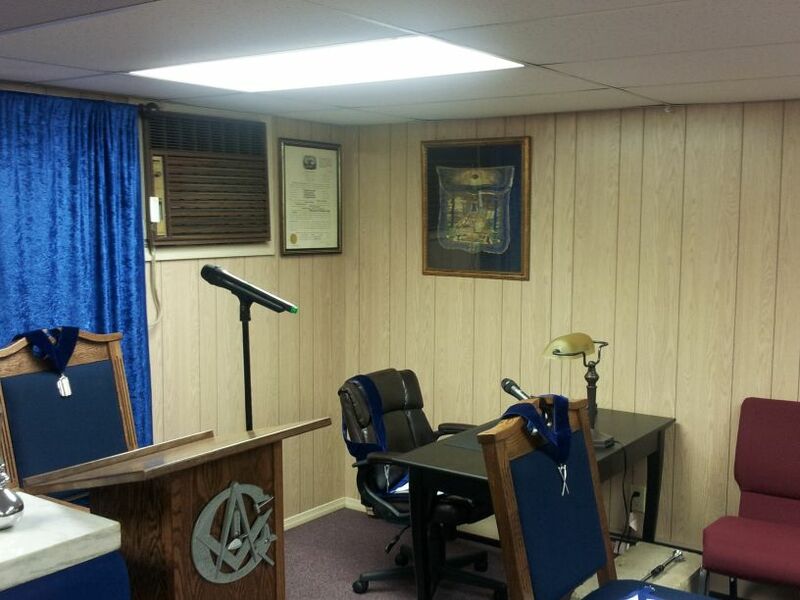 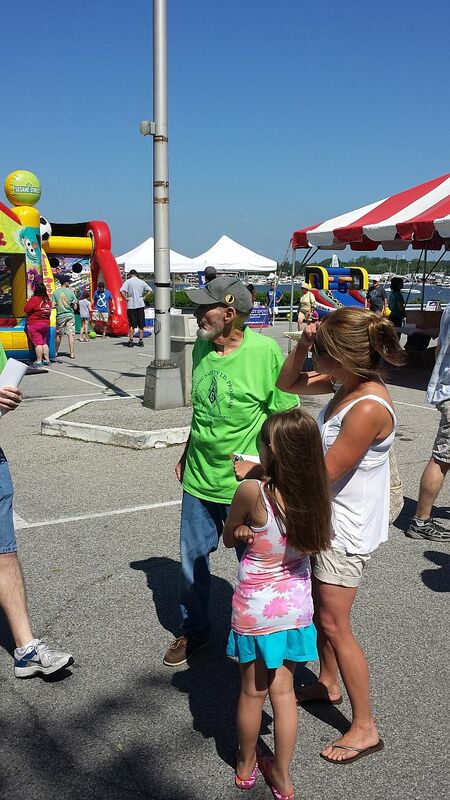 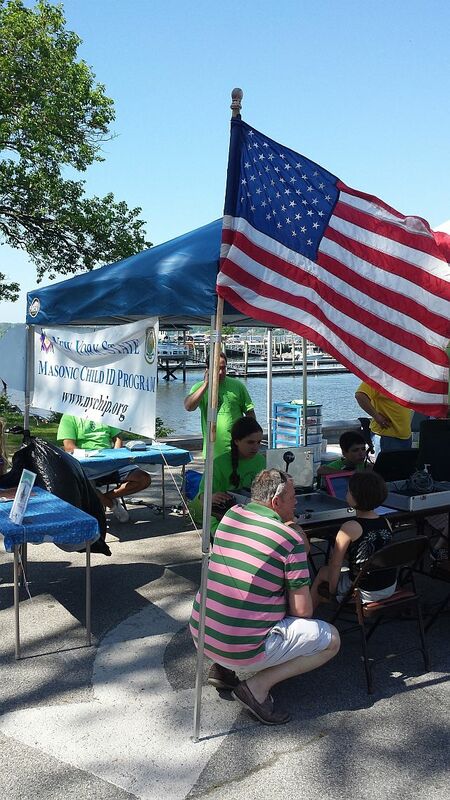 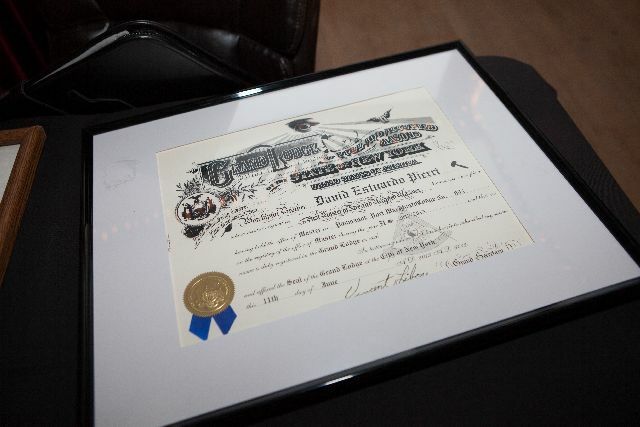 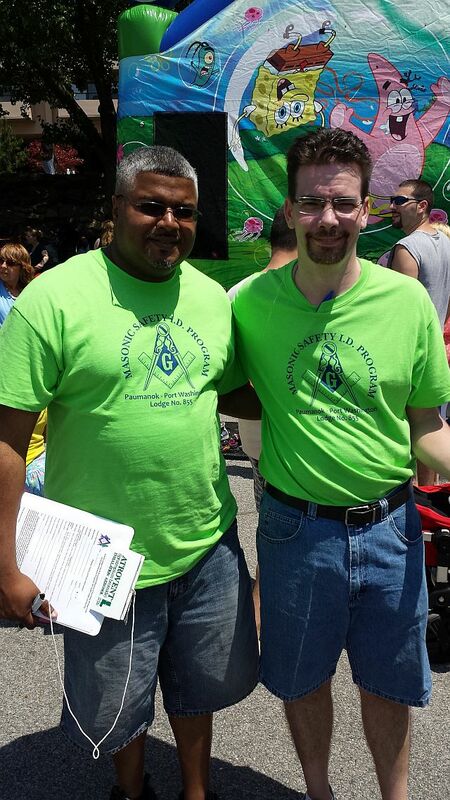 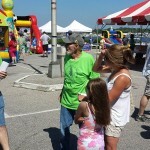 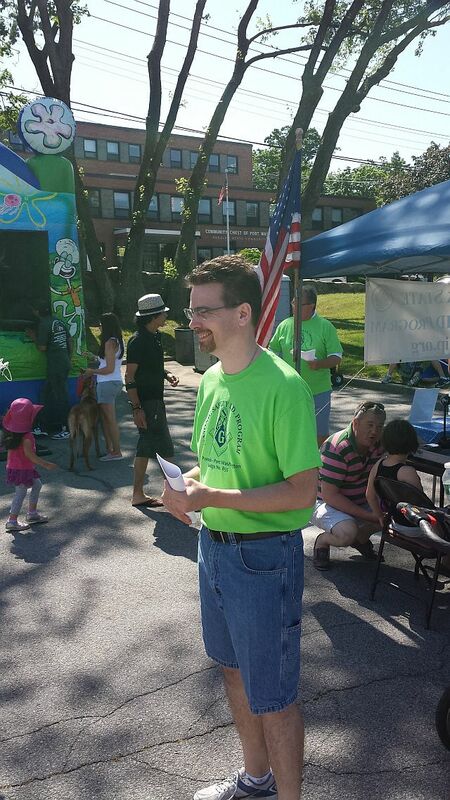 The best part of this project was that all improvements were done at the hands of the lodge brothers and families. 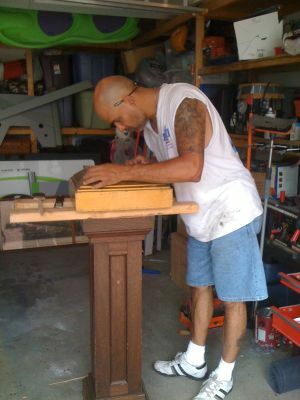 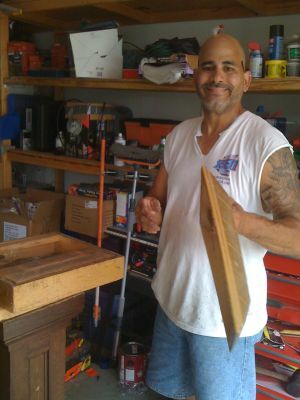 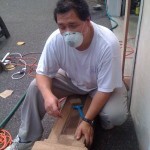 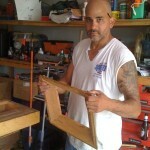 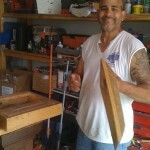 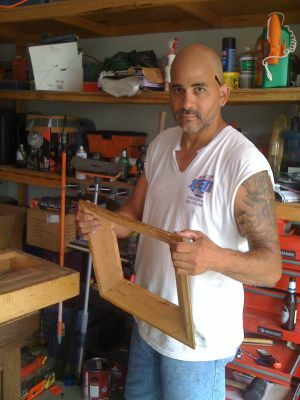 No outsiders were hired to do any of the carpentry.